Enter your name and email to be notified of new posts! 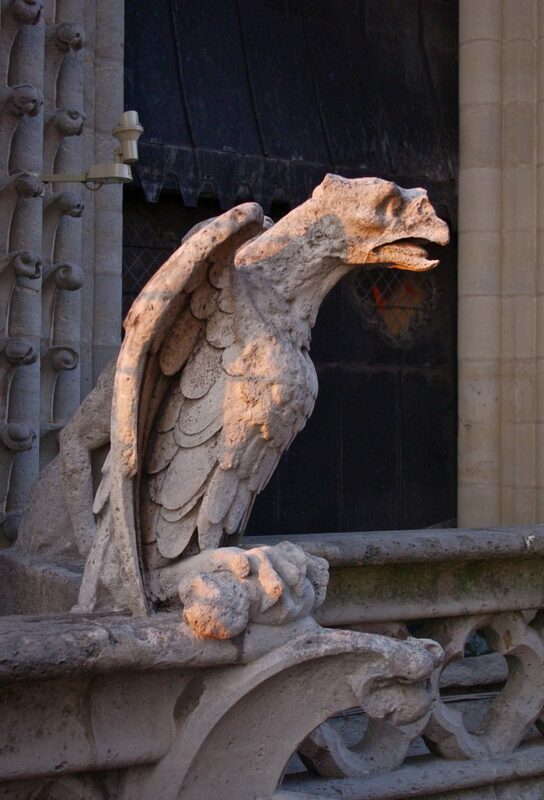 I began scrolling back through the photos on my computer to look for Notre-Dame. I knew there were going to be a bunch, but I was almost surprised at how many. Actually, I began laughing when more and more appeared. It seems that I not only spend a lot of time walking by Notre-Dame whenever I’m in Paris, but that I take a few photos each time, too. Then I dug through my old photo albums, the thick and heavy ones I somehow managed to cart back from France after my junior year abroad. Page by page I searched through the photos and it seems that this habit is nothing new; it appears that I took a photo nearly every time I passed by Notre-Dame back then, too. 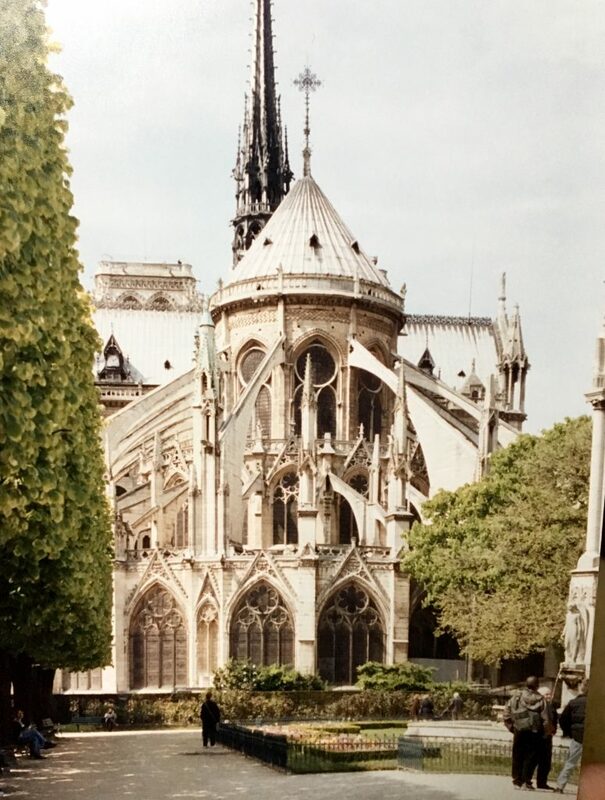 I might have 100 photos of the cathedral from at least a dozen trips to Paris, between the years 2000 to 2019. 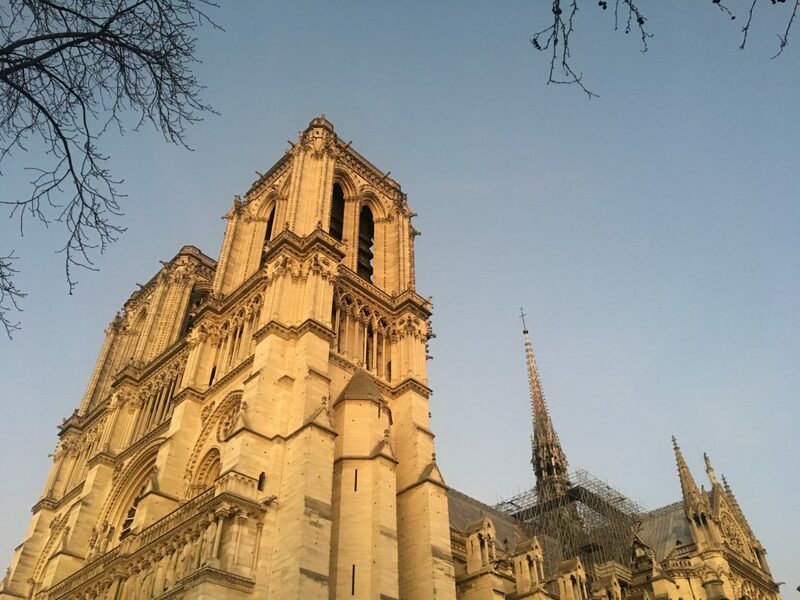 Readers here have probably noticed how much I love Paris, but I’m not sure if I’ve ever mentioned that it all starts with Notre-Dame. When it was time to pick a language in 7th grade, I listed French as my first choice, and I got into the class. I can’t remember exactly why I wanted to learn French, and not Spanish or German, only that I was certain that it was my top choice. I remember that hanging on the wall in the classroom was a poster of Notre-Dame, and sometimes during class I’d stare at it. In fact, that poster might have been the best thing about 7th (and 8th) grade French class; learning French was hard. Really hard. But I continued with it through three years of high school, quitting after my junior year and vowing that I’d never study the language again. I’d put in my time, I’d tried, but understanding French eluded me. What did pique my interest in those days was art and art history. I took drawing and painting and photography and I wasn’t very good at any of them (I think I got better at photography later), but I realized that one of my favorite parts of art class were the days when we had art history lessons. 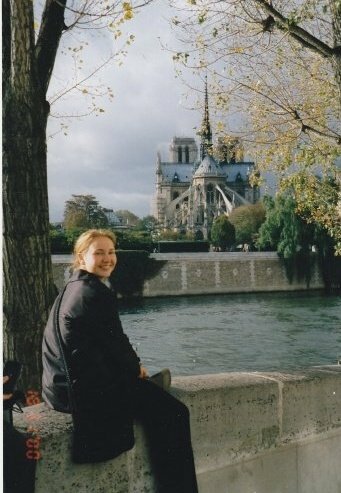 During my junior year I also took a Humanities course, and I chose to write about Notre-Dame for one of our papers (I also got to ponder the meaning of life through a paper on Siddhartha, analyzed the lyrics of Eleanor Rigby, and delivered a persuasive speech from the point of view of Scarlett O’Hara. That was a great class). When I got to college I had to take one language class, and I tested into an intermediate level French course. Recalling my middle school and high school misery, I poured every bit of effort I had into that class, not wanting French to be the downfall of my college years. Spending that year abroad was one of the best decisions I’ve ever made. It was both wonderful and really tough. Sometimes I hear of my peers’ experiences in study abroad programs around that time, and they often involve tales of communal apartment living and lots of alcohol and late nights and a generally carefree life. My program, on the other hand, was rigorous. 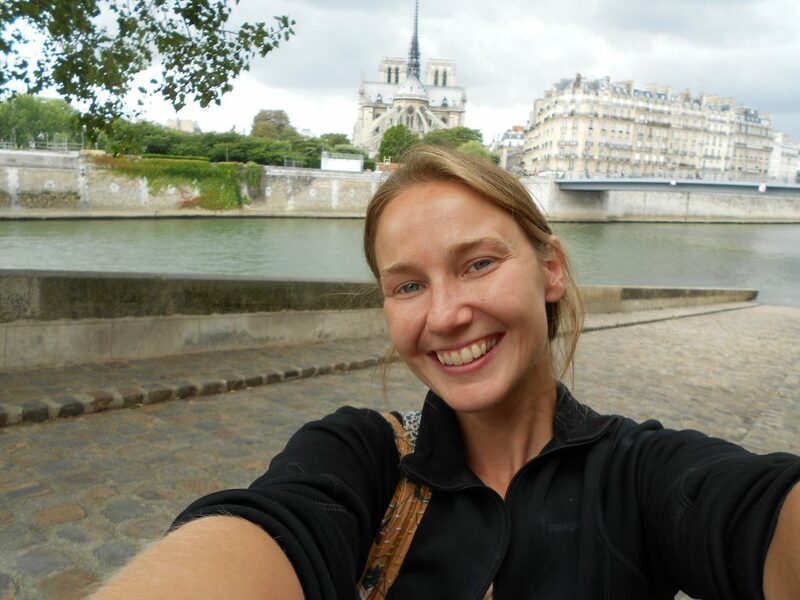 The philosophy was for students to become immersed in French culture and life. During that year, I often felt that the expectation was for me to ‘become French’, and I struggled with this quite a bit. I lived with a host family and took third-year level art history courses at a French university, with French students. Even when around my American peers in the program, we were strongly encouraged to speak in French, and our wonderful director could be very stern if he heard us speaking English. My French wasn’t great when I arrived in Toulouse, and it was a shock to be whisked away by my host family and only understand about a third of what was going on at any given time. Much of the first few months of life in France were like that, and rather than becoming French, I think I spent a lot of time thinking about what it meant to be American, and missing my family back home. But even though these first few months were difficult, there were these amazing moments sprinkled throughout, probably several amazing moments every day that made the challenge worth it. I was living in France, buying baguettes and riding a bike and finding the quickest route into the city center. I was meeting up with my friends and trying different restaurants every night, and learning how to like coffee, and how to tolerate wine. I was learning how to communicate, too, how to understand more and more every day. I was learning how to be part of a different culture. But more than those smaller moments, it was the promise of Paris that got me through those first two months. As a group we’d taken a few small, local day trips around the region, but the big Paris trip wasn’t until the end of October, nearly two months after we’d arrived in France. I’d been counting down the days, so anxious to just be in Paris. Paris was the reason I’d continued making the effort to learn French, it was the biggest reason I’d decided to study abroad, at the time it was the place I wanted to travel to the most (it’s probably still the place I want to travel to the most, if I’m being honest). We arrived in Paris after a very turbulent flight, immediately getting on the RER and somehow ending up underground in the Louvre (my memory may be totally wrong here, but I remember taking a tour of the Louvre before even breathing Paris air). The trip was a tightly organized affair, with something scheduled nearly every hour. From the Louvre we went to our hostel and had about 30 minutes until we had to meet downstairs for dinner. I looked the map I had carefully folded and put in my purse. I saw that our hostel was nearly in the very center of the city, and very, very close to Notre-Dame. “Does anyone want to go out real quick and find Notre-Dame?” I was sharing the hostel room with 5 of my friends, and two of them agreed to come with me. I put my head down, covered my eyes, and my friends grabbed onto my arms. “We’ll tell you when to look up!” they said. We stopped walking, they gave me the signal, and I raised my head. 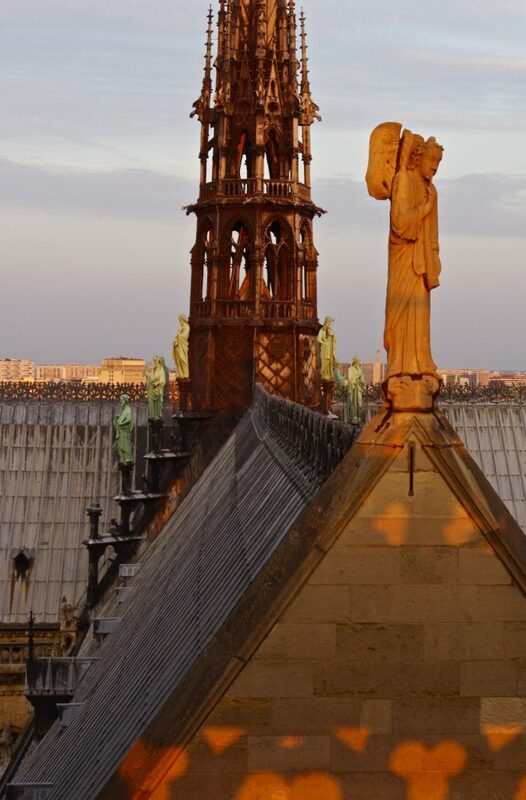 We were standing at the back of Notre-Dame, the part of the cathedral that had long fascinated me: those flying buttresses and the small round windows, all underneath a wooden roof and an impossibly tall spire. I looked at Notre-Dame and immediately spun around. It was so beautiful that I had to look away. I have felt that way every single time I see the cathedral. When I arrive in Paris, I often stay in the same hostel that our group stayed in on that first trip to Paris. I walk the same route to the Île Saint-Louis, I put my head down when the spire first appears, and then raise my head to take it in all at once. It is almost always the first thing I do when I’m in the city, and I don’t feel like I’m in Paris until I’ve seen Notre-Dame. On that first trip, Notre-Dame gave me something. It gave me peace and comfort, and more than anything, a feeling that I belonged. That I belonged there, standing underneath the buttresses. 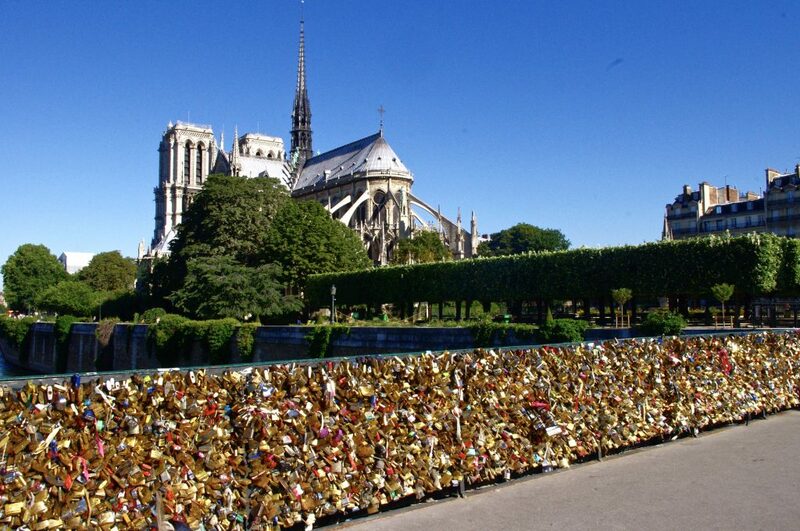 That I belonged there, in Paris. That I belonged there, an American in France. 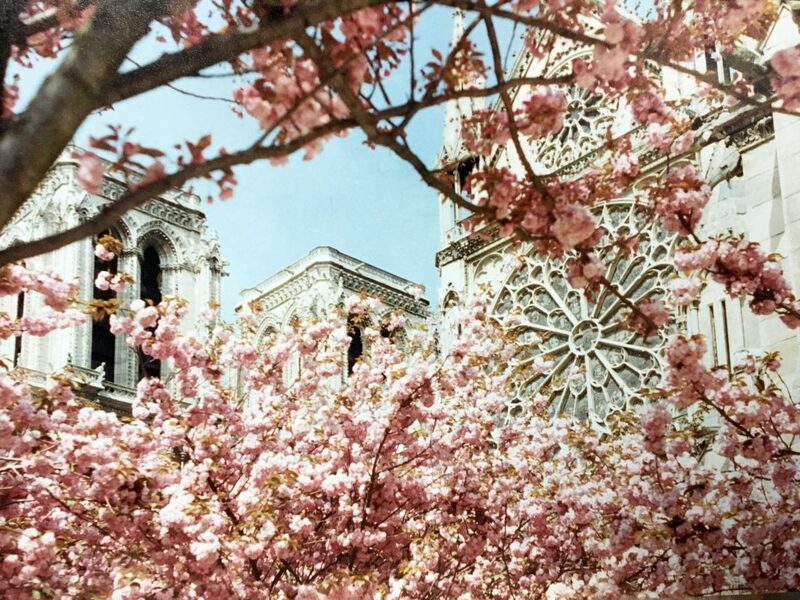 Notre-Dame belongs to so many people, and it also belongs to me. I’ve always felt that it’s my special place in this world, a place that I can always go back to. 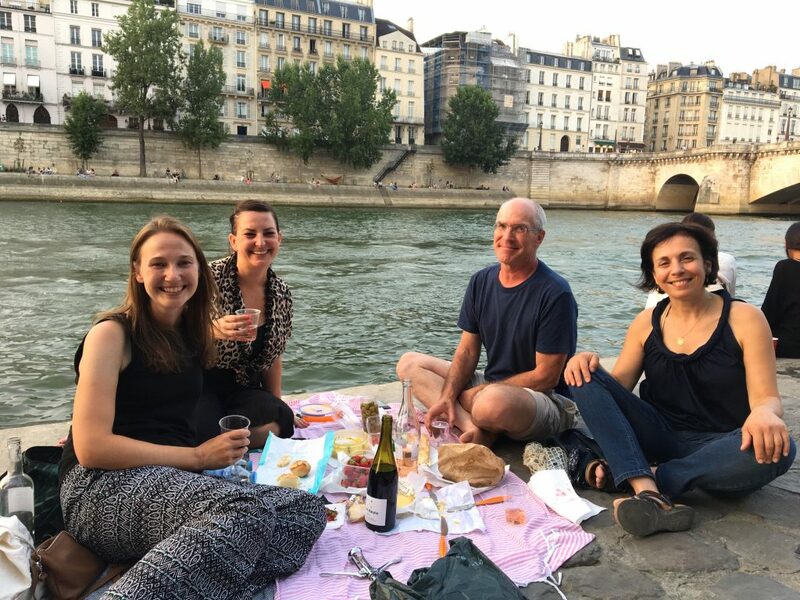 Last summer, I had a picnic along the Seine with three of my La Muse friends, and we chose a spot not far from Notre-Dame. We sat and laughed and ate and drank, and I remember sitting back as the sun set, thinking, “I can always come back here. 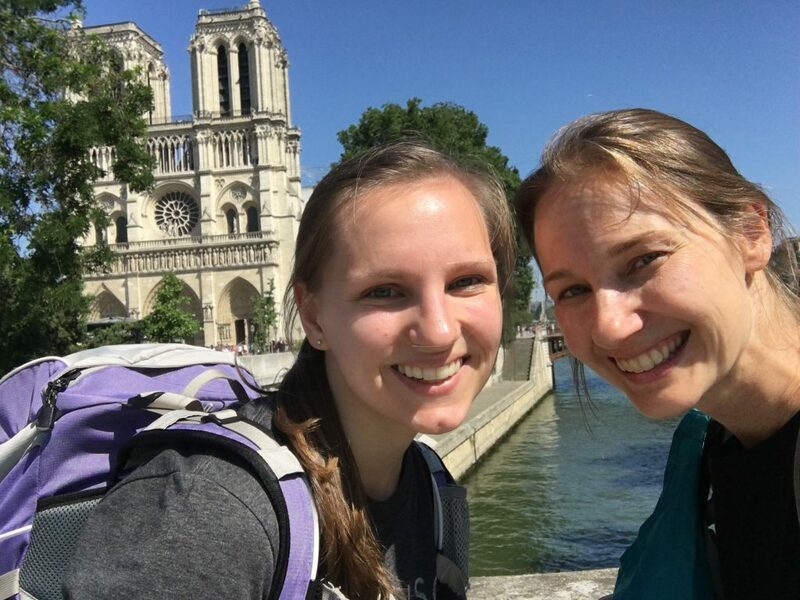 Notre-Dame will always be here.” I took a silly picture, a selfie, angling the camera so that a blurry Notre-Dame was just visible in the background. 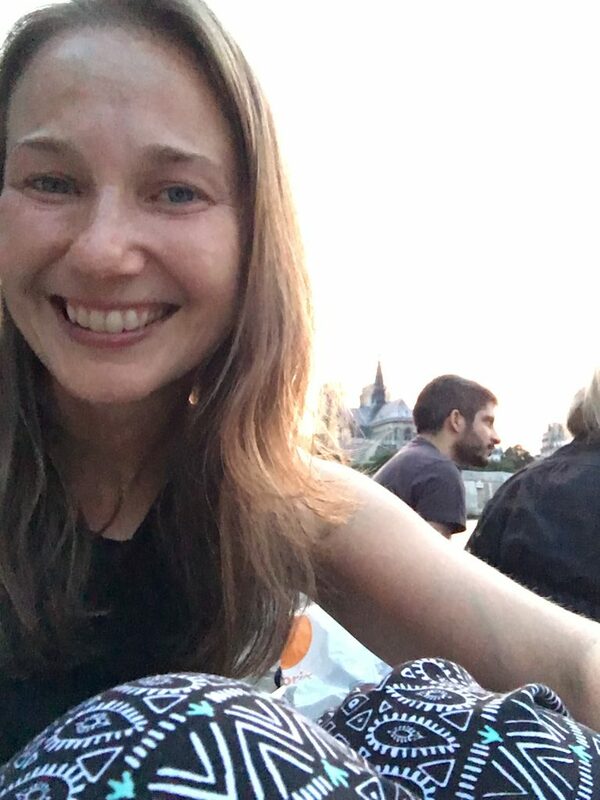 I wanted to remember the pure joy of that moment: a picnic with friends along the Seine, underneath a setting sun, Notre-Dame looming in the background, reminding me that it would always be there for me. 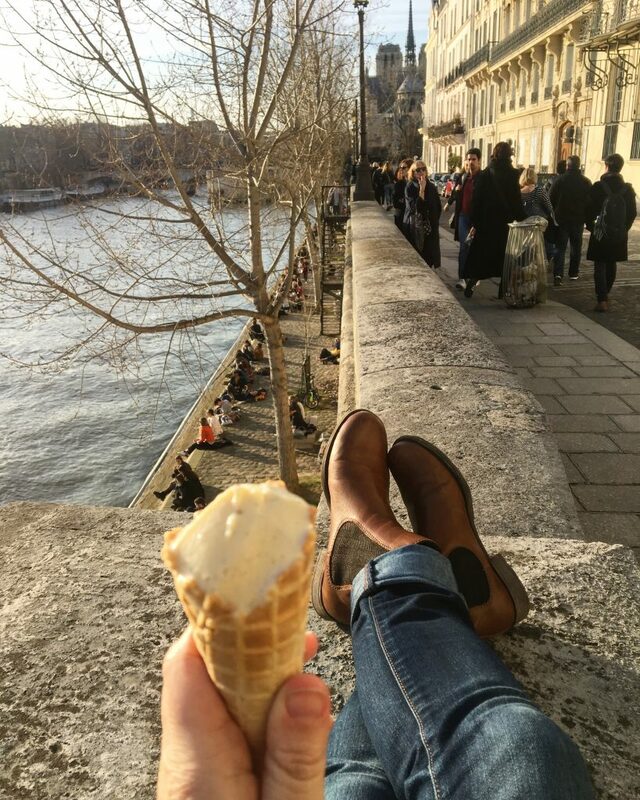 I was in Paris in February, just for a long-weekend trip. 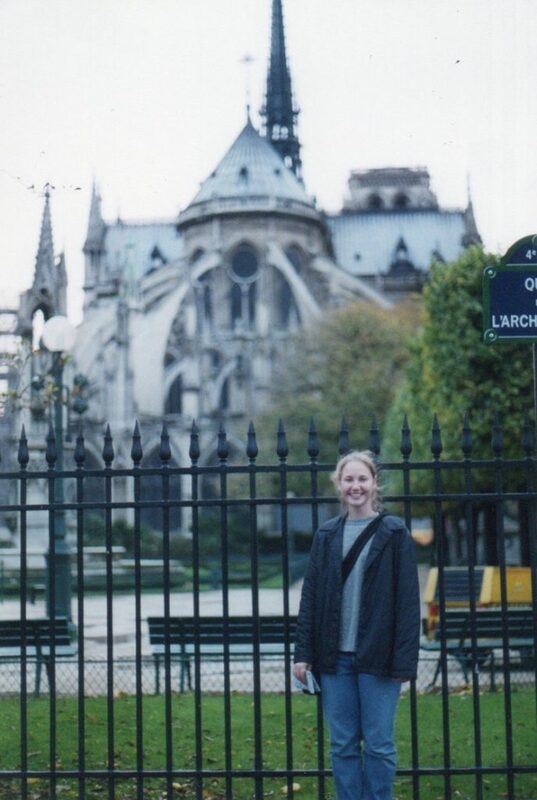 I’d found a cheap flight and I remembered what I had told myself the year before, and perhaps every year since I first went to Paris in 2000. “It’s there, waiting for you.” I wasn’t staying in my hostel this time, but in an Airbnb apartment in the 12th arrondissement, the furthest from the center I’d ever stayed. It was strange, arriving in Paris to a place I wasn’t familiar with. Arriving and not seeing Notre-Dame right away. But after settling into my room I set back out, walking block after block, the Seine on my left, the Bastille on my right. 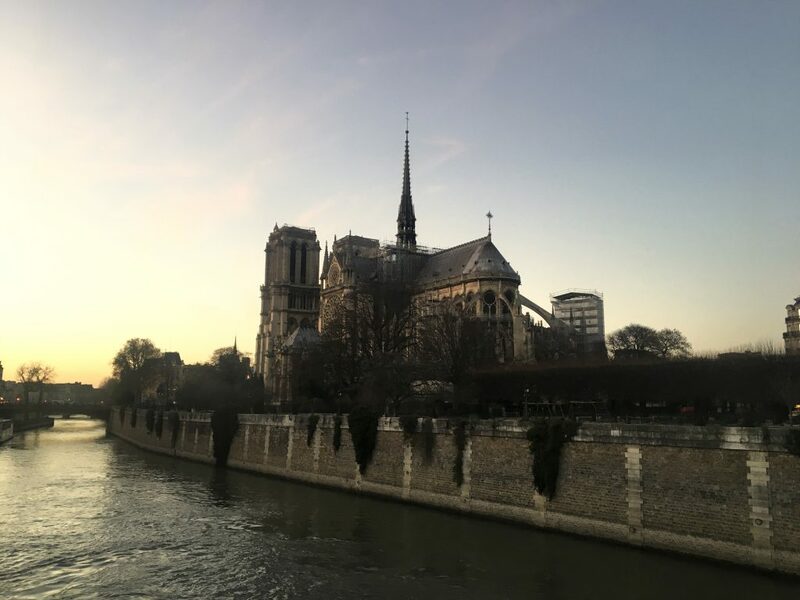 I passed through the Marais, walked down the street past my hostel, over the bridge and onto the Île Saint-Louis and there was Notre-Dame, lit up by the setting sun. I was late to meet my friend, because I couldn’t pull myself away. That golden light, that beautiful cathedral, right where I’d left it. When I heard, on Monday, that it was burning and that the spire had fallen, I was sitting on an outdoor deck of a restaurant in Key Largo with my sister. I’m pretty sure I made a scene. I felt frantic: scrolling through my phone, texting and messaging people, reading the news. Inside, in the bar, we watched a television broadcast that showed the cathedral on fire. I had to walk away, to be present with where I was and who I was with, but there was a pit in my stomach all day long. I felt like I was holding my breath. And it wasn’t until I learned that much of the cathedral had been saved that I felt like I could exhale. It’s still there. It’s different, it’s not what it used to be, it’s not whole. But it’s still there. 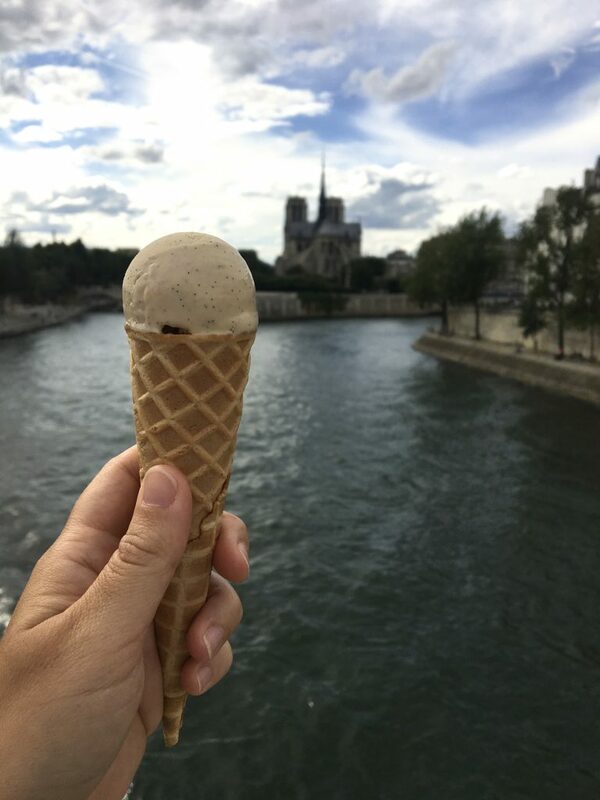 I had to write about Notre-Dame, if only to share some part of what it means to me, to add my own story to all the others. It’s about what is lost, about art and history and religion and faith and the story of a nation, but it’s in the individual stories, too. 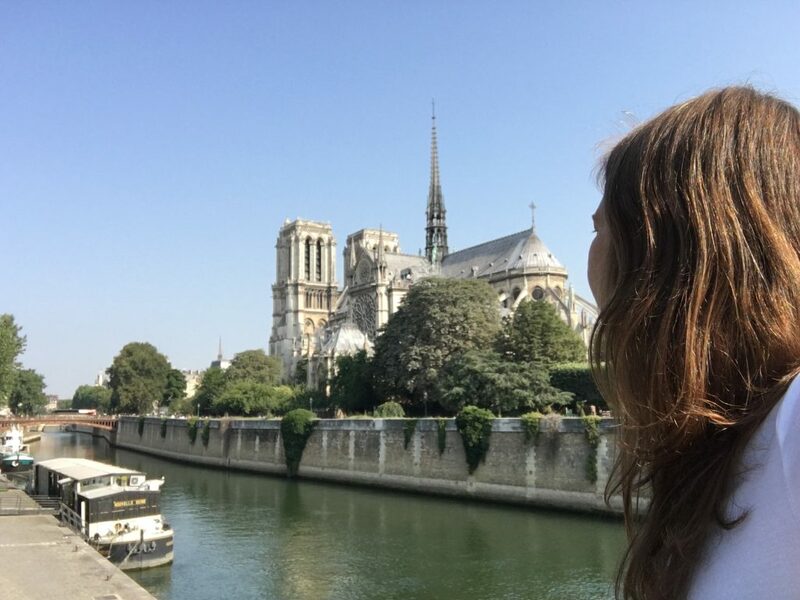 Notre-Dame is the center of Paris, but in some ways, it’s my own center, my center when I’m on my own and out in the world, totally unsure of myself, trying to find my place. 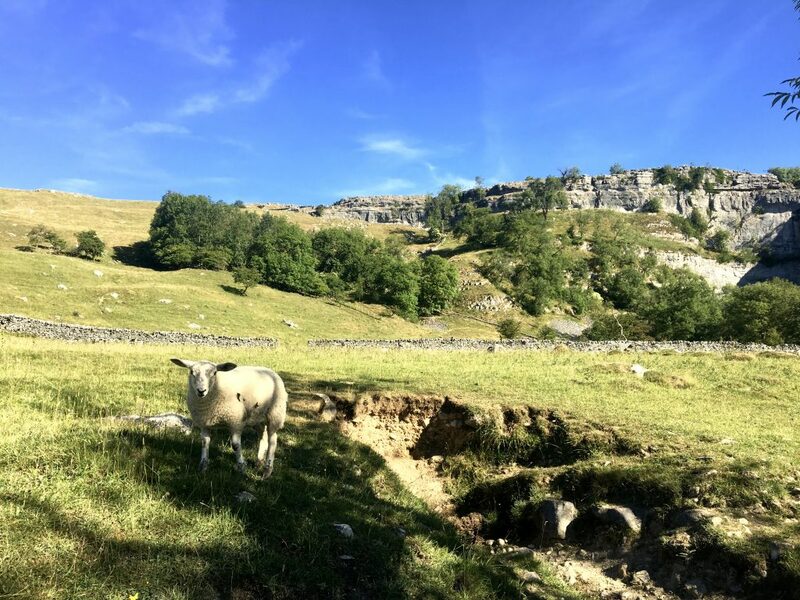 (July 2018) I woke up in my bunk at the Greenhead Hostel feeling excited for day 13 on the Pennine Way. 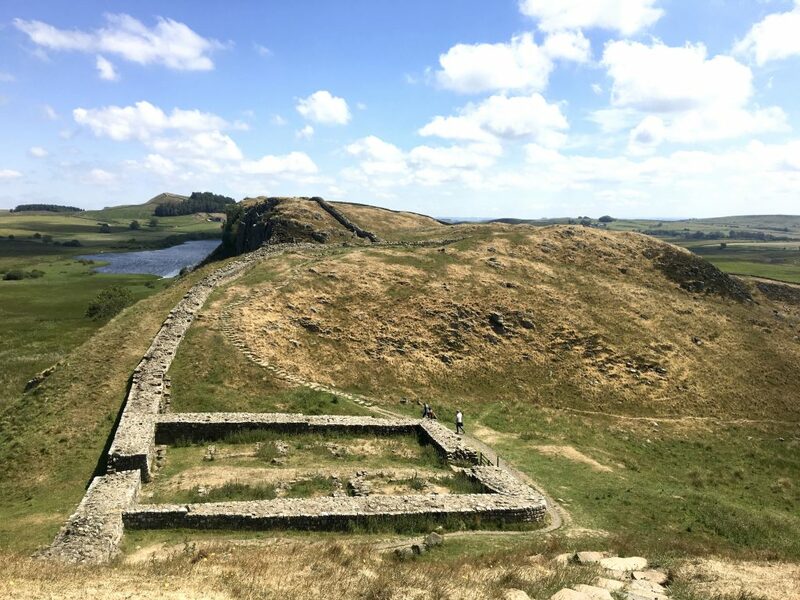 I’d be returning to Hadrian’s Wall! And I could start my morning with a hot breakfast and multiple cups of coffee! 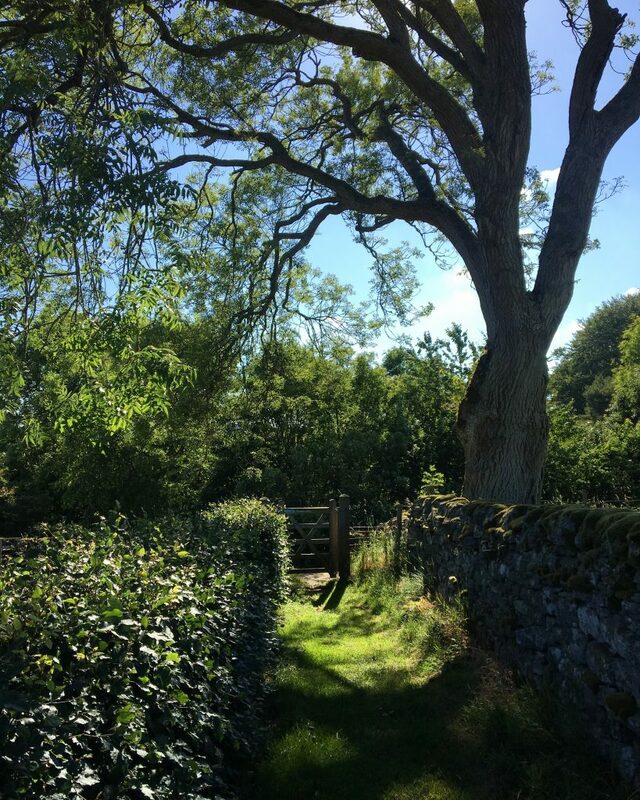 After the morning fuel I headed out, back through the narrow pathway that had lead to Greenhead and onto both the Pennine Way and Hadrian’s Wall Path. The two routes overlap here, just for 7 miles, but these are 7 glorious miles and I was so happy to be walking them again. 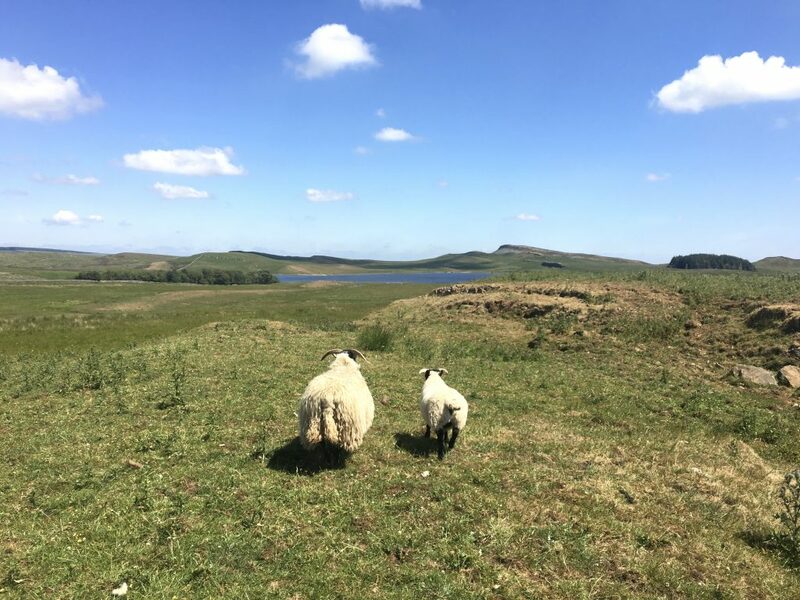 When I walked Hadrian’s Wall Path back in the spring of 2017, I had mostly cloudy, windy days. I had walked east to west (into the wind, which maybe was a mistake), and spring had only just begun. The landscape was still feeling rough, and a bit wild. But now I was here in the summer, walking west to east, and although my first steps of the day were under gray skies, after about 30 minutes the clouds rolled away and I was treated to more of that wonderful northern England sunshine. It was so fun to be back at the Wall. I’d really loved my walk in 2017, walking through those long, gray, windy days along the ancient remains of what used to be a massive defensive barrier, imagining what the wall was like when it was built, who had walked the paths that I now walked on, what kind of fighting and battling must have taken place here. This time, I mostly knew what to expect, and so I just enjoyed every second of those 7-miles. 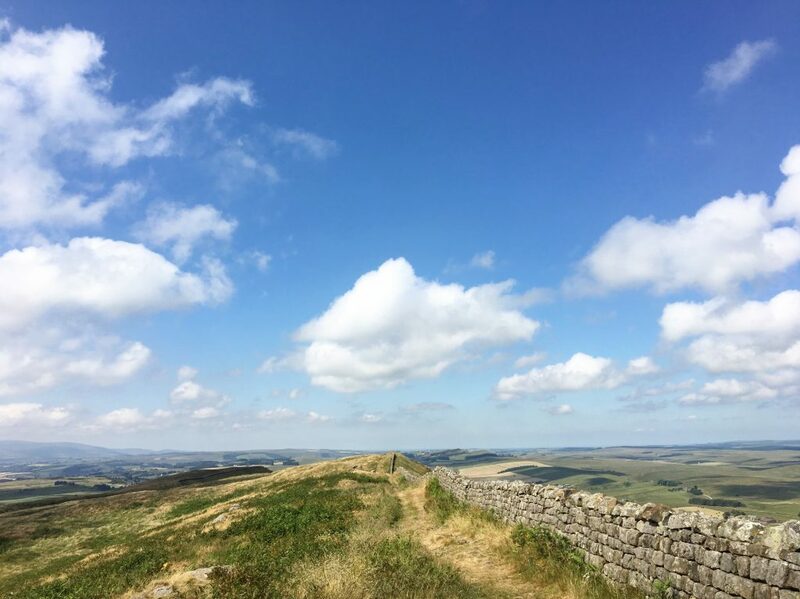 These miles follow the best preserved sections of the wall, from Walltown Crags to just before Housesteads Crags, taking in Great Chesters Fort, the trip point at Winshields Crag, my favorite milecastle (#39), and Sycamore Gap. 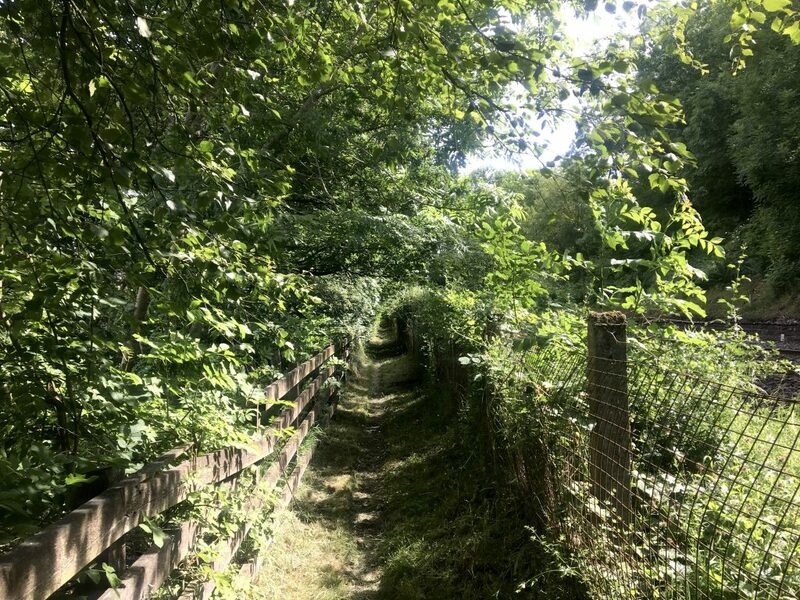 I took so, so many photographs, I smiled constantly, I found an energy from deep within as I climbed up and down and up and down the steep small hills of the escarpment. And the weather was perfect. It was perfect! This was the very best day yet, with clouds perfectly dotting the wide blue sky, a light wind that cooled the heat of the sun, the exactly right temperature for walking. 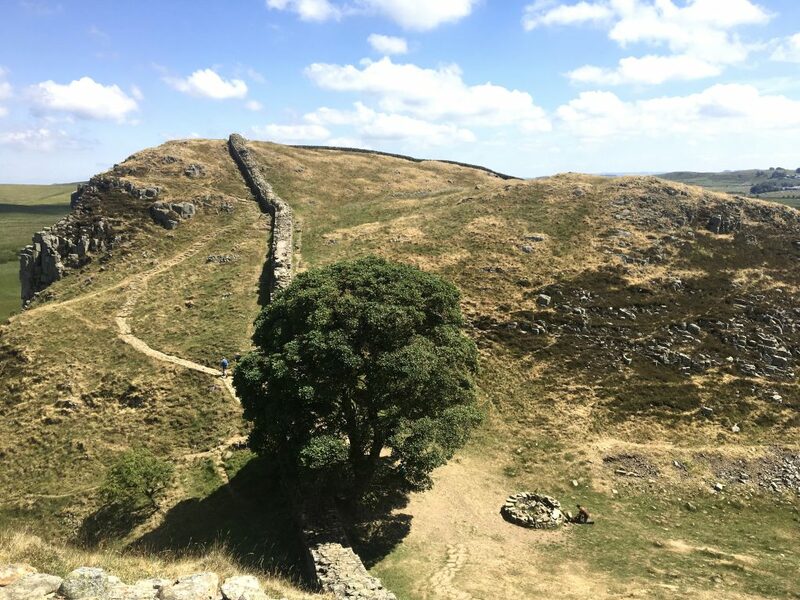 Here are a bunch of photos from the wall (and if you want to read a little more about that same section when I walked two years ago, here is that post). But keep reading after these photos, there were more adventures on the rest of the stage! I split up my time on the Wall at the Northumberland National Park Visitor’s Center, which is just a slight detour from the path, in Once Brewed. This would be a good place to split the stage if you have the time; there’s a youth hostel here, and an Inn (named Twice Brewed), as well as a campsite a little further down the road. 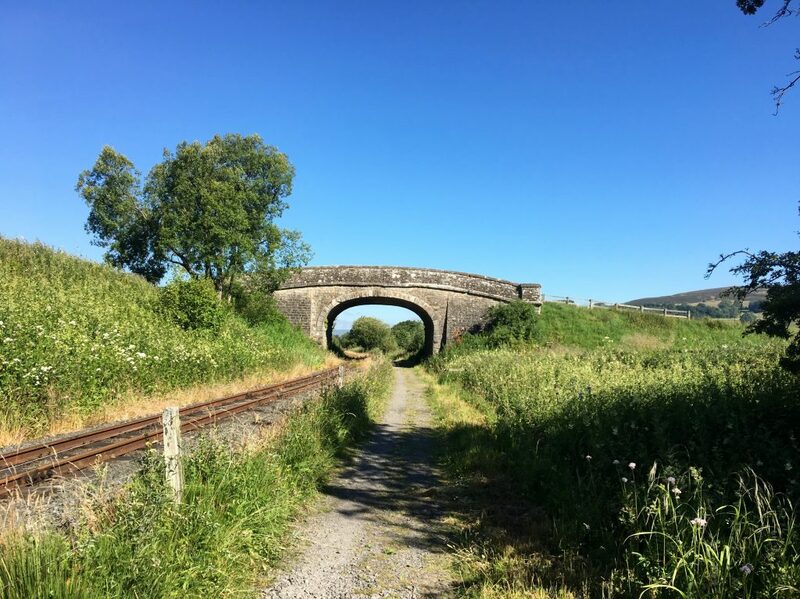 It would make for only a 7-mile stage (Greenhead to Once Brewed), but it would allow plenty of time for exploration and site-seeing and you can take your merry time. 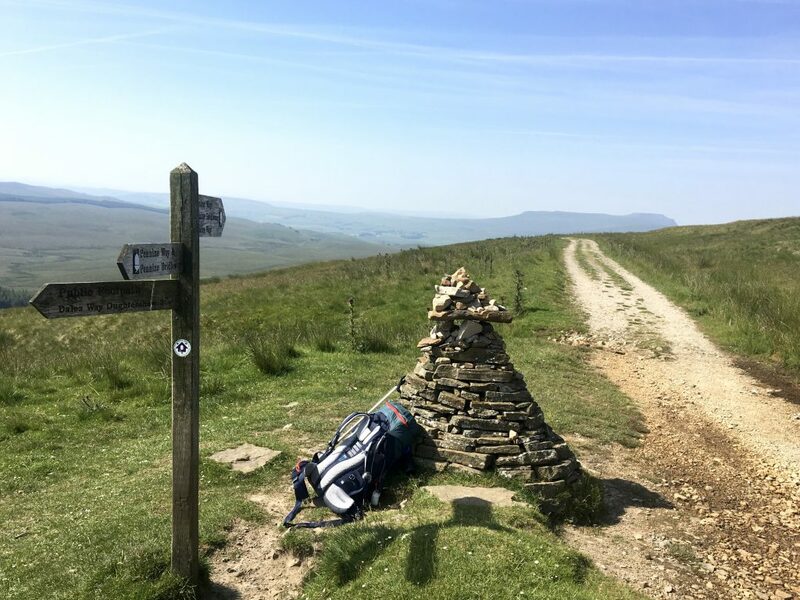 I’ll touch on this in a later post, but if I could plan another walk on the Pennine Way, I think I’d give myself 17 or 18 days, rather than 15. And one of those extra days would be here. The Northumberland National Park Visitor’s Center is shiny and new (and I think it must have been under construction/being built when I walked through in 2017), and it was a nice place for a quick break. There’s tons of information and exhibits on the wall, though I didn’t have much time to linger. 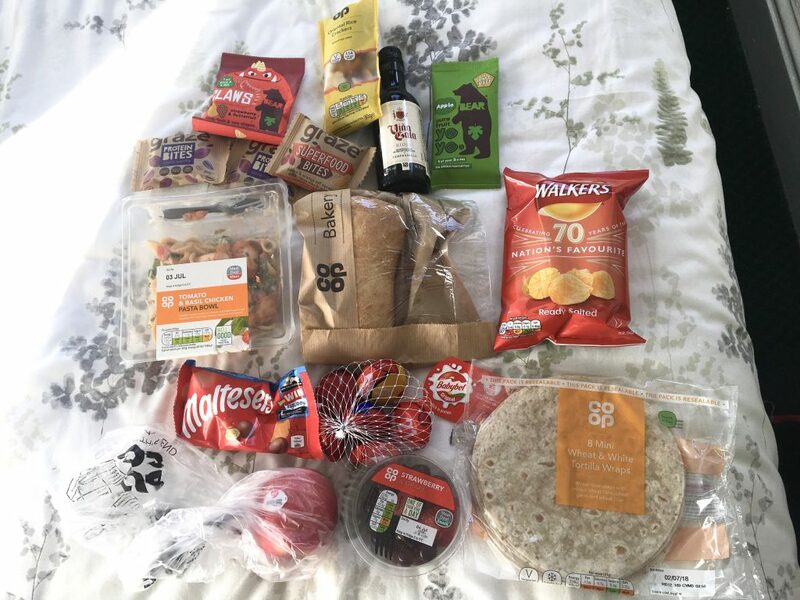 I just used the bathroom, bought a couple postcards, stopped by the little shop for a Twix bar and a bag of chips (essential snacks along the way! ), reapplied my sunscreen and then headed back out. 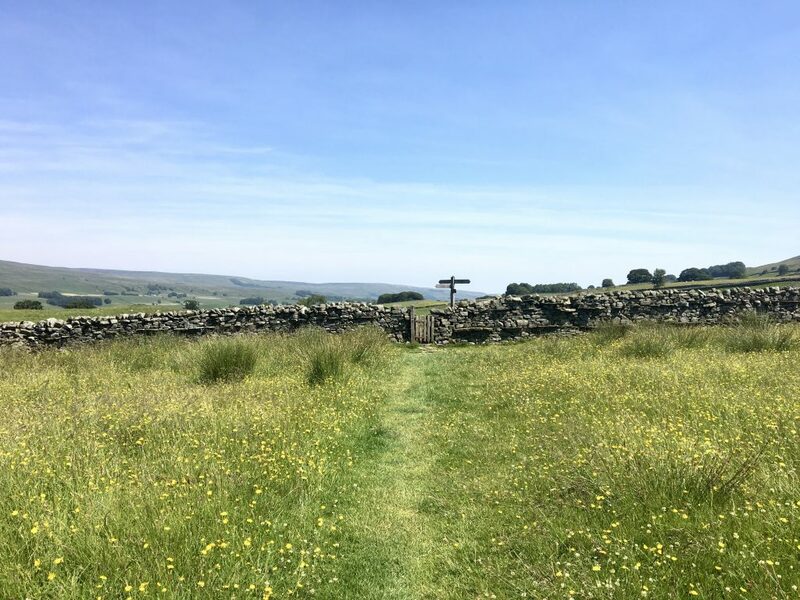 After another two miles I reached my turnoff to continue on the Pennine Way, and I have to say, it felt really good to turn left at the signpost and walk north, leaving the Wall behind me. It felt right. 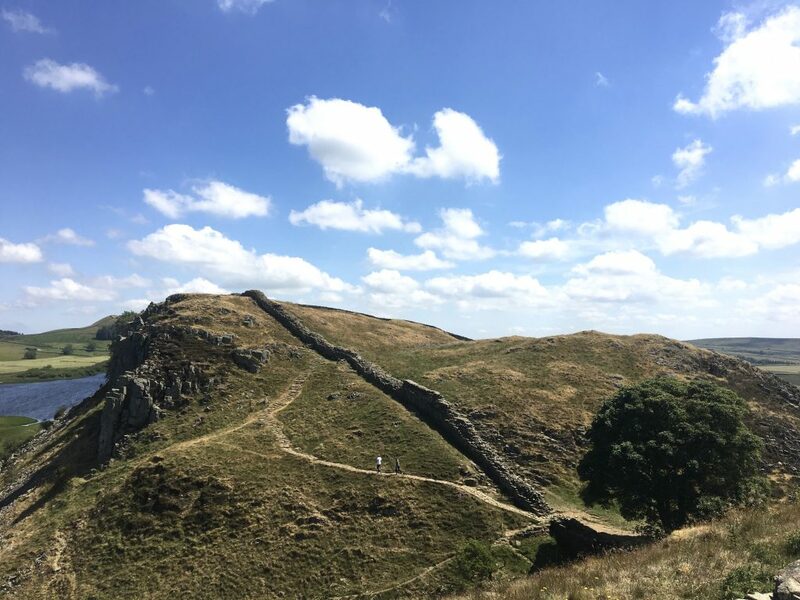 Walking along the Wall almost felt like I was on a vacation (even though, technically, walking the Pennine Way was my vacation). But how can I explain it? I’d been there before, I knew where I was going. Even though it was early enough in the morning that I was avoiding the crowds, I was still running into other day hikers and tourists. For those 7-miles, I’d stopped walking north, towards Scotland, and was instead on a bit of a detour and going out of my way to the east. I can’t be sure, but it seems like as soon as I turned left at the signpost, everything grew quiet. And calm. And peaceful. I’d left everyone else behind. I was back on my walk. But almost immediately I- quite literally- stumbled onto some excitement. I was climbing over a wooden stile and coming down the other side of a stone fence when I nearly stepped on a little lamb. The poor thing was stuck in the gate next to the wall! It was butting its head frantically, shaking its whole body, but one of it’s horn had gotten wedged under one of the railings of the gate and he was trapped. His mother was standing further off in the field, watching us. I climbed down from the stile, put my pack on the ground, and approached the little guy. As soon as I reached down he froze, terrified. I was kind of terrified, too. Sheep are great and all, but only when they’re at a bit of a distance, grazing in a field or tottering away down the path. I’m not scared of sheep, but to be honest I’m not sure if I’ve ever touched a sheep before. Petting zoos weren’t really my thing, and if they ever were, I’m sure I was only looking, and not petting. But I couldn’t leave the poor little lamb stuck in a gate, and the whole thing was probably comical if anyone else was watching because I’m sure it took me far longer to get the guy unstuck than it should have. But after some maneuvering and gentle pushing I got his head unstuck and like lightening he dashed away to his mother and then they ran off together. After my valiant lamb rescue, I continued on, down a forestry track, briefly into a forest and then back out into the open land. My guidebook mentioned a small enclosure just off to the side of the path which would make for a nice rest spot (or wild camping spot). I saw it from a bit of a distance and when I approached, I found that it was- indeed- the perfect place to stop for lunch. I climbed over the low stone wall, found a flat spot on the ground, and settled in for a little picnic. 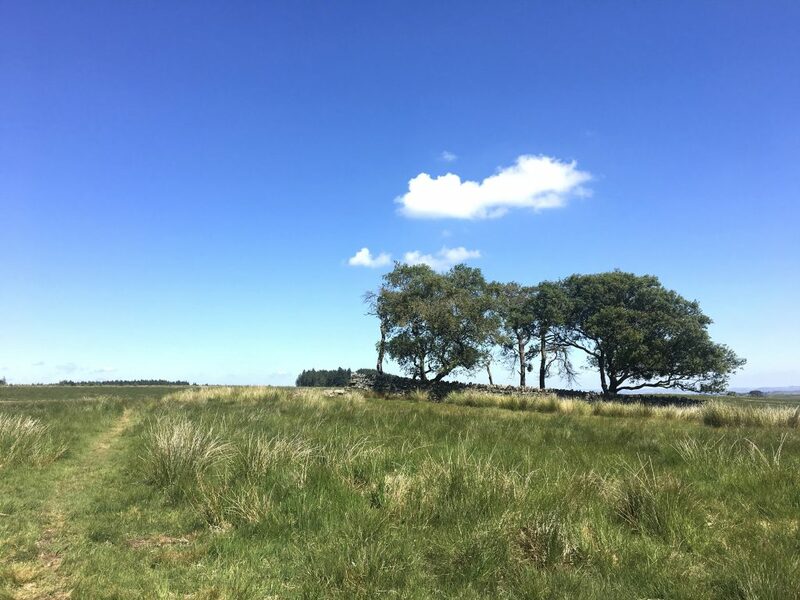 Even though I was in the open country of Haughton Common, I felt secluded away, protected and safe. A satisfying lunch and then more walking, on and on, the sky wide above me, the countryside stretching out before me. It was sometime during this afternoon section that I had one of my perfect walking moments. It’s a little hard to describe these, only that I know I usually have one or two on every long-distance walk I’ve ever done. The moments are made up of similar ingredients: usually there is nearly perfect weather, making for very comfortable walking. I feel strong and energized, full of food, my feet free of blisters, my legs free of any pain. I am all alone, with no one ahead and no one behind. Sometimes I am listening to music, sometimes I am listening to the wind. This time, all I know is that I was walking along and this feeling was building and building- I think it was joy, or maybe utter happiness- and then it nearly overwhelmed me and I felt like I could fly. Or at least run, or dance, or spin, and so I did all three: there, alone in a wild field, spinning and dancing down the trail and smiling up to the sky. I feel so free in those moments, so certain that where I am is exactly where I’m meant to be. I feel like I want to do this- I want to walk and be free- forever. The moments never last forever though, but I have to say that this time, the feeling of happiness followed me all the way to Bellingham. I had miles to go, but I can’t remember much of them, other than they felt easy and I felt strong. 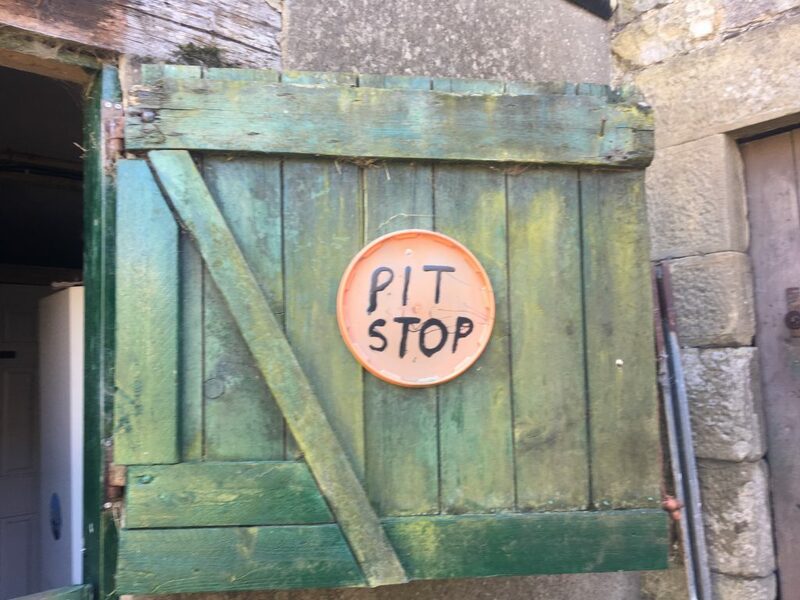 But before Bellingham- maybe a few miles before?- I passed through a farm and saw a sign painted on an old green door, reading ‘Pit Stop’. “What’s this?” I asked myself, before venturing inside. The little shed to the side of the main house was a walker’s oasis. It was a dark and a bit dingy inside, but obvious care had been taken to provide walkers with everything they might need. There was a fridge stocked with rows of cold drinks. There was a basket full of packaged biscuits, and jars of candy. There was a notebook registry, and a basket of medical supplies. There was a box full of things that walkers had left for others to use. There were couches and there was even a bathroom, with rolls of toilet paper! Toilet paper! 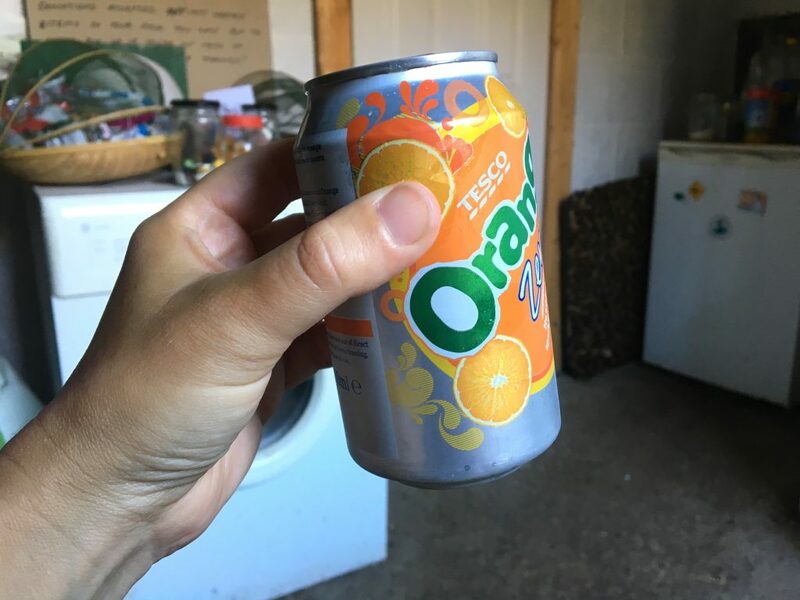 I only had a few more miles until Bellingham and I was still feeling strong, but I had already walked nearly 20 miles and I was starting to feel tired, so I gratefully sat for a few minutes with a cold drink. I left a few coins in a donation box and signed the registry, leaving a note for the friends I’d met that were somewhere behind me. On my way out I met the owner of the farm and his wonderful black Labrador, chatted for a few minutes, then continued on. And because this was shaping up to be a wonderful day, the path continued to provide so much beauty and joy around nearly every corner. 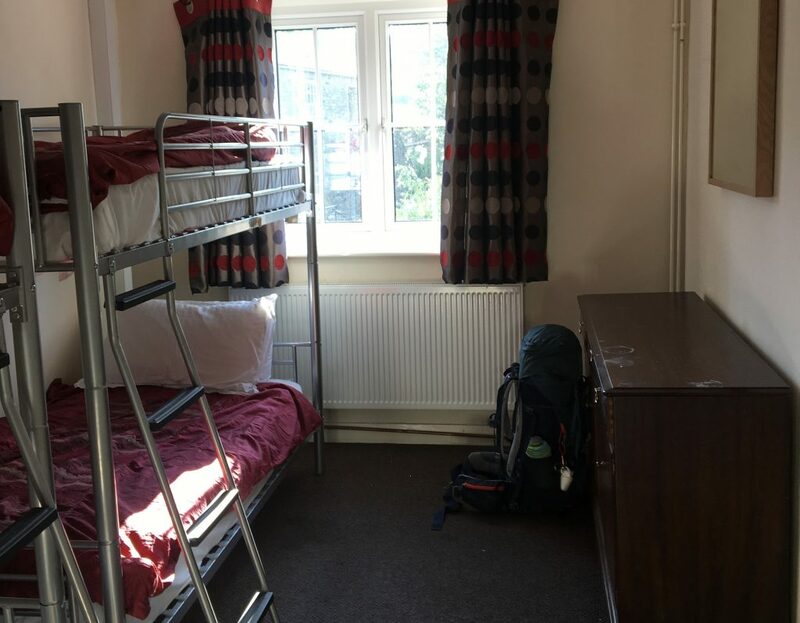 Once in Bellingham, I found my lodgings- Demesne Farm Bunkhouse (I wrote about it for the Independent Hostels UK website! )- was shown up to my room (alone again, naturally! ), showered and washed my clothing and then set back out into town, to buy supplies from the grocery store. 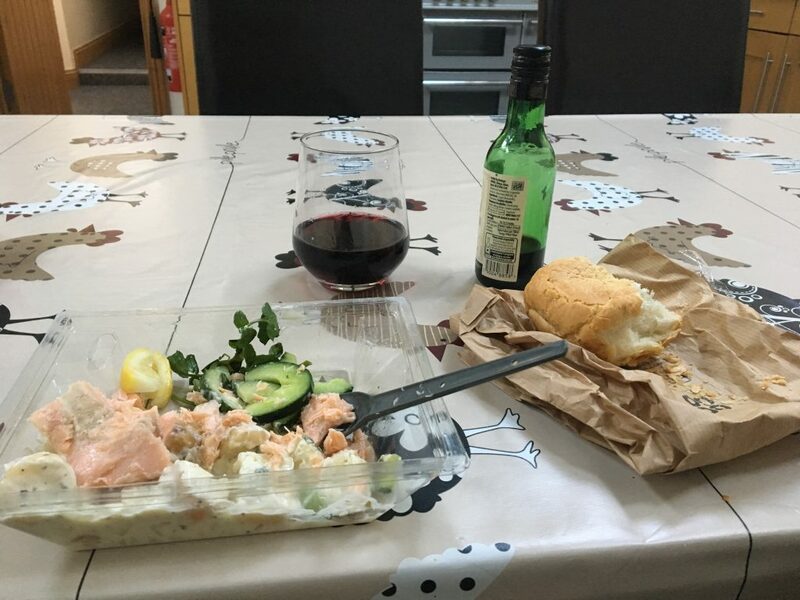 Along with lunch and snacks for the next day, I bought stuff for dinner and took it back to the bunkhouse, and set up my little feast in the kitchen. Just as I was about to head up to my bunk room, I met several cyclists who were in the middle of the Reivers Coast to Coast Route. While they made tea, I answered their questions about the Pennine Way, and in turn, asked them about their own adventure. Then my usual routine in my empty bunk room: a few ginger cookies, a few chapters of Jane Eyre, and then fast asleep under the heavy blankets with a cool breeze blowing through the open window. 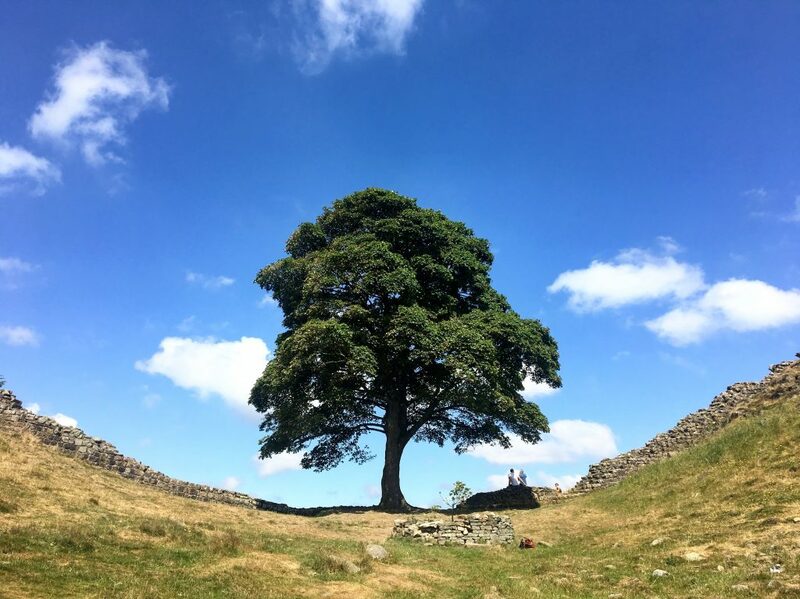 (July 2018) Day 12 on the Pennine Way took me from Alston to Greenhead, and overall the walking was straightforward and uncomplicated. It had been a few days since I could say that (field wanderings, a missed dinner, a drained cellphone, exhausted legs, hill/mountain climbing, no coffee), and so I was looking forward to this stage. I think, however, I need to add a note about the weather. If you’ve been following along, you may have noticed that I’ve written- “It was another day of blue skies and sunshine”- in nearly every post. If I didn’t write it, the photos have shown you how great the weather was during my walk. And, you guessed it, my 12th day was no different and the weather was perfect. So when I say that this stage was straightforward and uncomplicated, it’s especially easy for me to say that because of the weather. 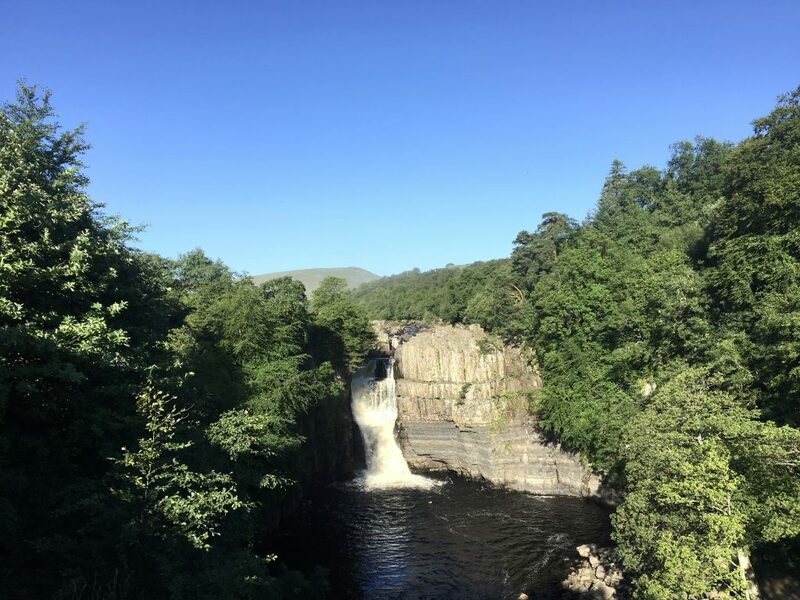 A fellow Pennine Way walker is posting photos from his trek over on Instagram; he walked in the fall and I think he walked at least half of his trek in the rain. He had 8 days in a row of soggy boots! He just posted some photos from the same stage I’m writing about today, saying that he walked through what is the wettest and boggiest section of the entire Pennine Way, at first trying to walk with plastic bags wrapped over his shoes, then forsaking the bags and just tramping through the mud and water and soaking his boots clean through. I look at his photos and I remember what the same walk was like for me. I, too, walked through the fields that are known as being the ‘wettest section of the way’. What do I remember from this section? I only remember focusing on navigation and looking for signposts. Maybe I walked through a small puddle? Maybe one? But I doubt it. 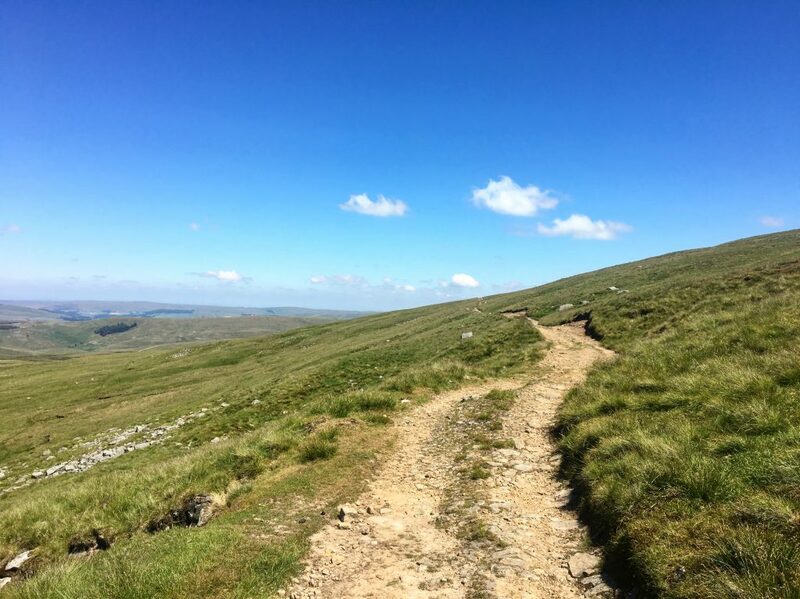 The Pennine Way wasn’t an easy walk, it was the most difficult one I’ve done so far. Sometimes I wonder if I would have loved it as much as I did if I hadn’t had such nice weather. I remember how miserable so much of that first day was, my only day of rain: how difficult it was to navigate and keep to the trail, how cold my hands were, how wet my socks and shoes became. 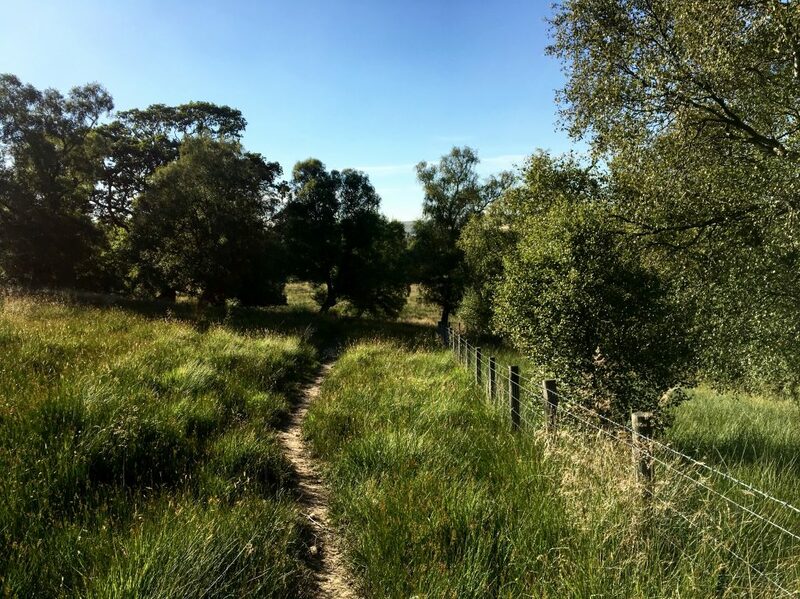 As I’ve been trying to churn out these posts, it’s meant that I’ve immersed myself in memories from my walk, and it’s so easy to long to be back on the trail, it makes me want to plan another walk in the UK. And I’m sure I will, but I also need to always remember that the beauty of my experience had a lot to do with the weather. Okay, enough rambling, back to Day 12! The weather was good, yes, but my last few days had been difficult and so I took an easy alternate path for the first 6 miles of the day and it was the best decision I could have made. 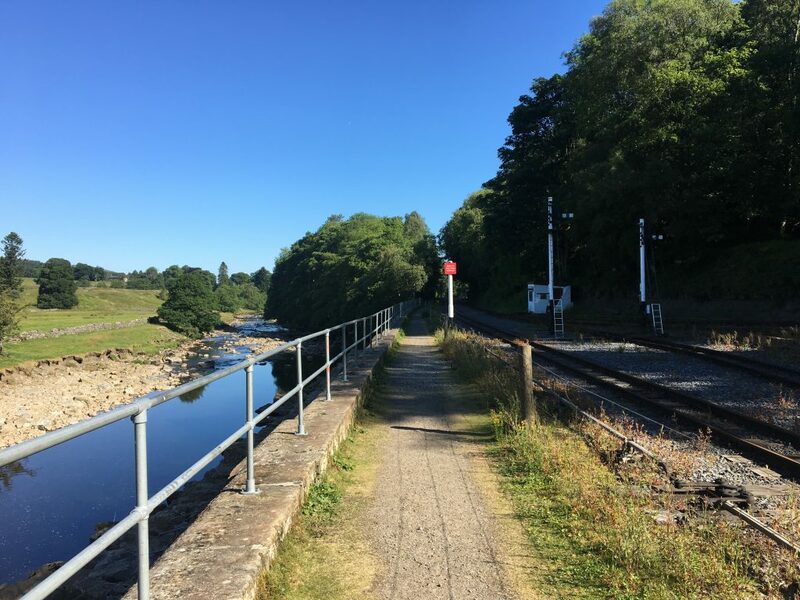 The South Tyne Trail follows an old railroad track and runs roughly parallel to the Pennine Way. 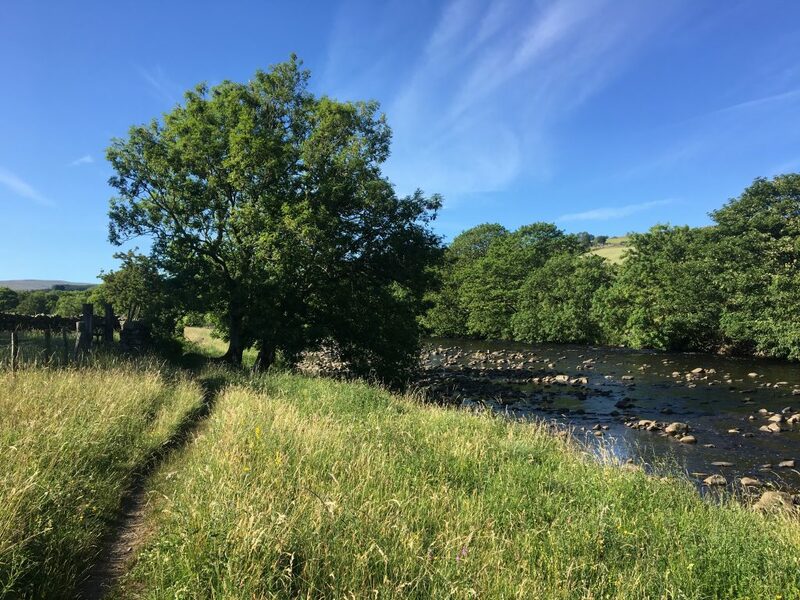 But where the Pennine Way climbs up and down little hills, traverses farms and is constantly taking you through a series of gates and stiles, the South Tyne Trail is totally flat and straight and stile free. Stile free! Plus, there’s no need to even worry about navigation or looking for the next marker or constantly checking maps to make sure you’re on the right track. It was free and easy walking, the kind where you can just let your mind wander and cruise along easily and happily. 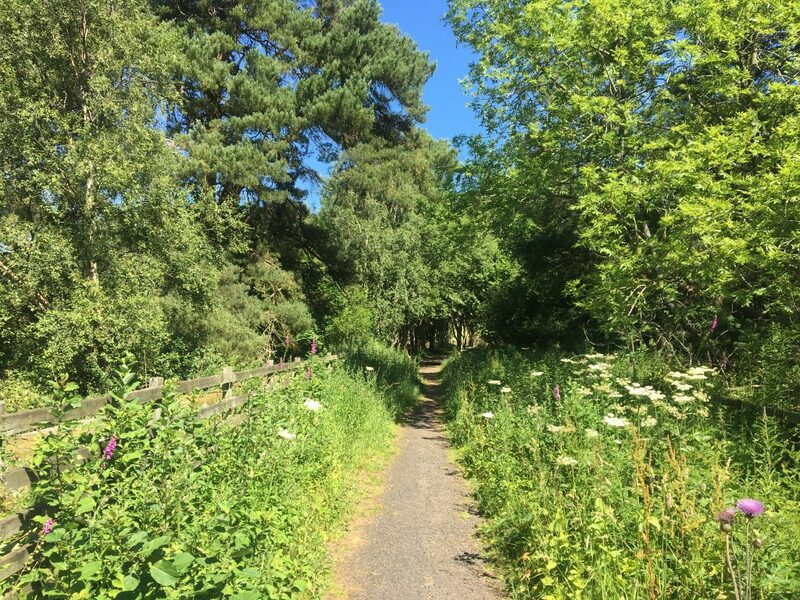 So I walked for about 6-miles on the South Tyne Trail, moving quickly and easily and happily. 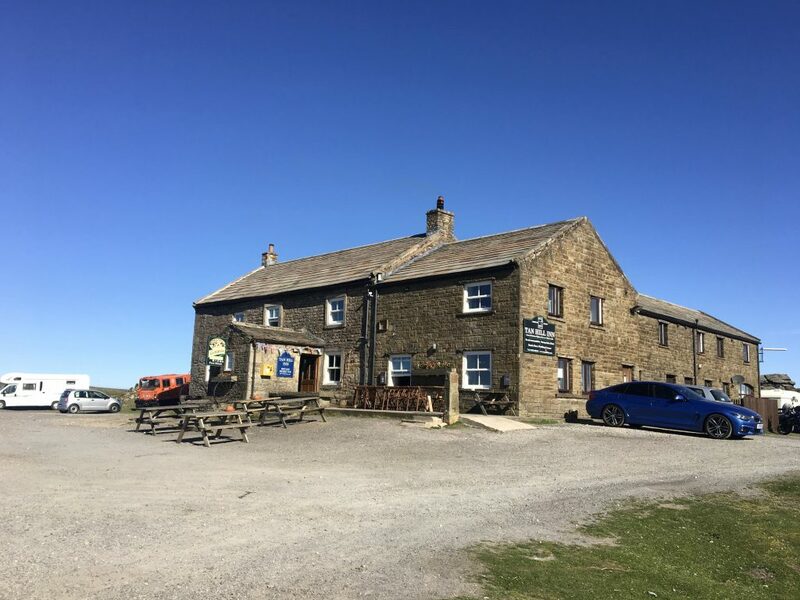 I took a slight detour to see about a snack or a cup of coffee at the Kirkstyle Inn (well-worth a visit, my guidebook told me) but I came up short and the Inn was closed (I think just for the day, so future Pennine Way walkers should try their luck). I didn’t mind too much- the morning had been easy and I was still full from my breakfast at the B&B in Alston, so I continued on. 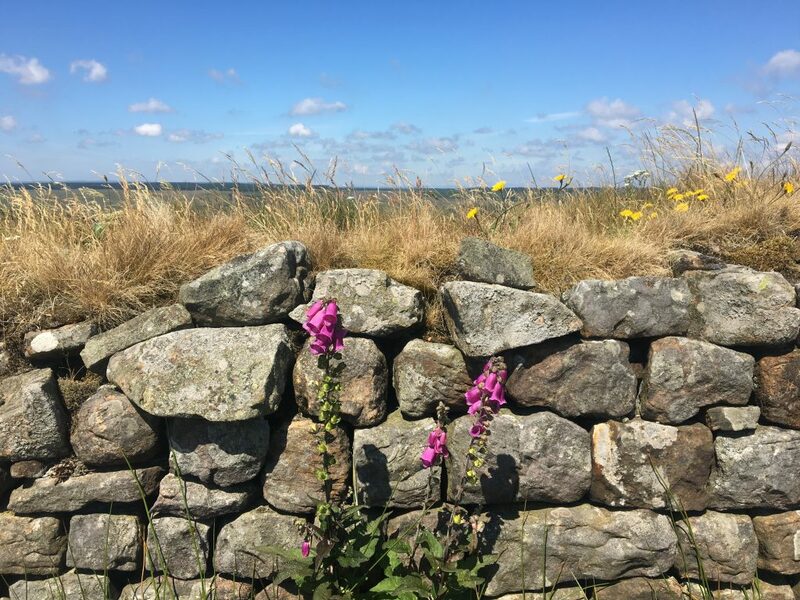 I moved away from the South Tyne Trail and back onto the Pennine Way, immediately climbing out of the valley and walking through fields and fells, marsh grass growing high around me. I continued on through farmland, then reached Blenkinsopp Common, the fabled “wettest and boggiest” section of the Pennine Way. 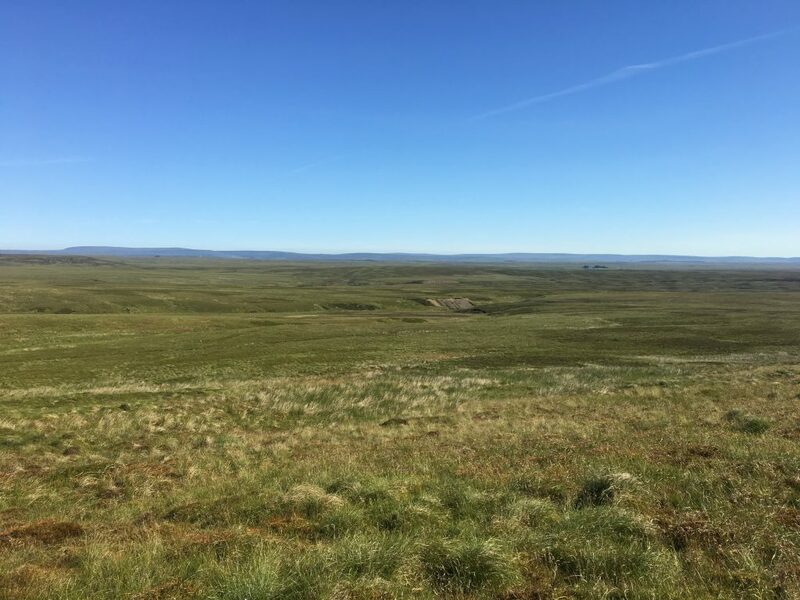 My guidebook also told me that navigation would be nearly impossible here, the path disappearing into the grass and heather, but just to look for the fenceline and follow it north. At first I couldn’t even see a fence but I eventually spotted it, far off in the distance. I headed towards it, picking my way through the moors, hoping I wouldn’t sink into a bog. My fears were unfounded; there were no bogs to be had, and the path was mostly dry. 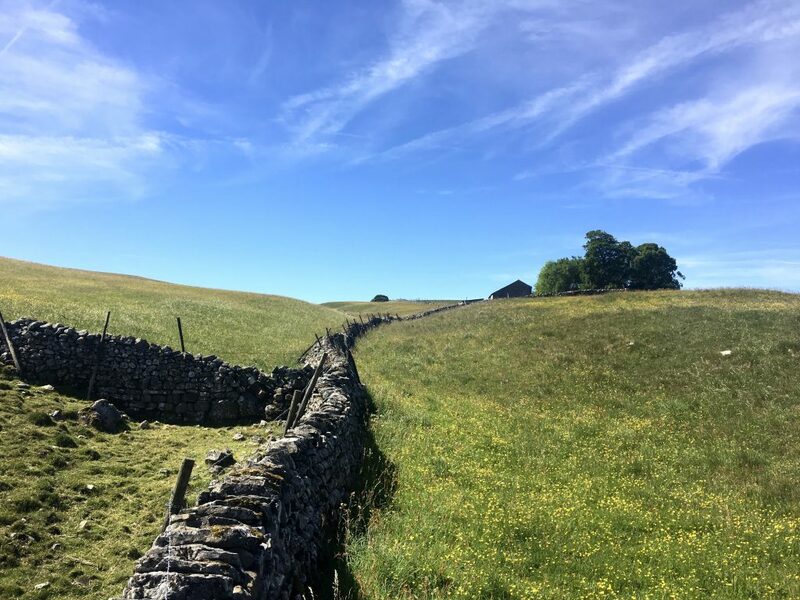 I think the highlight of my afternoon was finding a Pennine Way marker in these fields: my guidebooks says, “Chufty badge for navigation if you find this” and when I did I let out a small cheer. 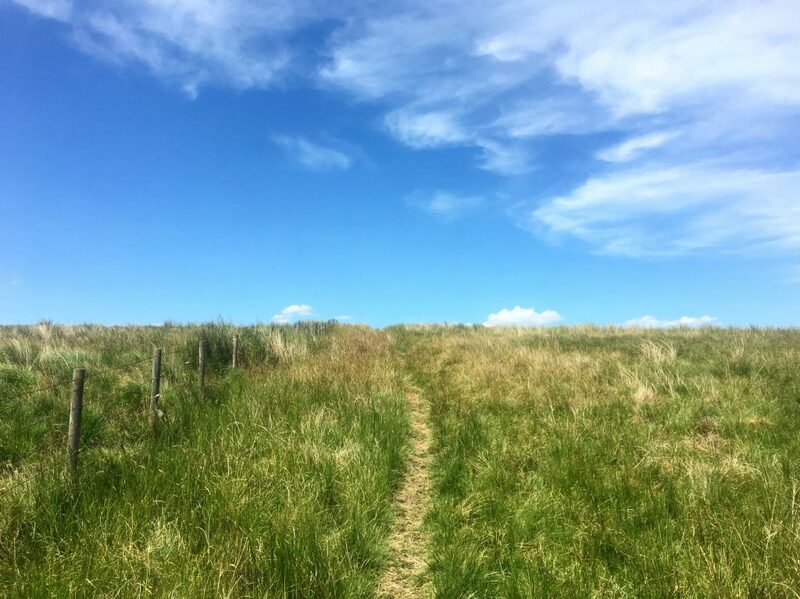 I didn’t cross paths with another walker for the entire day, I was alone with my thoughts and my footsteps for miles and miles and so sometimes, finding a marker in an otherwise endless field of green feels rather exciting. After another few hours I arrived in Greenhead, the Pennine Way having just overlapped with Hadrian’s Wall Path. 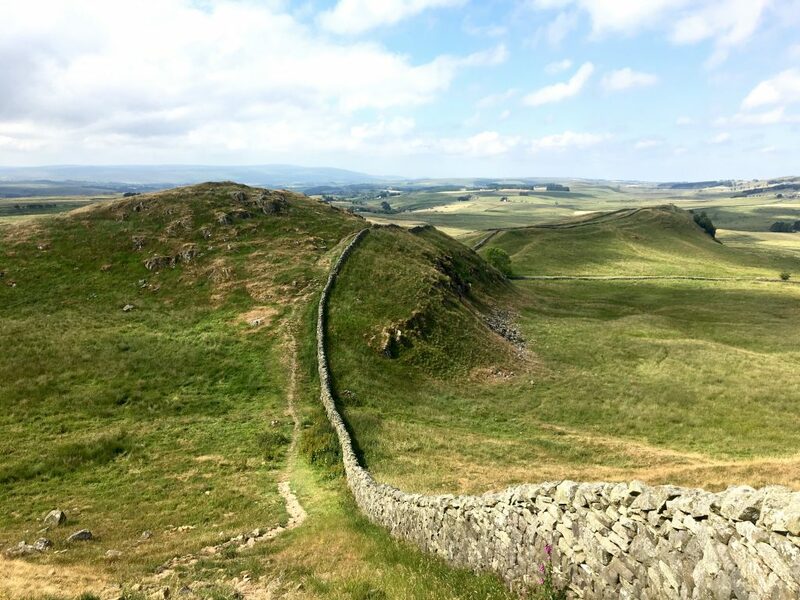 I was excited about the next day’s walk- I’d get to walk about 7-miles along Hadrian’s Wall (some of the best part! ), and ever since I walked the route in the spring of 2017, I’d been eager to go back. In Greenhead I’d booked a bed at the hostel, which is in a converted Methodist chapel, and as usual I had the room all to myself. 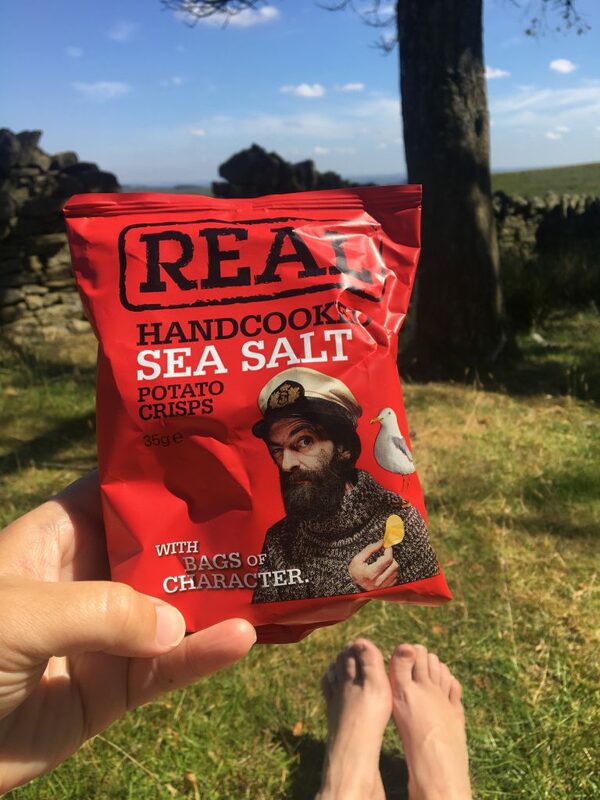 Just as I was thinking that my Pennine Way had turned into a very solo trip (despite having made several friends within the first few days), I ran into the Dutchman- Luke (or Luuk? )- at dinner! The Greenhead Hotel was just about the only place around for food, and there were a few other walkers there as well. Luke and I ate together and talked about our experiences along the way, and it felt really good to be able to share my experience with someone else. 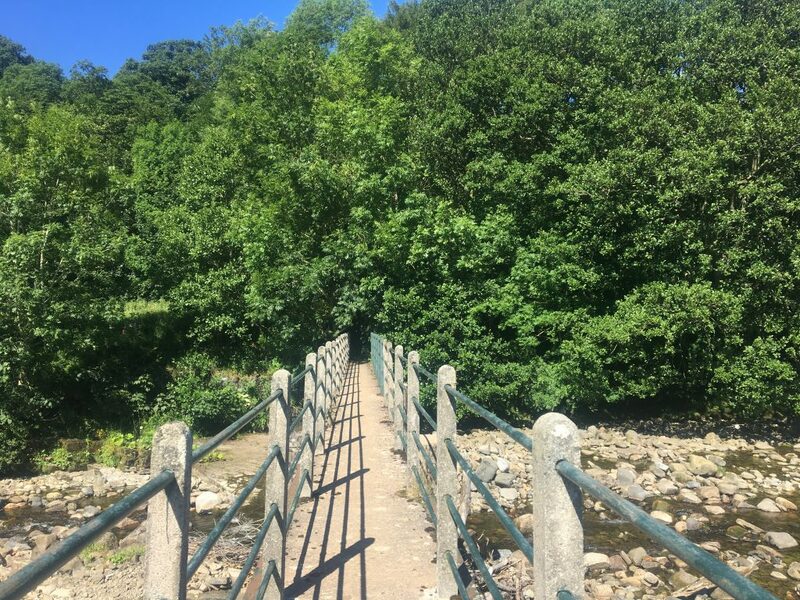 It felt like a long time since I’d said goodbye to David back in Horton-in-Ribblesdale, and while I’d had some nice encounters with locals, I hadn’t really met or talked to another walker like me. I’d resigned myself to a very solo and isolated walk until the end, so having that meal with Luke was an unexpected treat. We talked about the next day’s stage and he told me he was breaking what I would be doing in one day into two, so I knew that I wouldn’t see him again. But this is something I love so much about these long-distance walks: the chance to have a drink or a meal with a stranger who quickly turns into a friend, for the shared camaraderie, the understanding, the ease of it all. 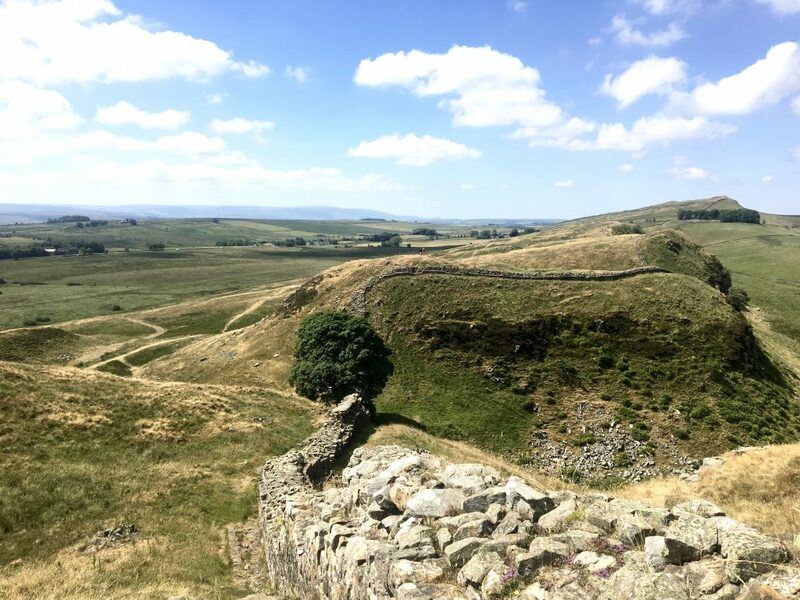 Then back to my bunk in the hostel, under the covers, a chapter of Jane Eyre and then lights out, already dreaming about the next day’s walk along Hadrian’s Wall. 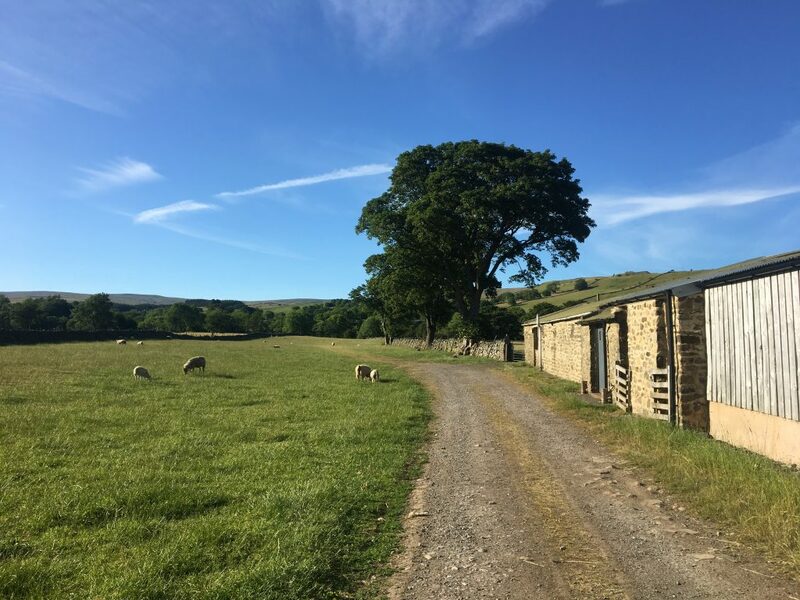 I woke up around 5:00am in the camping barn in Holwick. I hadn’t set an alarm because the battery on my phone was low, really low. There was no electricity in the barn and so I’d powered down my phone the night before, hoping to save what little battery I had, in order to take a few photos the next day. The bright sun woke me up, and despite the early hour, I decided to get out of bed and start the day. I moved slowly through the morning tasks: brushing my teeth, loading my pack, eating breakfast. My food situation was not ideal, but still okay- I’d eaten my bread the night before but still had a granola bar and banana for breakfast, and I hoped it would be enough to keep me going until my lunch of cheese and tortillas and an apple and another granola bar. I had a few other snacks as well, but the day’s route was isolated and wouldn’t pass by any pubs or restaurants or stores. There was no good way to make coffee, but I tried anyway- dissolving a packet of instant coffee into some hot water, shaking it up and gulping it down. It was bad, but I think it got at least a little caffeine into my system, which I suppose is better than nothing? I left early, before 6:00am, and I was glad to be moving on. The camping barn was adequate but after my misadventures of the night before, I was ready for a new day. But within about 20 minutes of walking I realized that my body was tired. It was a particular kind of tired, and not the kind that I could shake after warming up my feet and my legs. It was a drained kind of tired, and later I would wonder if it had anything to do with not eating enough the night before. In normal life, a dinner of quinoa and bread wouldn’t be a lot but it would be enough. Maybe I wouldn’t be satisfied, maybe I would be tired the next day but it wouldn’t really affect me too much. 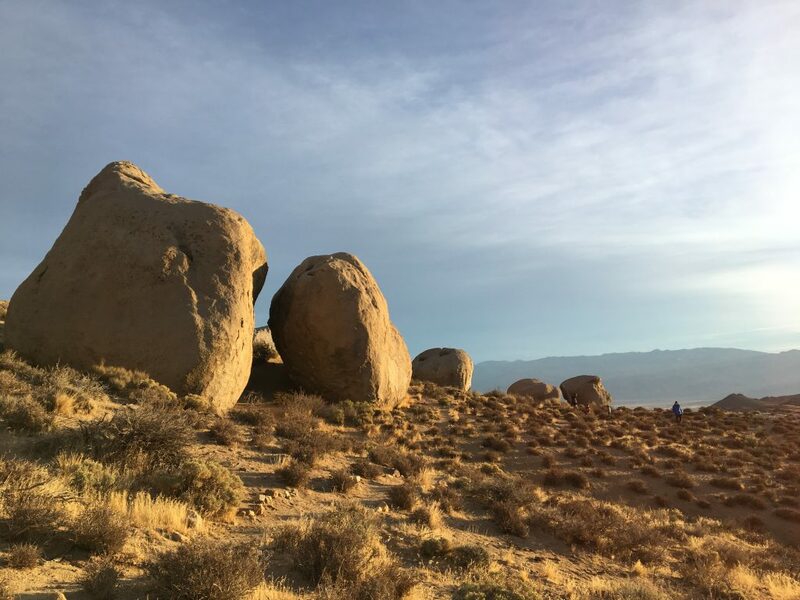 But when hiking day after day, on an often strenuous route no less, my body was burning through the calories and needed the right kind of nutrition. Or, who knows, maybe the Pennine Way had just tired me out, and I was having an off day. In any case, my weariness persisted the entire day. Just about every single step felt like a great effort and it was probably one of the most difficult days of walking I’ve had yet. 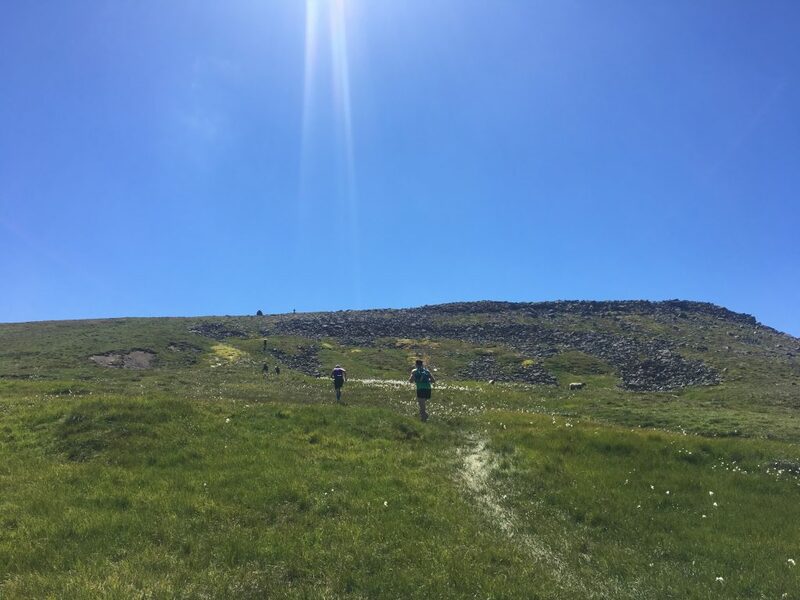 This was also the sort of day where the mental challenge became almost as difficult as the physical challenge: I had to work hard to keep my mind focused, to not overwhelm myself thinking about all the miles I still had to walk, to not stress over the challenging sections ahead. Because this day’s stage, from Holwick to Dufton, wasn’t going to be easy. 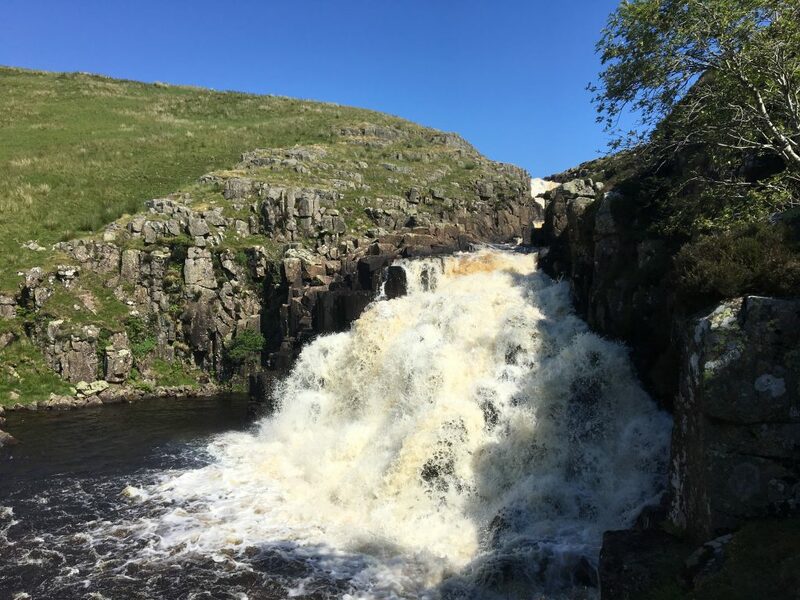 It’s one of the more popular stages of the Pennine Way because it passes several great spots: three big waterfalls- Low Force, High Force, Cauldron Snout- then a long, slow ascent up to High Cup Nick, one of the most iconic images of the Way. And I had a great day for it, too, another day of blue skies and sunshine, but almost from the get-go I couldn’t enjoy it. As I walked, all I could think about was sitting down. I fantasized about a food truck appearing in the distance. I pictured a bed with fluffy blankets and lots of pillows. I wasn’t enjoying the walking, and I also couldn’t whip out my phone every few minutes to take photos, because the battery was almost dead. Every time I reached a waterfall I’d pull out my phone, turn it on, take a photo and then turn it back off. And then I’d keep walking, moving slowly, my head down, counting steps, trying to distract myself from how tired I felt. One of my worst parts of the entire Pennine Way came in the approach to Cauldron Snout. 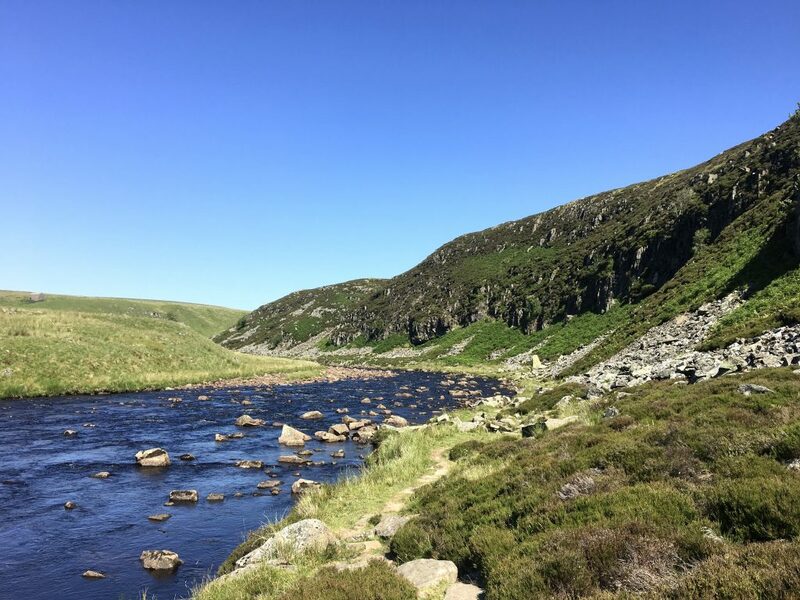 It was a flat section of the route that ran along the River Tees, but the path was through what felt like a small boulder field clinging to the side of the river bank. This section took me forever- I had to watch every footstep so carefully, picking and choosing where to take my next step, needing to climb up and over rocks, watching my balance. I nearly stepped on a dead sheep (this is probably way too much information, but it just felt like either a bad omen or else more proof that the day was not a good one), and when I finally reached the end of the boulders I had to scramble up a rocky wall alongside the raging waterfall of Cauldron Snout. I climbed up the rocks mostly on my hands and knees and when I reached the top I stopped for a long break, relieved that I’d made it. 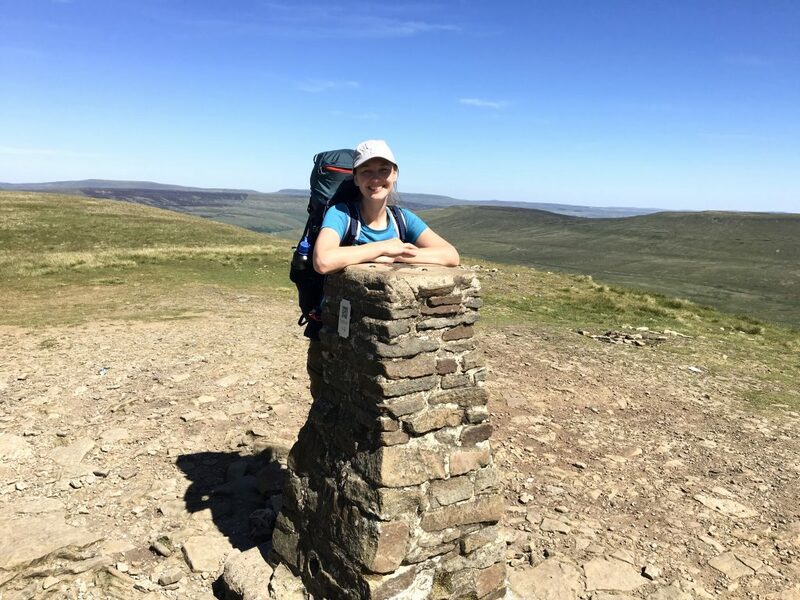 The scramble wasn’t dangerous or even too difficult (I thought the scrambling section up Pen-y-Ghent was harder), but I was bone-tired and scrambling makes me nervous even on a good day. And despite how difficult the day’s walk had been, I had to agree. I was lucky to get to do this. 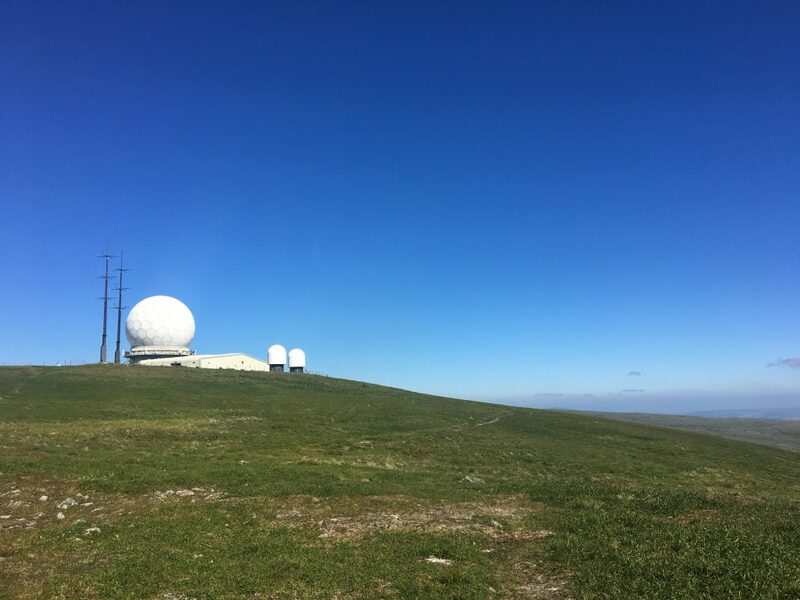 I was lucky that the weather had been so beautiful, that- aside from my first day– navigation had been easy, lucky that the ground wasn’t boggy, lucky that my socks and shoes could stay dry. I was lucky that my mishaps so far had been small, lucky that it was only fatigue that I had to walk through, and not something much worse. 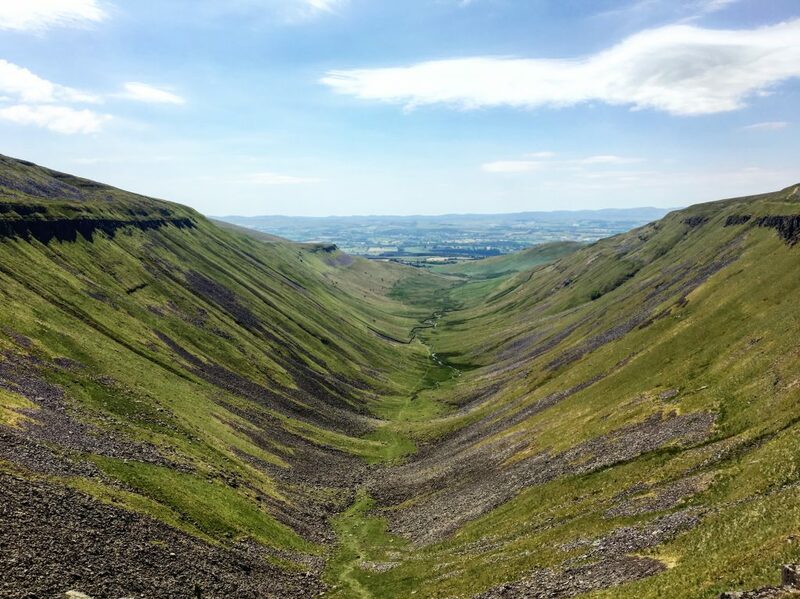 High Cup Nick was, indeed, beautiful, and the few photos I was able to take on my now nearly charge-less phone don’t do the landscape justice. If there is ever time for a wide-angle lens, it would be here. But it’s not about the photos, is it? It was about my ability to sit at the rim, peel off my shoes and socks, lean back on my pack and lift my face up to the sun. It was about a good chunk of cheese and a crisp apple, chocolate that hadn’t yet melted. There was a large school group off to my right, the kids must have been between 8 and 10 years old and I watched them, how they listened to their leaders talk about how the valley was formed, how they smiled and laughed, how they dutifully went off into the bushes for a bathroom break before continuing their trek. A couple other hikers drifted in and out, but after the school group left I had the view mostly to myself. And then I carried on, and although my body was tired, the walking from here on out wasn’t too bad- just four more miles until I reached Dufton, all downhill. 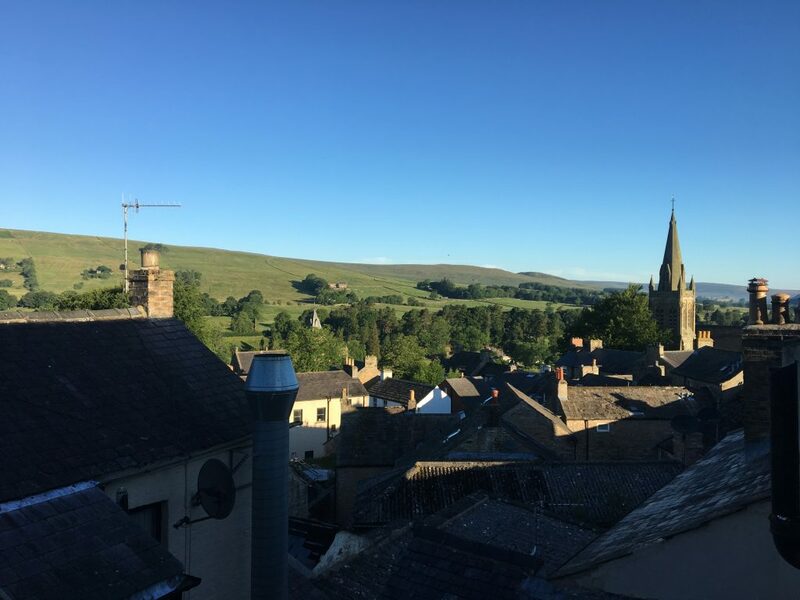 Dufton is a small hamlet, not much more than a few streets, a restaurant, a corner shop and post office, a youth hostel (completely booked) and a camping caravan park. I walked through the village and before figuring out my campsite for the night, I made a stop at Post Box Pantry, the little corner shop. I walked inside, then had no idea what I wanted. Do you ever have those moments when you’re just so tired that you can’t make basic decisions? I looked at the food on the shelves, I looked at the small menu, and then I ordered a strawberry milkshake. 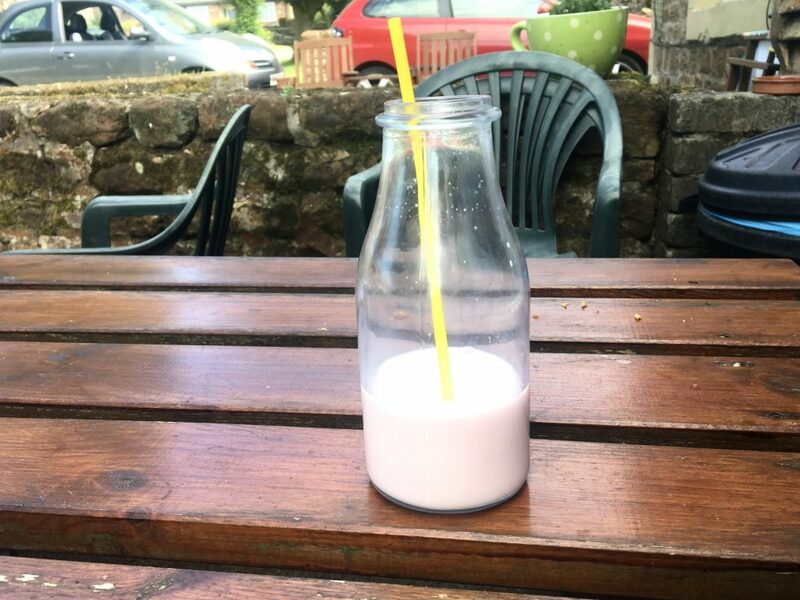 But the milkshake wasn’t really a milkshake, not the kind with ice cream anyway, and I was handing a large glass of pink milk and so I took it outside to drink it on a bench in the sun. This had been my dilemma, too, when I’d been making reservations. There were no beds available at the only Inn or in the hostel, and so I’d settled on a campsite. But now hearing that being shuttled out of Dufton and back in had been an option, I realized that maybe I hadn’t needed to bring along a tent at all. But before I could sink further into these thoughts, the Dutchman introduced yet another stress. Far off in the distance, way above the village and into the mountains was a round, white radar station. It was jut a pinprick on the horizon and tomorrow, I would have to walk up there, and then I would have to keep going. I couldn’t imagine having the energy. I pushed those thoughts away, too, telling myself that I’d worry about that tomorrow. So I finished my strawberry milk, said goodbye to the Dutchman, hoisted up my heavy pack and headed off to my campsite. Once there, I found a sign that said I needed to call a number to check-in. My phone was dead (and I didn’t have an international calling plan or a local SIM card so I wouldn’t have been able to call if I tried! ), but there was an address listed on the sign so I set back out. I arrived at a house with a fenced in yard, so I let myself in though the gate but stopped short when I heard loud, angry grunting coming from a small enclosure. I waited, and then a huge black pig appeared, and can pigs ever be aggressive animals? Because this one did not seem happy to see me. And why in the world was I standing in someone’s yard, in a showdown with a pig? Things were getting stranger and stranger. But I was in the right place and a man came out and took me back over to the campsite, showing me where I could set up my tent. It wasn’t the most ideal situation- I was on a patch of grass in the middle of a circle of camper vans, where people were parked on holiday. There were no other tents and for the life of me I can’t figure out where other Pennine Way walkers stay in this village. Maybe there weren’t other walkers that day, maybe they’d taken up all the rooms in the Inn. My heart sank. I needed dinner that night, I couldn’t face the possibility of another difficult day on not enough calories. The corner shop had already closed so there wasn’t the possibility of buying food items there at this point (note to self: stock up when you have the chance!! ), and so the restaurant was my only option. This is something that I wished my guidebook had pointed out. Maybe I was supposed to have known that I needed to make reservations at restaurants (and not at pubs? ), but there was no mention of this in my guide and I assumed that as long as I showed up at the right hour, I would be able to order some food. But this was now the second night in a row where I was running into problems! After I showered and washed my clothes and set up my tent, I went over to the restaurant. It was around 6:00pm, and I went to the bar and asked about the possibility of food. The response was along the same lines of what the owner of the caravan park had given me, and once again, the barmaid looked at me a little sternly, showing no sympathy. But I persisted, asking if there was any way she could ask the chef if he could fit one more meal in. She disappeared into the kitchen, the came back a few minutes later. Nearly two hours and a couple of beers later, a piping hot meal was placed down on my table. I ate every single scrap and then left a very generous tip that I hoped would make its way to the chef. The sun was beginning to set as I arrived back at the caravan park, but the golden light was still pouring onto my tent and the inside was toasty, and warm. I snuggled deep into my sleeping bag, my belly finally full, listening as children and dogs ran together in wild glee, watching their shadows dance across the walls of my tent, watching as the light dimmed and faded to darkness. 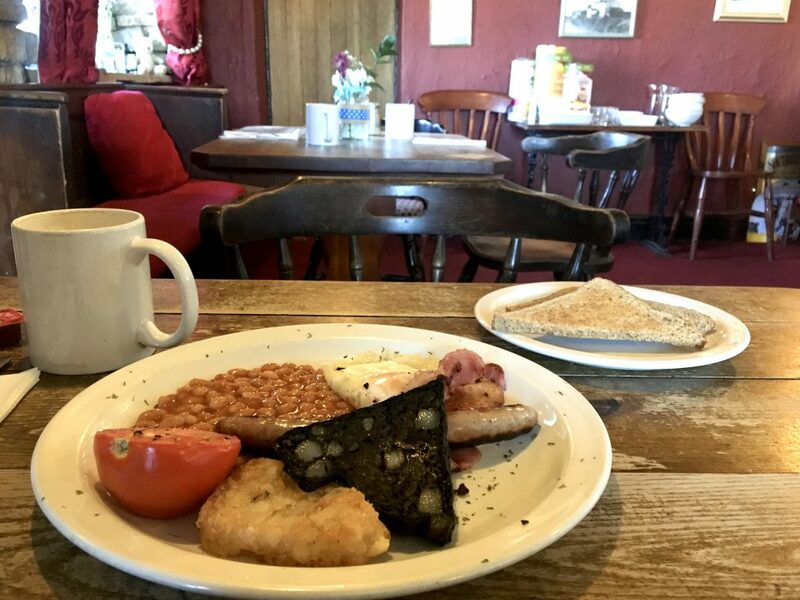 Day 9 on the Pennine Way started with another full English breakfast in the dining room of the Tan Hill Inn. Actually, it started with something better. 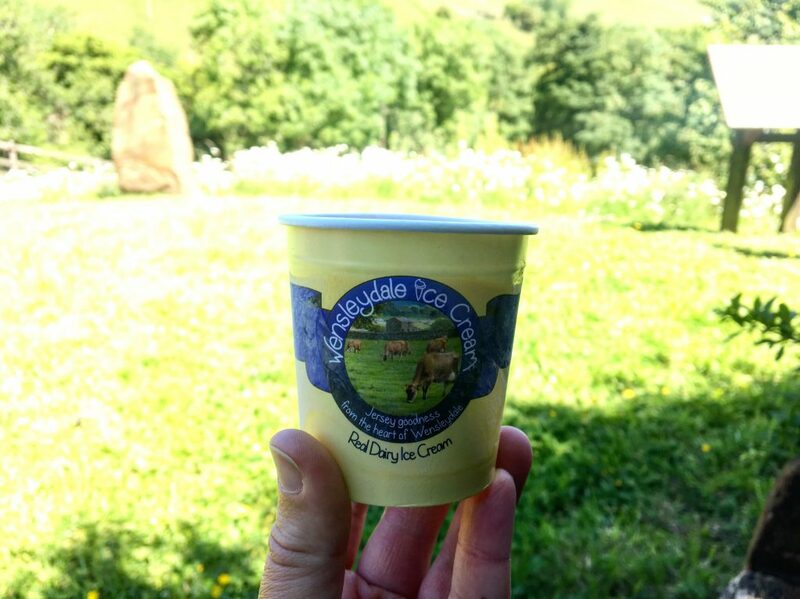 Have I mentioned my little trick when it comes to breakfasting on the Pennine Way? When I stayed in a bunkhouse or B&B that served breakfast, I’d make a note of the starting time and always arrived at least 5 minutes early. Often I was the first one there, and the tables were set and the cooks were in the kitchen. Within moments I’d have a hot cup of coffee and my breakfast ordered placed, the food being cooked up quickly. I could have a good but fast breakfast and be out the door before others had even tucked into their eggs. But on this morning, in Tan Hill, I experienced a little coffee magic. The owner or manager of the Inn, who I’d seen milling around the night before, came over to my table. Now I’m not sure if I got the cappuccino offer was because I was early, or because he offers cappuccinos to everyone (I didn’t hear him offer one to anyone else, but I could have been mistaken), or who knows, maybe he was being extra friendly and trying to flirt by offering me good coffee (and if so, he was on the right track). In any case, you better believe I ordered the cappuccino and the coffee was strong and milky and GOOD. 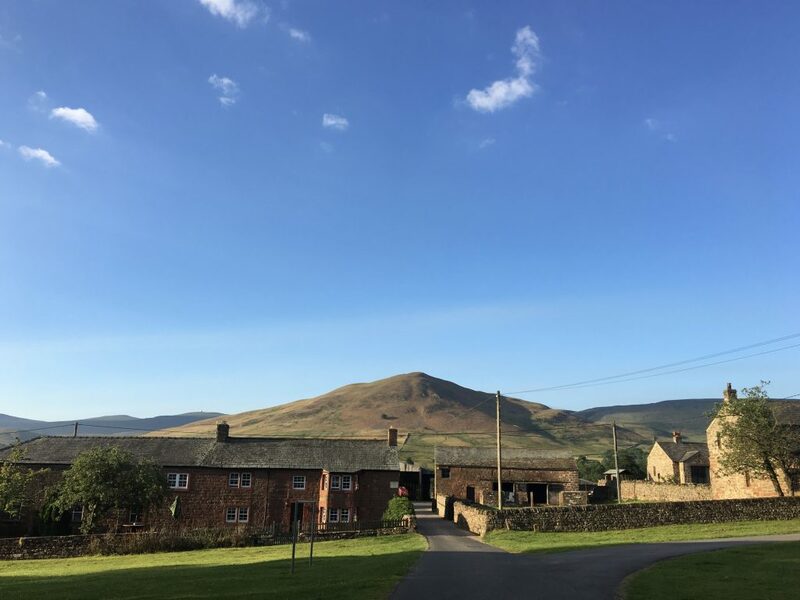 I think I said this in my last post but I’ll repeat it one more time here- if you’re planning a walk on the Pennine Way and are interested in staying in the Tan Hill Inn (Britain’s highest pub and all-around cool and isolated place), consider booking a bed in one of the bunk rooms. I lucked out and had the room to myself, but even if you have to share it’s a good deal. The beds are basic but comfortable, you get a towel (a towel!) and use of a bathroom with a shower and a tub. Breakfast is included in the price and if you’re lucky and smile at the cute owner, you might just get yourself a cappuccino too. But back to business, I had walking to do. I finished breakfast, laced up my shoes, and headed back out into the wide open countryside. As usual, it was another blue sky day with full sunshine. 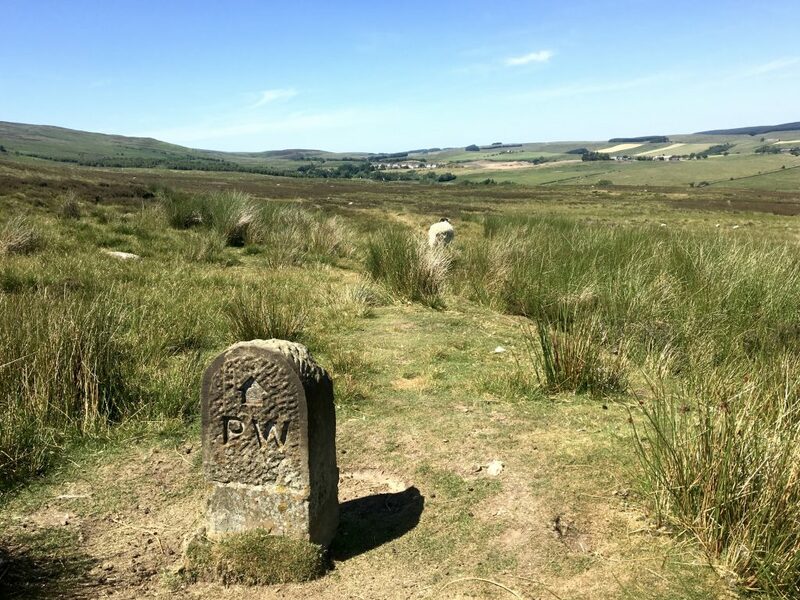 The walk out of Tan Hill through Sleightholme Moor can be boggy (and probably IS boggy 99% of the time), but aside from a couple slightly wet sections, the walking was dry and not too difficult. In foggy conditions I imagine it would be really difficult to follow the path; even on a clear day, it was hard to keep track of the faint trace of a path through the tall grass. 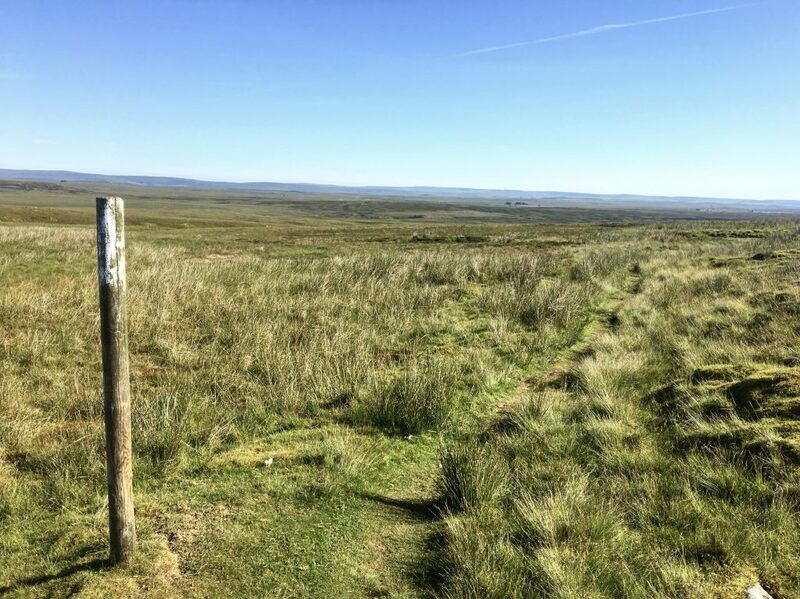 My guidebook recommended keeping an eye out for the white posts that dotted the landscape, and this is how I followed the path out of Tan Hill: scanning the open field for a marker somewhere far in the distance and when I found it, I’d head there, then start scanning for another. The walking went on and on, and I remember it being mostly pleasant and not too strenuous. 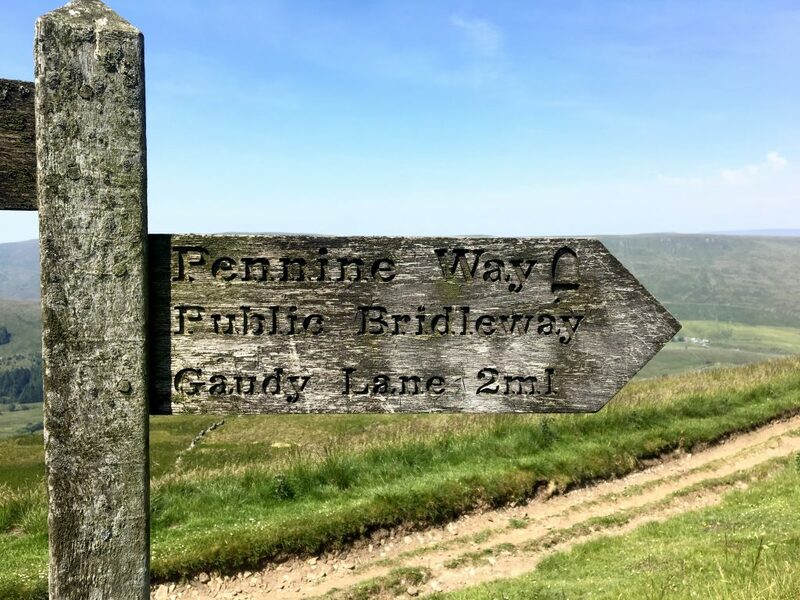 After a few hours I reached a milestone: I was halfway through the Pennine Way! Just a little past the halfway point I stopped by a small hut; there aren’t a lot of these on the route, but when the weather is bad I can imagine that being able to stop and rest and get out of the rain would be most welcome. I only stayed for a few minutes, taking time to read some of the notes left on the walls. The one pictured below caught my eye; what an incredible way to honor a 50th birthday! And those words- “Enjoy the freedom”- echoed in my head as I continued to walk and walk down the trail. 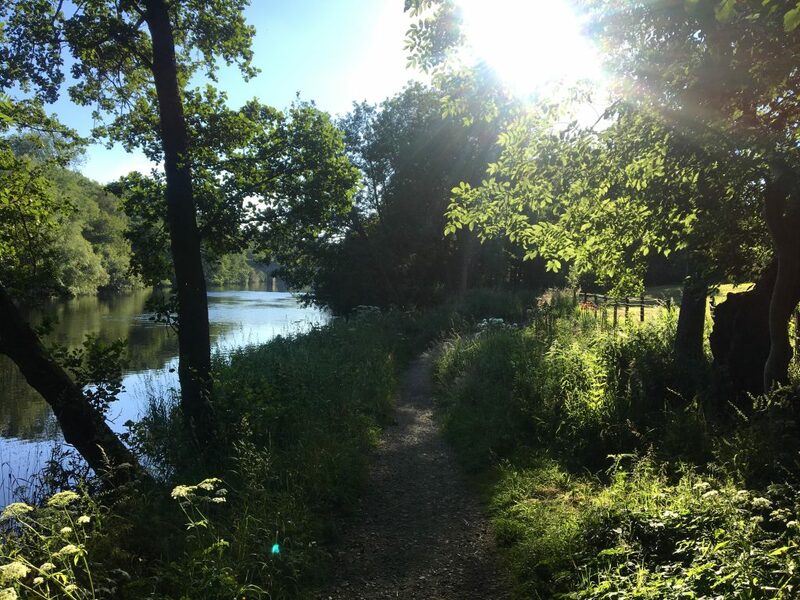 The freedom to walk under trees and through meadows and along the reservoirs, the freedom to kick off my shoes or drink deeply from my bottle of water, the freedom to walk as fast or as slow as I wanted or needed. 7 more miles to go, and on tired but content legs I walked into the very charming village of Middleton-in-Teesdale. I wouldn’t be staying here; my reservation was in a bunkhouse another 3-miles down the path, but I stopped in the village to look around and buy some snacks for the next day. I was feeling happy. It had been an all-around good day on the Pennine Way. 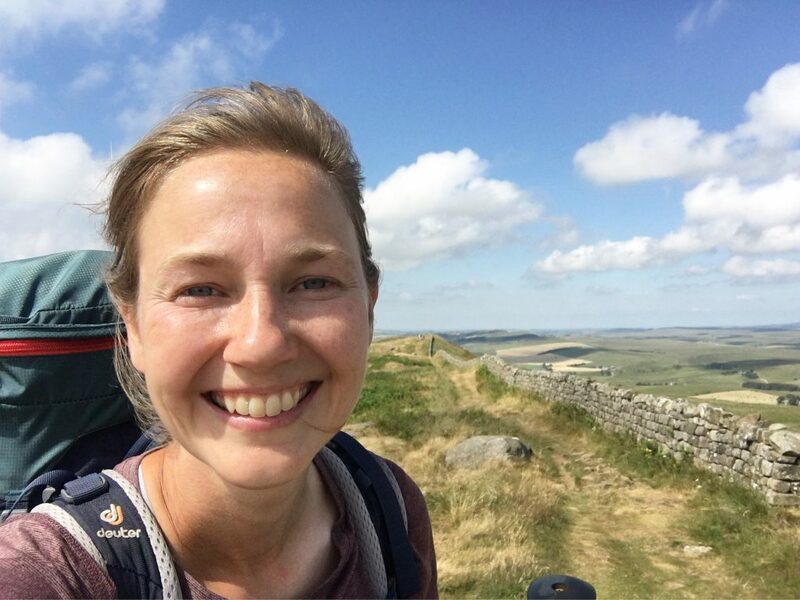 The sun was shining and I was smiling and even though I was tired, I felt good as I walked away from the village and onwards to my bunkhouse. Everything was going fine as I continued to congratulate myself on a walk well done when, all at once, things took a turn. My reservation was for Low Way Farm Camping Barn, and my guidebook’s very basic, hand-drawn map showed the location of the barn to be in the middle of a field. 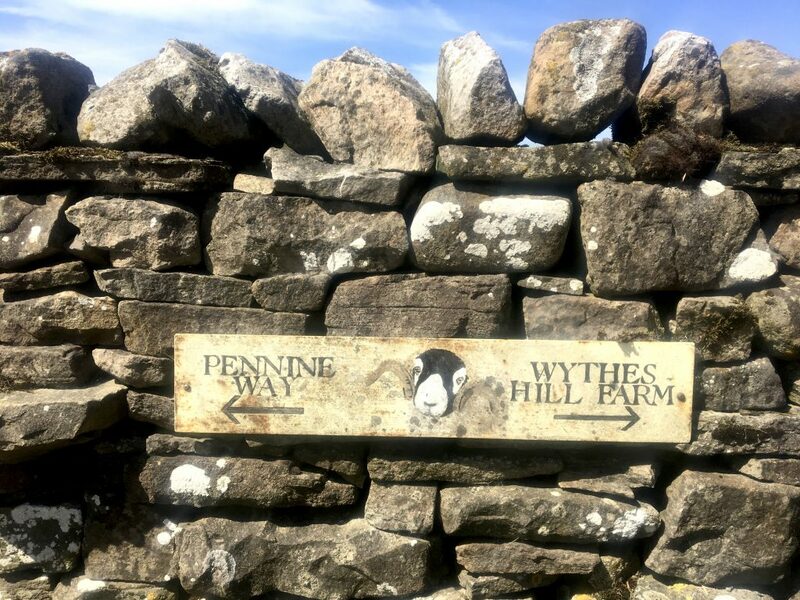 There was a faint, dotted line on the map, veering off from the Pennine Way and straight towards the camping barn and so I assumed I would be looking for some sort of path. I walked up, I walked down, I walked back and I walked forth, over the same stiles and stone steps and through the same gates several times. I could see a few buildings in the field, so I headed towards one, making my own path through the tall and rough grass. I arrived at the first stone building, circled around it a few times, peered in windows and shook on the locked doors. There was no one around and there didn’t seem to be much going on in the building, either, but I thought that perhaps this could be my camping barn. I wasn’t sure. I scratched my head, considered the expanse of green field, and continued walking. 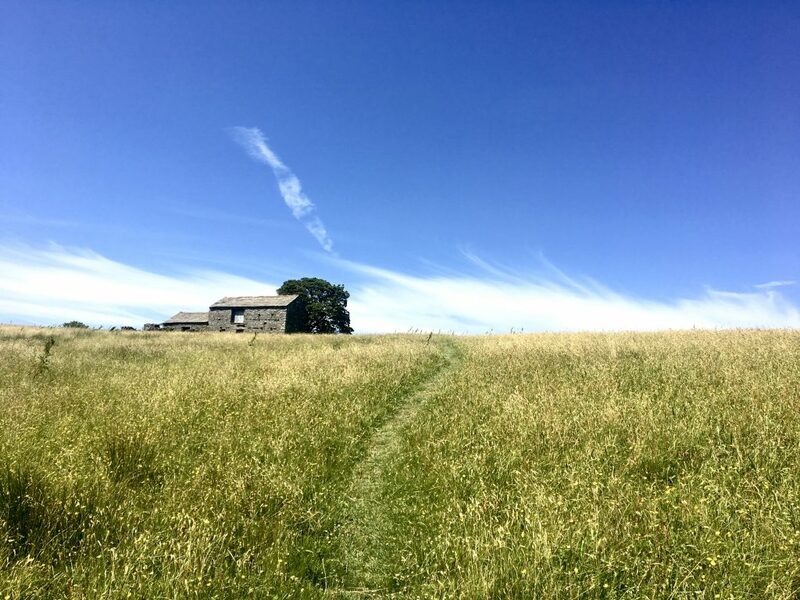 Back to the the path of the Pennine Way, up and down and back and forth, through the fields again to try another building, with no luck. So then I set off further into the fields, attempting to reach a road that was running parallel to the Pennine Way. I went up and over hills, to climb over fences I had to navigate around barbed wire, I wasn’t entirely sure where I was going but I could hear an occasional car drive by so I knew I was close to the road. And once I arrived at the road, I easily found the pub where I planned to have dinner later that night. It’s not that I’d been lost at any point, it’s just that I couldn’t for the life of me figure out where my camping barn was! I headed towards the pub to ask for help but before I could get inside, a white van pulled up beside me, the window rolling down. This was the owner of the camping barn, and she’d come to find me. I suspect that a farmer must have seen me wandering cluelessly around the fields and sent out the SOS on my behalf. Who knows. I was just grateful to have a key in my hand and easy directions to my accommodations. I followed a gravel path and arrived at one of the stone buildings I’d been convinced couldn’t have been the camping barn. From outside the building I could look across the field and see exactly where I’d been traipsing up and down, hopelessly confused. I think my wanderings cost me nearly 2 additional hours of walking- you should have seen the things that came out of my shoes! 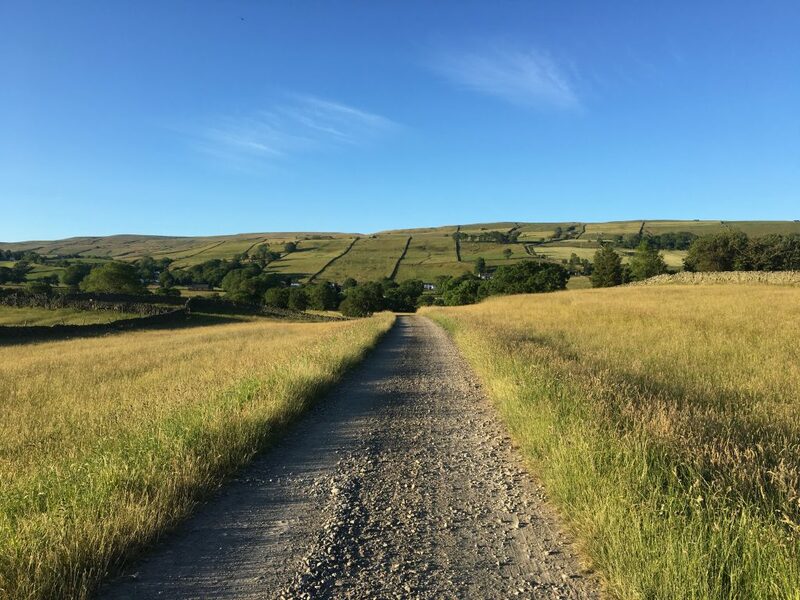 The owner of the barn had warned me that the pub might stop serving food around 7:30, so I showered as fast as I could and then raced back out again: up the gravel path, over the hill, down the road where I arrived, breathlessly, at the pub. I checked the time on my phone. 7:18pm. “Perfect,” I breathed to myself. I went inside, up to the bar, and was promptly informed that the kitchen had stopped serving food. I’m not sure what I said, though I probably asked if they were sure that no food was being served. I didn’t want to beg but I certainly pleaded, explaining that I was walking the Pennine Way and that it had been a very long day. The woman behind the bar didn’t seem to care, she just shrugged and said I could order a beer. I sat at a table, watched as another couple were served heaping plates of hot and delicious-looking food, drank my beer quickly and then headed back out: down the road, onto the gravel path, over the little hill, past the sheep in the field, into my camping barn. How many miles did I end up walking that day? A lot. Over 20. I was alone in the camping barn, and feeling very alone in general that night. 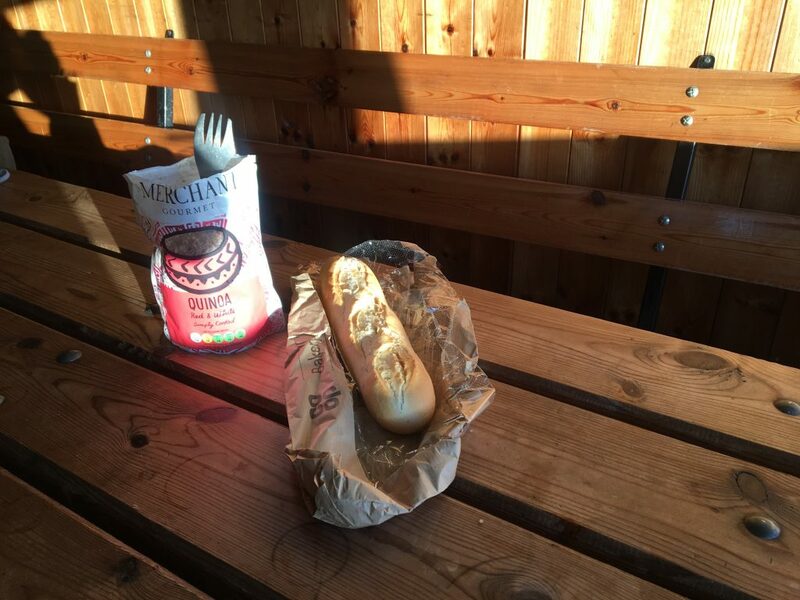 I opened my pack of emergency quinoa, tore off a hunk of bread that was supposed to be breakfast the next morning, and sat glumly on a bench, eating my simple dinner. I had enough food, I’d found where I needed to be, I had a bed to sleep in and my body was tired but feeling fine. All of this was true, all of it was important, but I still felt kind of defeated. But the light in the fields was golden, and little sheep wandered up to my door, sometimes peering inside. I still had a couple ginger cookies left and so I ate them and read more of Jane Eyre, I read in the dimming light until I could no longer see the words on the page. When setting out to do a long-distance walk, there are going to be all kinds of days. Days when the rain obscures the beautiful views (like this, and this); days when you feel sick, or tired, or unenergized; days when you forget your passport and have to take a taxi all the way back to where you started. But then there are the days when everything just seems to work out. The cafés and pubs are open, and they appear just when you need them. 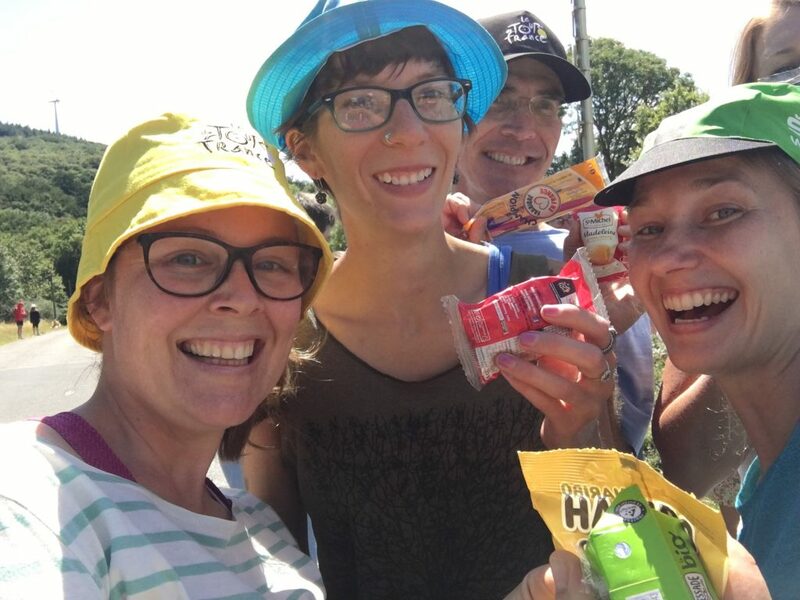 You pass an honesty box with ice cream in the middle of a warm afternoon. The skies are blue. Your legs are strong. The day ends with a pint of beer at a bench in the sunshine. 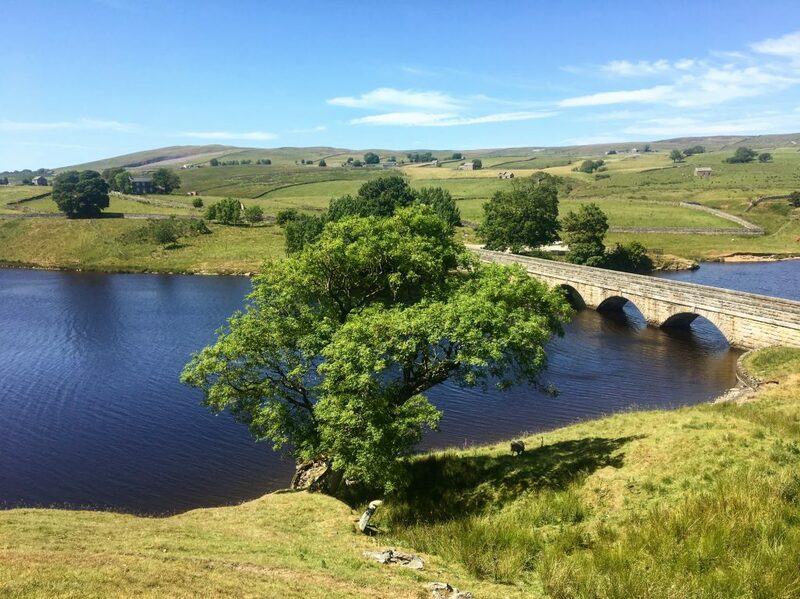 And this kind of perfect day is what I had on my eighth day of walking the Pennine Way. Blisters? What blisters? 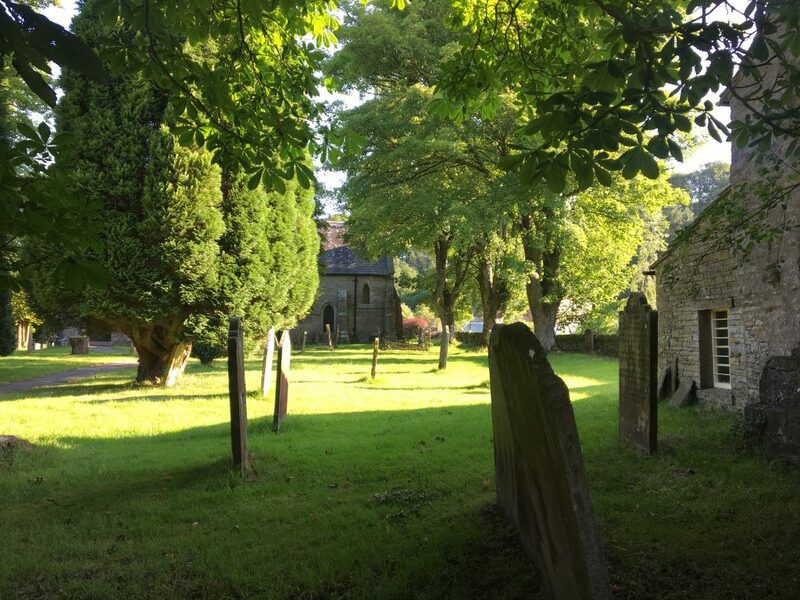 I left my lodgings at the Green Dragon Inn to another clear, crisp morning, the sun slanting through the trees and the tombstones in the little cemetery. 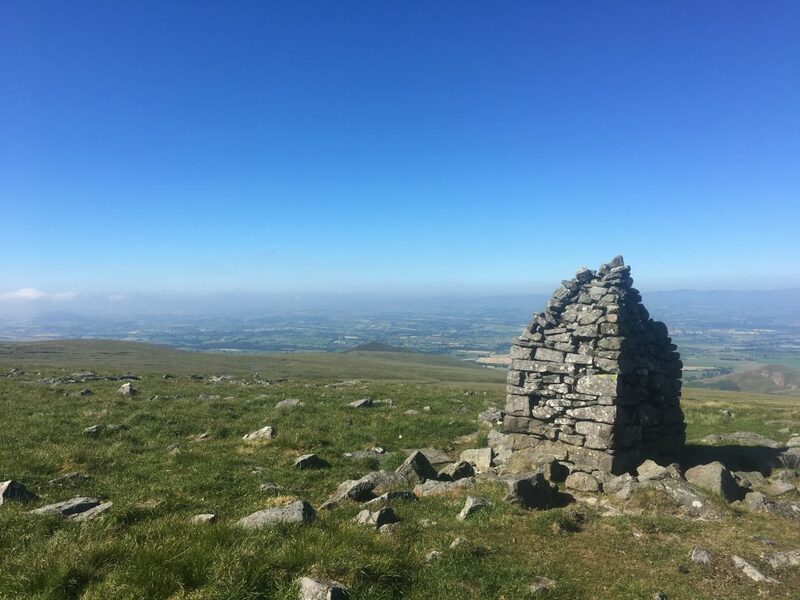 Almost immediately after leaving the village I began the long and steady climb up to Great Shunner Fell, an ascent of 2349 feet over 4.5 miles. I’d been dreading this climb. 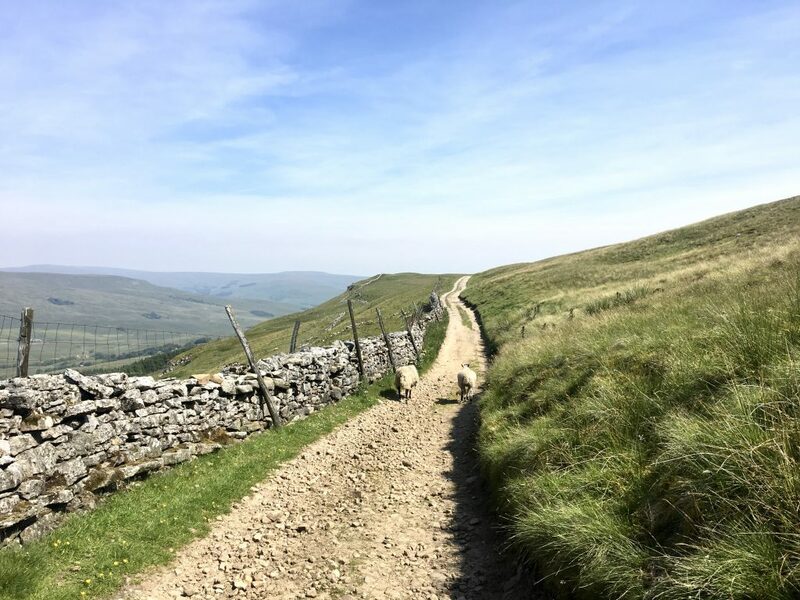 So far, I’d found the Pennine Way to be really challenging, due to a combination of a heavy pack, blistered feet, and difficult days. 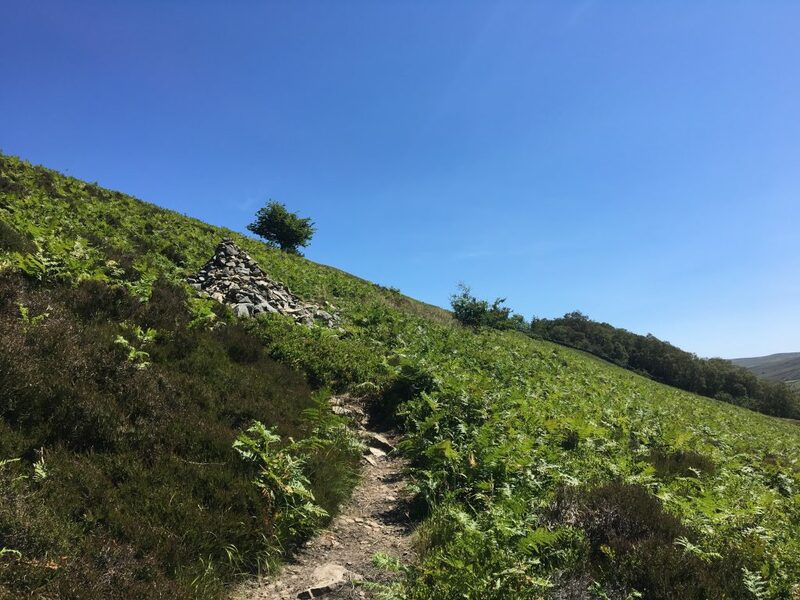 So I expected the climb up to Great Shunner Fell to be more of the same, but what a surprise to find that I moved steadily, almost easily! The four miles passed without too much effort, and suddenly I was at the rocky shelter at the summit. I sat for a few minutes, had a snack, and silently congratulated myself for a solid walk. But I didn’t need to stop long because I was feeling good, so I continued down an easy path to Thwaite, where I arrived just in time for the café to open. I assumed that since the café was 7 miles into the walk that I would be here in time for lunch, but I was making good time and it was too early to eat. So I ordered a mocha- a large, delicious, chocolate-y coffee drink- and sipped it slowly while resting my feet. 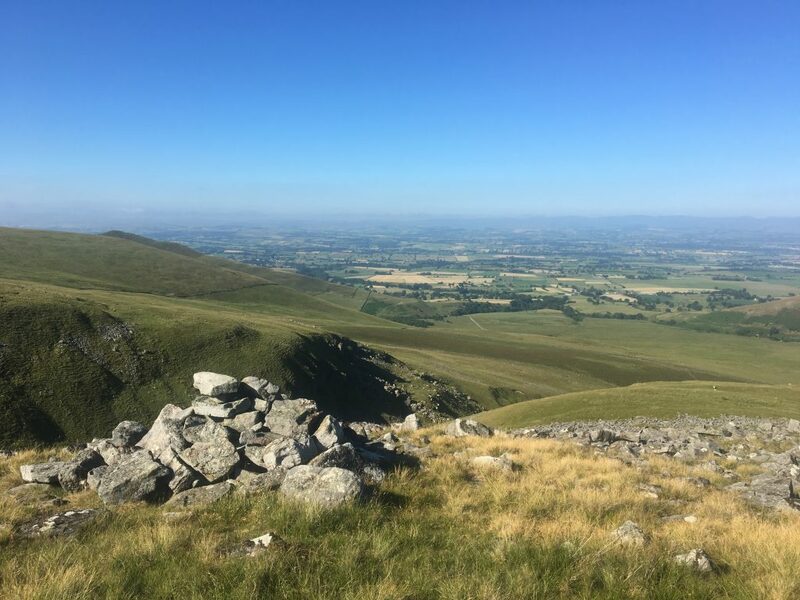 Before leaving the café I ordered a sandwich to take along with me, and then I was off again, a steep climb up Kisdon Hill, past sheep and little stone huts and waving fields of bright green ferns. I walked on a narrow dirt trail, winding past farms, up and up until the path flattened out and my views stretched over the valley below. I remember feeling so good as I walked, so happy. 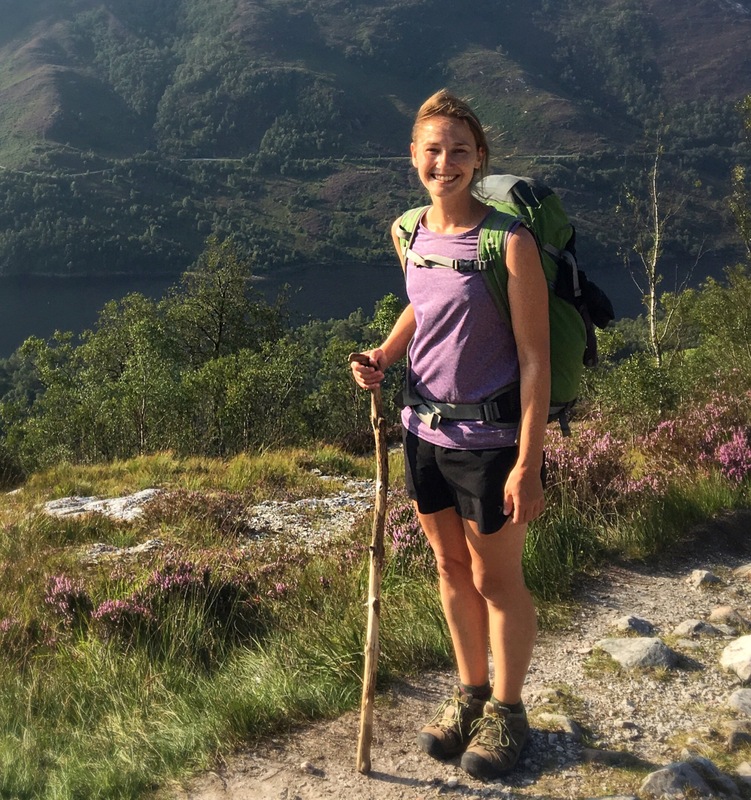 For the first time, my mind ran free: I didn’t have to think about the pain in my feet, or worry about losing the path, or focus on how tired I was or how heavy my pack felt. Finally, the walking felt good, and easy. I’d adjusted to the weight I was carrying on my back, my legs were strong. The sun was shining and the path stretched out before me and I didn’t have a care in the world. Soon enough the path led down to Keld, where I found more people than at nearly any other point on the Pennine Way. 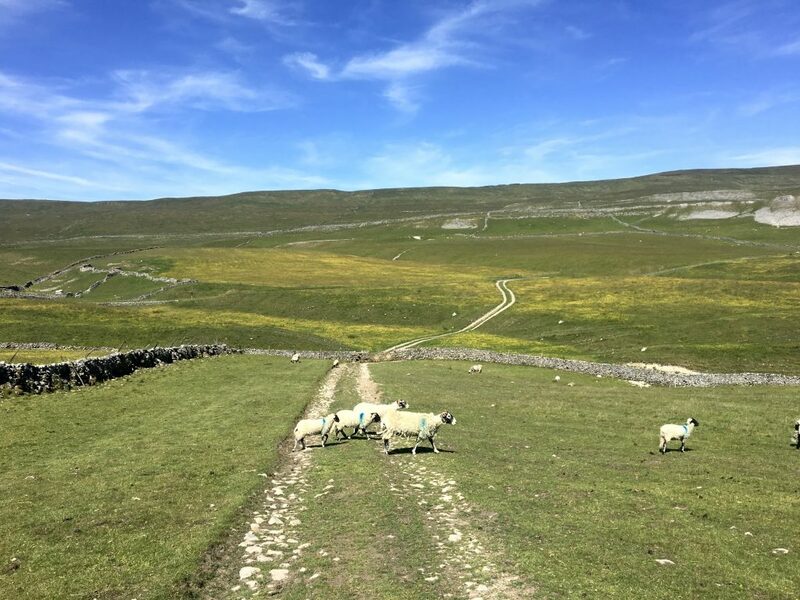 Keld is where the Pennine Way overlaps/intersects with the popular Coast to Coast trail (one for the future, perhaps? ), and it’s a popular stopping point. I would be walking another four miles to Tan Hill Inn, but I couldn’t resist a stop here. I found a bathroom, a little shop selling small tubs of ice cream, and a tucked away “Well-being garden” (isn’t that a charming name?) where I sat on a bench, ate my sandwich, then my ice cream, and looked down over the village. 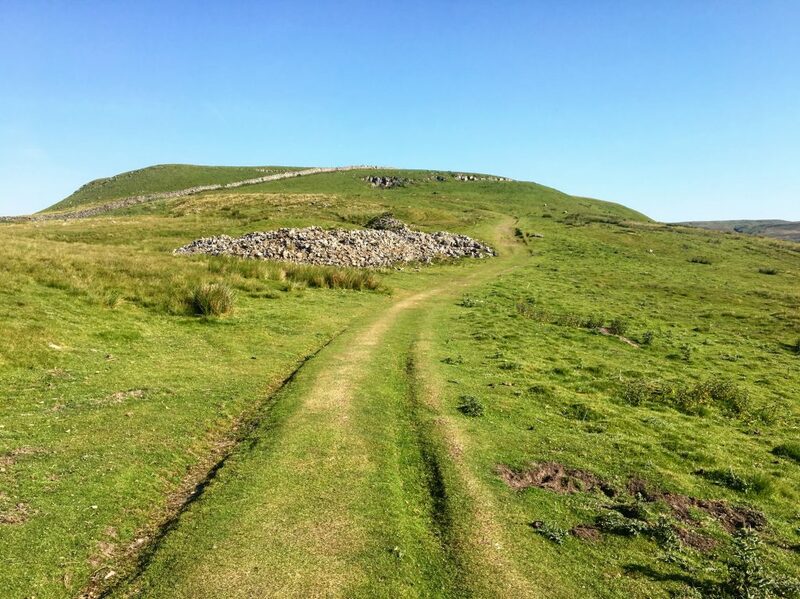 The rest of the walk to Tan Hill Inn was a bit of a slog, and I was beginning to feel the strain in my legs, but I just kept going (what else is there to do?) and before long a building appeared, far in the distance. 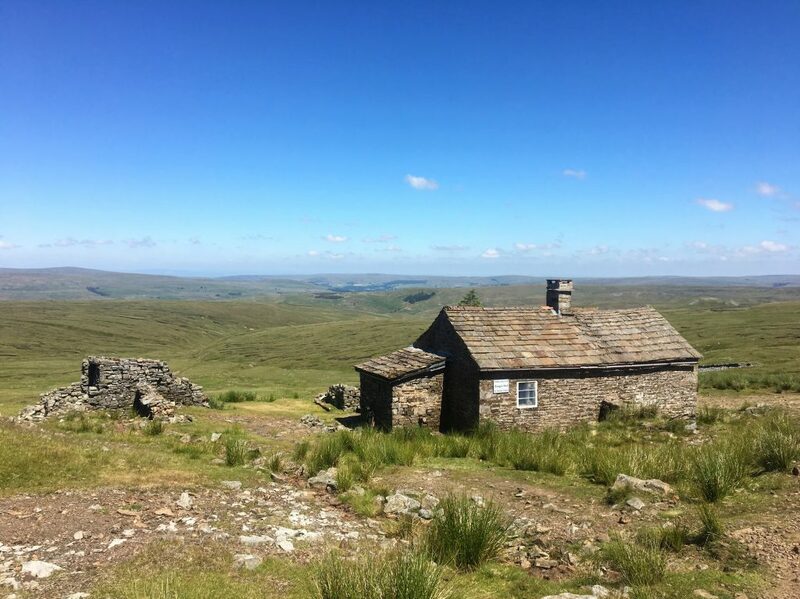 The Tan Hill Inn is known for being the highest pub in Britain, and the building sits totally alone and isolated in the vast moorland of the Yorkshire Dales. I could see it from at least a mile away, just a speck in a wild and lonely landscape. The building dates back to the 17th century, and in the 18th century was used as an inn for the miners. Supposedly there used to be smaller miner cottages scattered around the inn, but they were all torn down in the early 20th century. 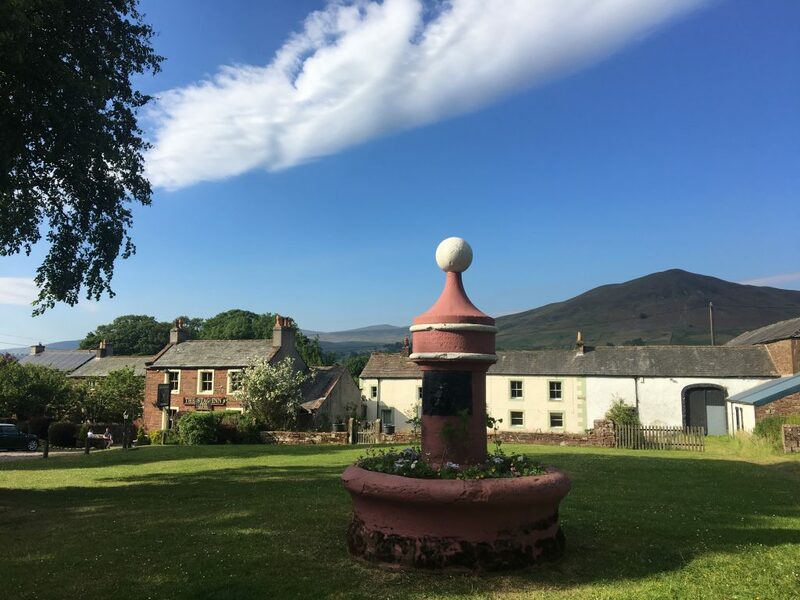 Now the inn is all that’s left, and it’s become a destination for walkers, bikers, tourists and, according to the website, “bohemian like-minded individuals”. There’s an open fire that’s been burning for over 100-years, and scores of ghost stories as well, but I didn’t know any of this when I walked up. I just saw the picnic tables in the sun, lots of people milling around, drinking beer, laughing and telling stories. Inside the pub there were several cosy dining rooms, and after checking in at the bar, I was led up to my bunk room. (In addition to two bunk rooms, there are also nicer Inn rooms as well as campsites out back). I’d reserved a bed in one of the two bunk rooms, and as usual, had the place entirely to myself. 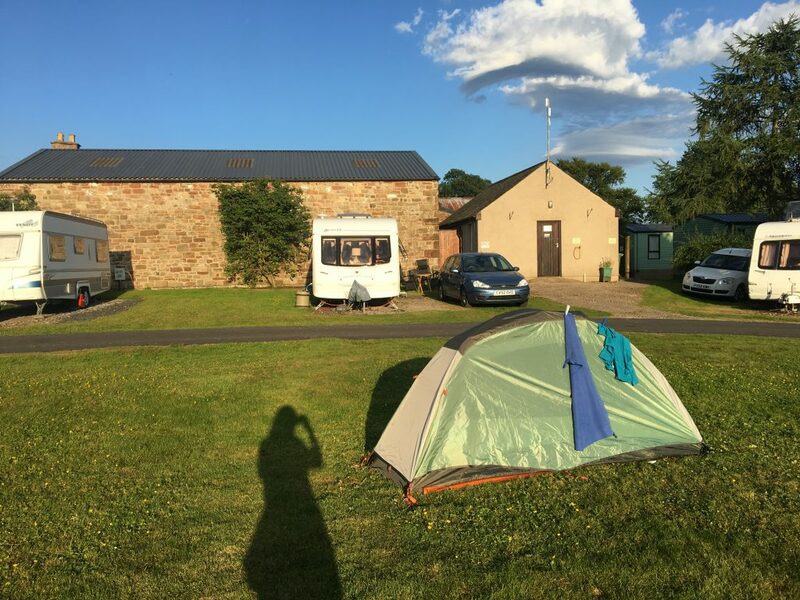 There was a towel on my bed and breakfast would be provided the next morning- I was beginning to think that I’d cracked the secret of the accommodation on the Pennine Way! 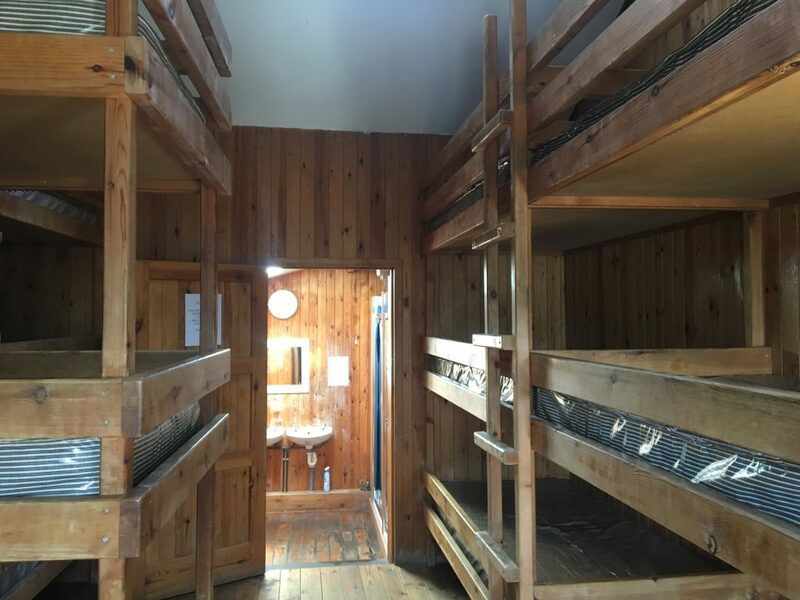 Bunkhouses: less expensive than b&bs and more comfortable than camping, and if the timing is right, you’ll have the rooms to yourself! I didn’t encounter any ghosts that night- none that I knew of, anyway. 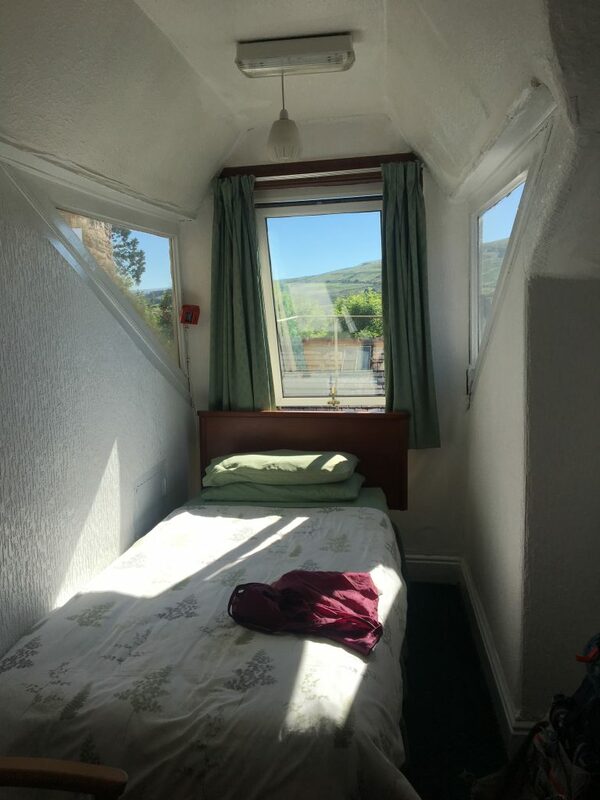 Instead I settled in for a relaxing evening: a beer in the setting sun, a warm meal in the pub, a cool breeze from the open window next to my bunk bed, where I tucked myself under the blankets, nibbled on a ginger cookie, and opened to a new chapter of Jane Eyre. A day of walking doesn’t get a whole lot better than that. 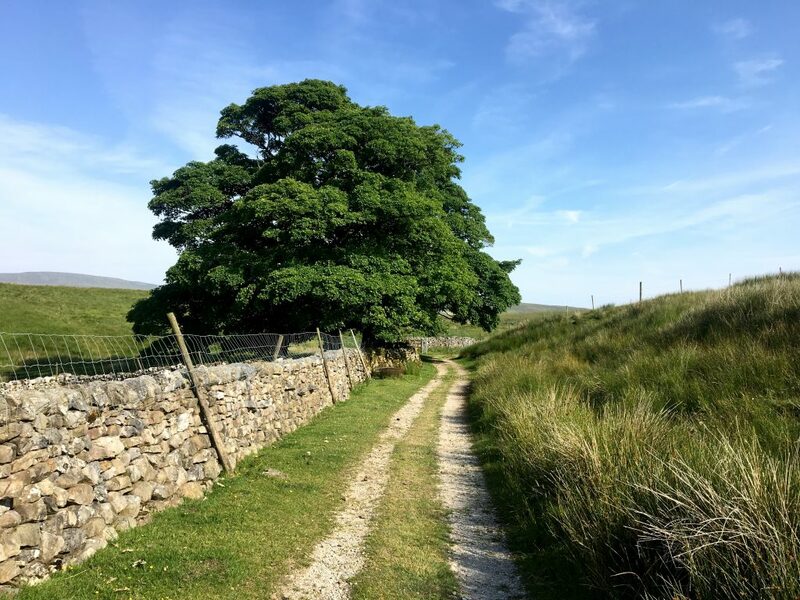 Time for another Pennine Way post! Yes indeed, these recaps are rolling out slowly; every time I sit down to write I think, “This is the time I’m going to write as many posts as I can and just get through the re-telling of my Pennine Way journey!” I tell myself that I will combine days, that I’ll just give highlights, I’ve even thought about using very few words and lots of photos. And maybe I will, eventually, recap the days in an efficient way. But for now, each time I sit down to write, I look through my photos and read the notes I took (if I have any), and I become immersed in memories. And then as I write, I realize that I am trying to find the story of that particular day. 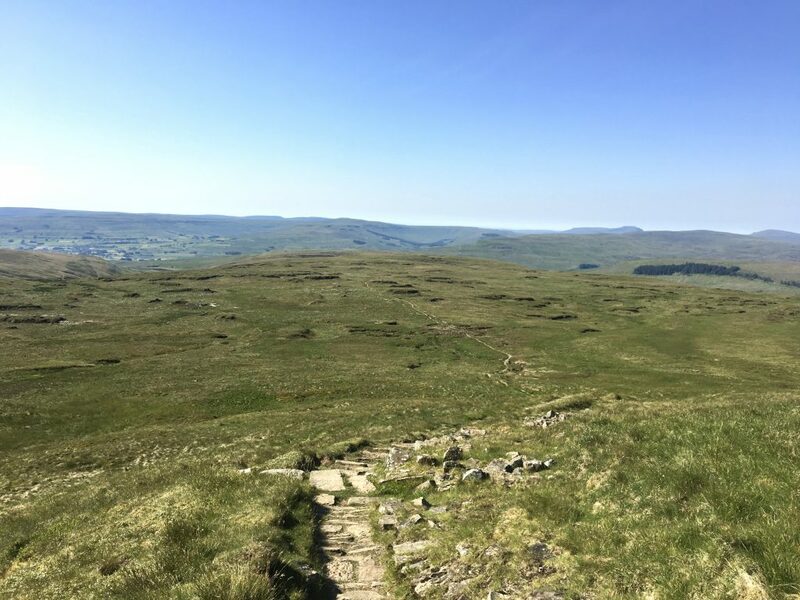 So what, then, will be the story of my Day 7 on the Pennine Way, a 15-ish mile stretch from Horton-in-Ribblesdale to Hawdraw? This wasn’t an eventful day, in fact, it was fairly straightforward. 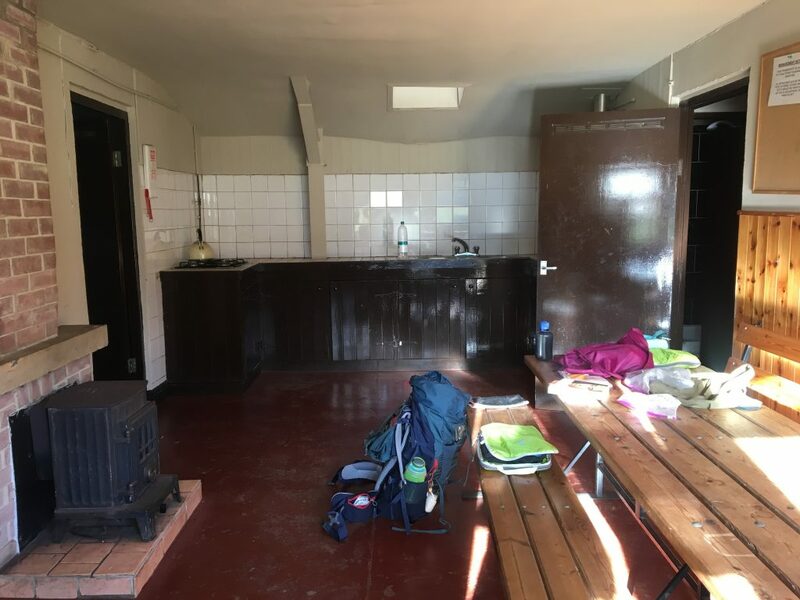 I woke in my empty bunkhouse at the Golden Lion Hotel, splashed water on my face, threw on my hiking clothes and stuffed my items into my pack. 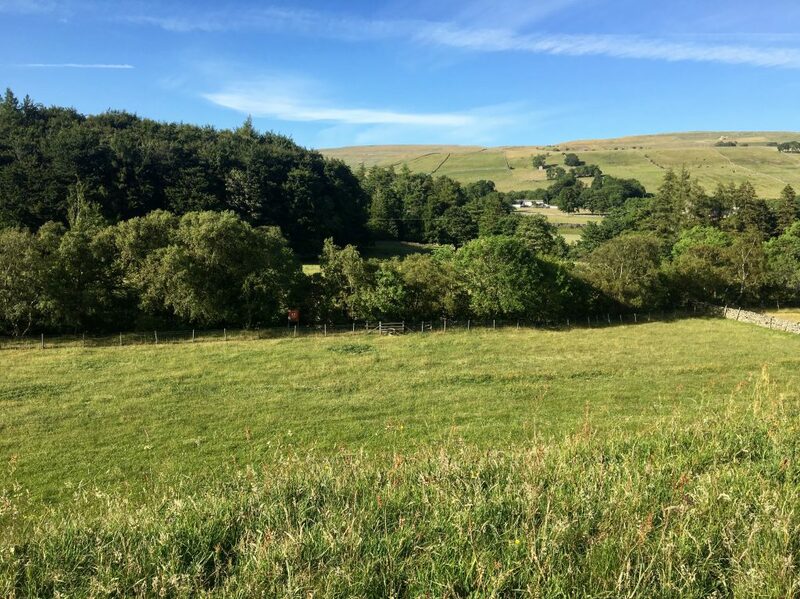 It was early- just before 6am- but the night before, David (my fellow Pennine Way walker who’d helped me find the right path on Day 1) had inquired about an early breakfast and the owner of the hotel agreed to leave out basic items so that we could eat whenever we wanted. When I arrived in the dining room David and his nephew were already there, and before I could even sit down, the nephew had jumped up and run into the kitchen to bring me a cup of coffee. We ate cereal and toast and fruit, paged through out guidebooks, talked about the days ahead. 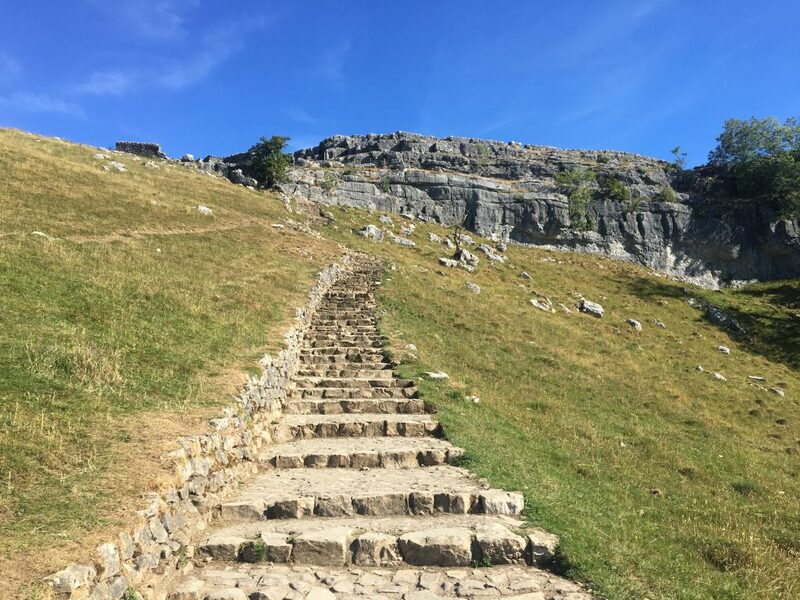 David was returning to Malham to walk what he had skipped over the day before, and I would be continuing from Horton. After breakfast and a final rearranging of things in our packs, we said goodbye. Part of me was sad that I was leaving another friend, and to not know if I would see him again; the other part could feel that familiar thrill of the great unknown, that unparalleled freedom of heading into it alone. It was perfect. Just a single walking pole, but exactly what I needed. When I go on these long walks, I typically look for wooden sticks as I’m hiking, and I’ve always found something. 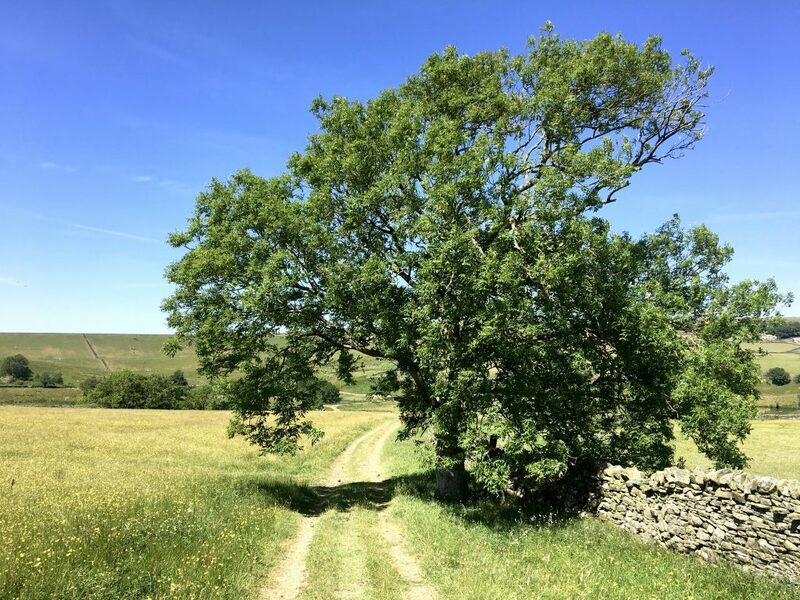 But I’d already been walking for 6 days and since the Pennine Way hadn’t passed through too many wooded areas, I hadn’t found anything suitable. So I headed out, alone, armed with a full pack and a walking pole. The path promptly headed out of the valley and into the hills, through a walled lane up to Jackdaw Hill and on to Cam End. The first mile was the steadiest climb, but afterwards the path flattened out a bit and the walking wasn’t difficult. My blister situation was also improving. There was still a tiny bit of pain but nothing like it had been just two days before, when I’d had to take a train and skip a portion of the walk. Today, I was finally starting to feel good. I walked on, and on. What is the story of the day? Maybe it’s just this: the walking. 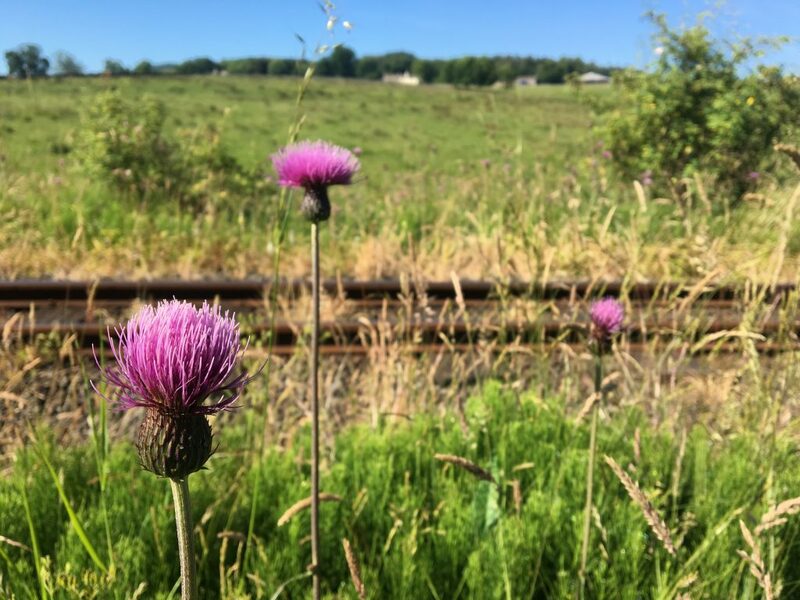 I was mostly alone, only passing two people coming from the opposite direction, who had started the Pennine Way in Kirk Yetholm and were walking south. They warned me about the lack of water at the northern end of the hike, but told me that the scenery was stunning. 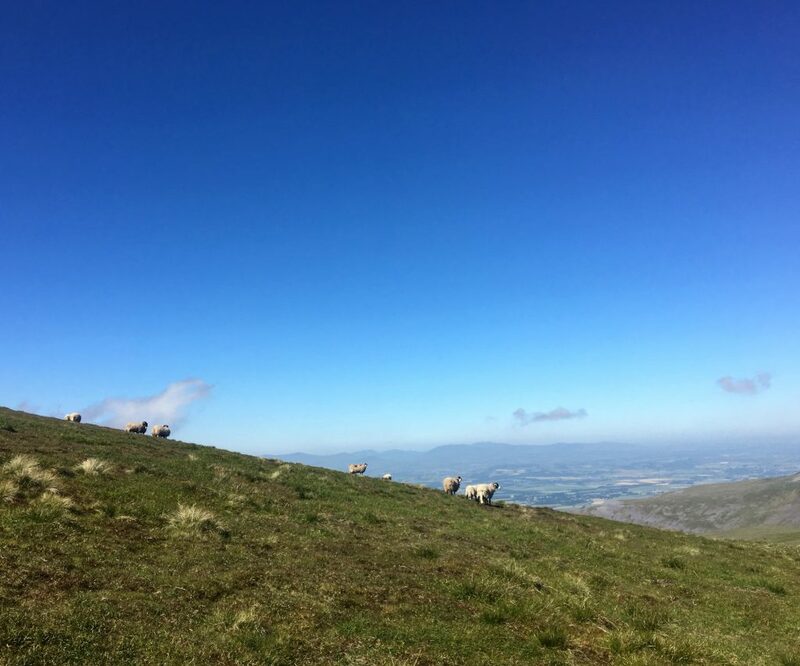 I walked and walked, sometimes listening to music, sometimes listening to the wind blow through the valley below, something listening to the soft baaing of the sheep in the fields beside me. 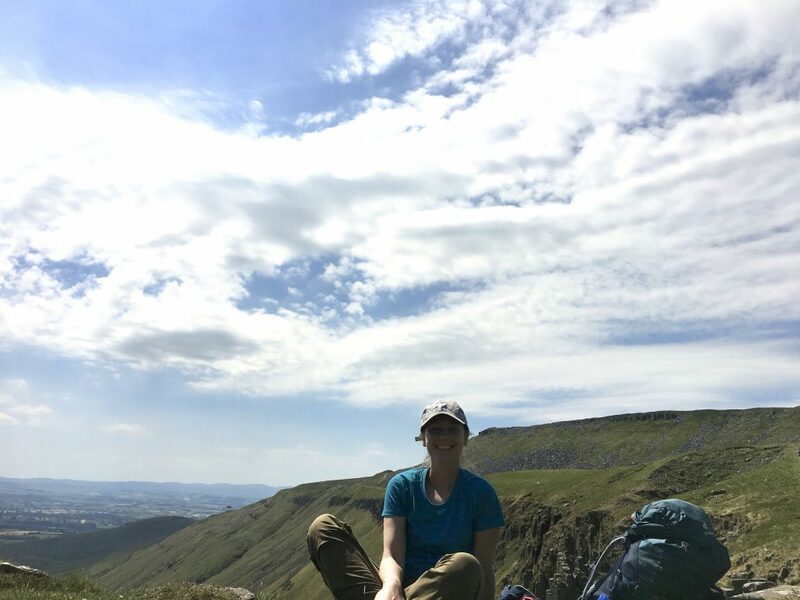 I was carrying a packed lunch that I’d ordered the night before, and eventually I found a flat rock lodged into a hillside with a sweeping view below and I settled down here: my pack at my side, my socks and shoes peeled off, my feet resting in grass, the warm sun on my back. I ate my sandwich and chips and apple and tucked the Twix bar away for later, and then laid down across the rock with my head against my pack. The weather was that perfect in between: not too hot, not too cold, and a soft wind blew against my face. “This is why I walk,” I thought to myself. That intimidating first day full of rain and wrong turns and numb fingers and aching feet felt very far away. Laying here on this warm and sunny rock, I felt so content, so strong, so sure of myself. The path continued, I continued. 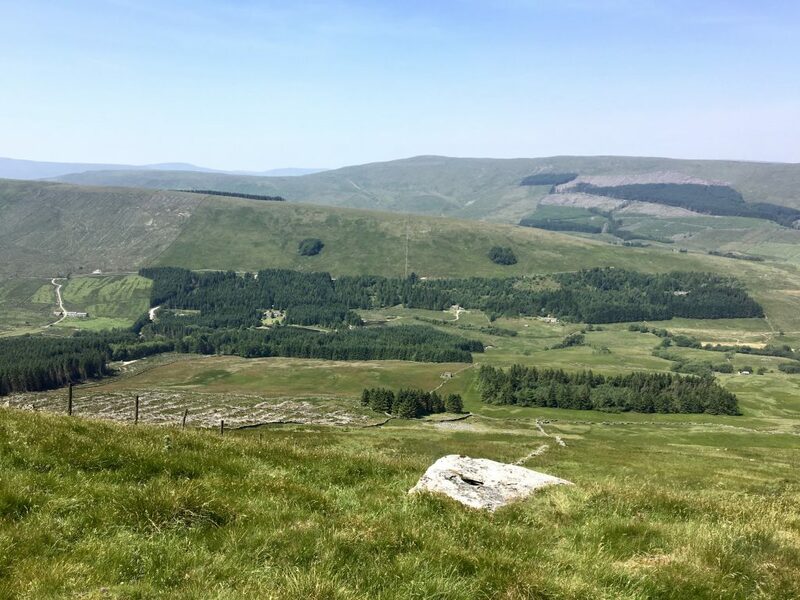 Gradually the route wound down into the valley and towards Hawes, an old English town that holds a weekly market. As luck would have it, I was passing through on the day of the market! I wasn’t staying in Hawes- I would be continuing another mile and a half to Hawdraw- but I stopped anyway to take care of some errands. 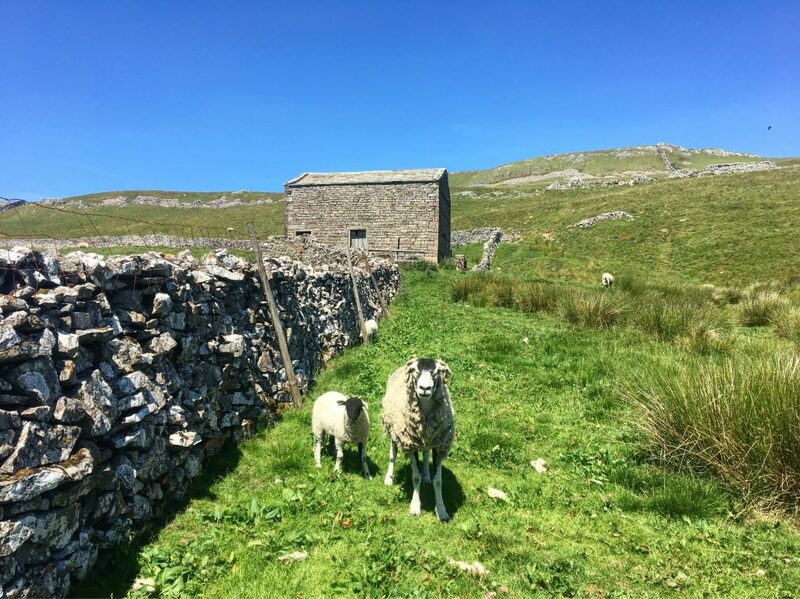 I didn’t regret my idyllic lunch on the hillside, and I was arriving in Hawes a little too late for lunchtime anyway, but the smell of the fish and chips shops was tantalizing. 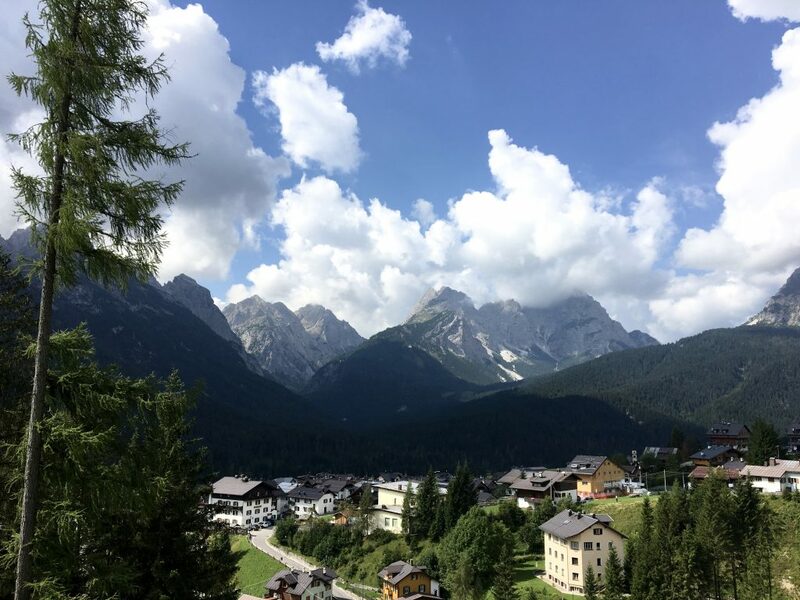 I contented myself instead with walking up and down the street and listening to the bustle, weaving in and out of villagers and tourists, carefully not to bump into anyone or anything with my large pack. There was a grocery where I stopped to pick up a few supplies, most importantly a new tube of sunscreen (of all the things that I didn’t think I would be needing to restock on! But with the sun shining strongly every day and the coming forecast showing more of the same, I was worried about running out). While waiting in line, a man who must have been in his 70’s started talking to me, and asked if I was walking the Pennine Way. 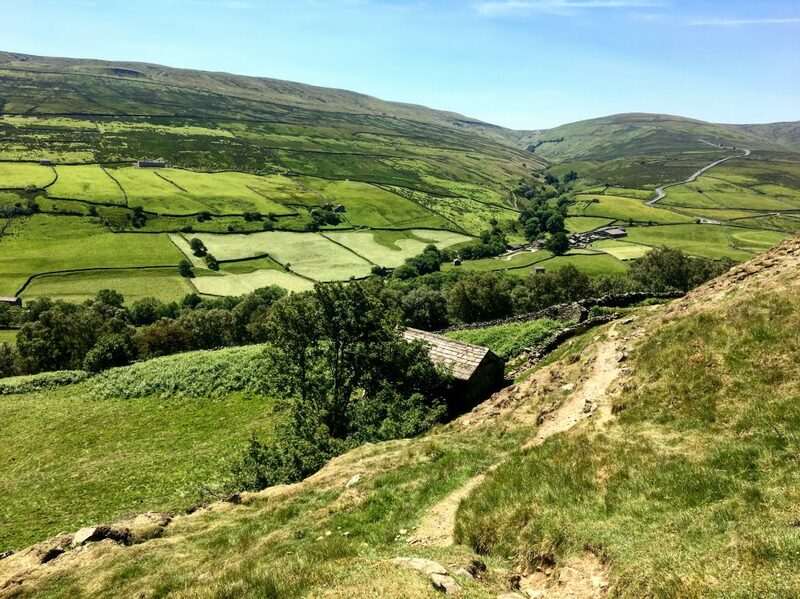 I asked if he could remember what his favorite part of the walk was, and he told me it was Swaledale, an area I would be walking through the next day. Before I left town I stopped for an ice cream cone, and ate it on a bench in the shade. The remaining walk to Hawdraw was easy and short. I was staying in the bunkhouse of the Green Dragon Inn, but I was beginning to learn that no two bunkhouses are the same. This particular one was connected to the Inn and the pub, down a series of hallways and up a staircase and I worried that I would never be able to find my way back out. And the bunkhouse was more like the floor of an old hotel, or motel, or a dormitory. There was a long hallway lined with doors that led into separate rooms, presumably all holding bunkbeds. In keeping with the trend of the trip, I was totally alone up there: alone in my room and alone on the floor. There was a tiny kitchen that was cramped and not exactly clean, but I gladly put some cheese and fruit into the fridge. My room was clean and the bunk bed was comfortable, and the shower had hot water so there wasn’t much more I could have asked for. Dinner was in the pub downstairs (after a few false starts, I eventually found my way back); I drank a beer and ate a huge meal in what was probably my favorite pub of the trip (the building dates back to the 13th century!). 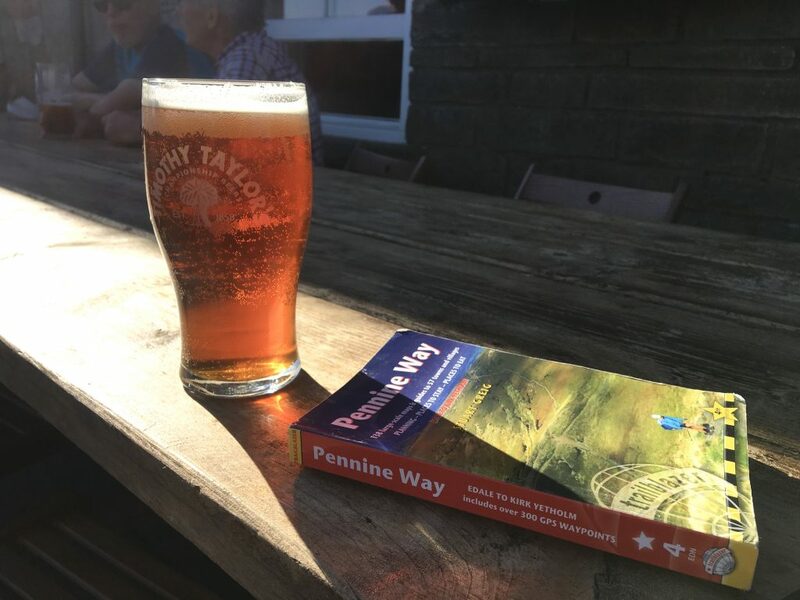 There were no other Pennine Way walkers- none that I could see in any case- and the patrons of the pubs seemed to be either locals or tourists just passing through. But I didn’t mind the quiet evening, and after dinner I went back to my room to read a little (you guessed it!) Jane Eyre. I was nearly halfway through my walk, and I was just beginning to feel like I was ‘getting it’. Getting into the rhythm of the walking, the rhythm of the way. I was starting to learn what to expect, I was settling into it all, feeling comfortable, feeling rooted. Beginning to feel like part of something. 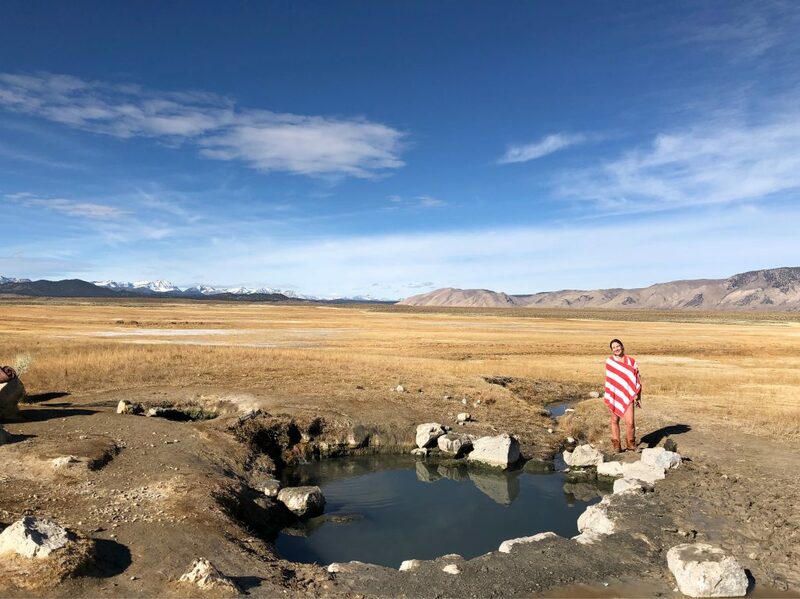 With the end of the year rapidly approaching, I thought it would be fun to write a little round-up of favorite travel moments from 2018. 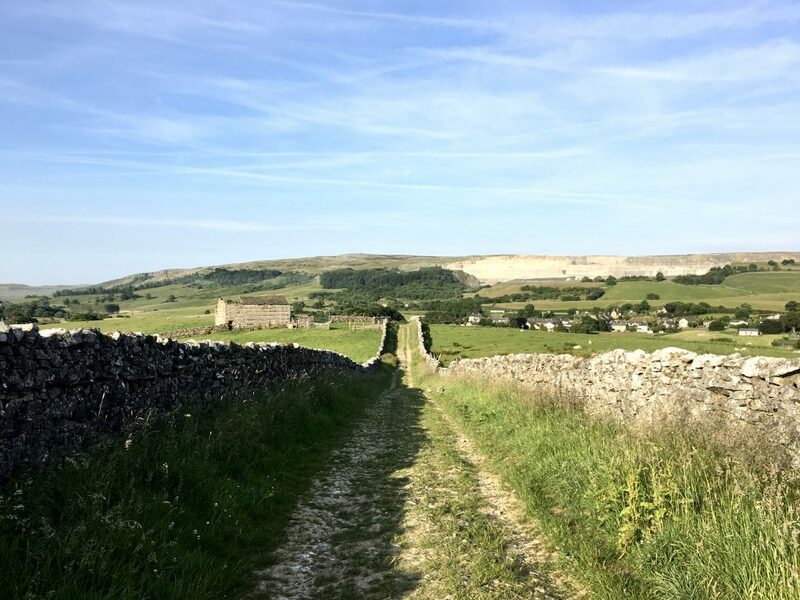 As regular readers are well aware, I’m still in the thick of posting about my Pennine Way adventure from June/July, and as a result, haven’t mentioned much (if anything!) of other travels. So this post will give you a little taste of some of the other things I’ve been up to, as well as give me a chance to dive deep back into those memories. I really loved the travel experiences I had in 2018; for the majority of the year I’m home and working, and my days are very routined. But for a few months in the summer and a few weeks scattered here and there throughout the year, I’m able to plan trips and small adventures, and this year had a good balance. Some new places, a return to some familiar places. Time walking, time writing, time exploring. Time with family and friends, time alone. In early January (almost a full year ago now! ), I traveled with some friends to see two other friends get married in the mountains near Bishop, CA. 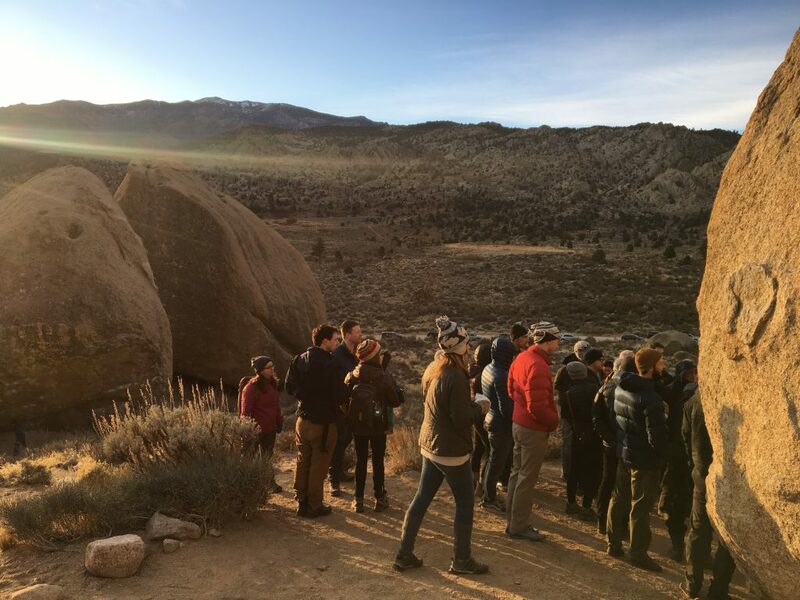 The couple are both avid rock climbers and they chose to have a sunrise ceremony underneath a boulder in the Buttermilks. I’ve never been to that part of California or ever been in a such a landscape, and it was incredible. Soft golden light and long shadows and sandy paths and massive, smooth boulders and a beautiful wedding. There were so many other, little parts of this trip that I adored: staying up until 4am with a friend who drove in to hangout for a night/morning, driving past Lake Tahoe and stopping for photos and to marvel at the huge pinecones, taking a call from my mechanic moments after I climbed out of a natural hot spring (my car broke down the morning of my flight out to CA, of course), my friend and I being rather overdressed for the wedding reception (“But the invitation said sequins! And cocktail attire!”), winning about $40 at the slots in Reno and Vegas (the only time I’ve ever played a slot machine; I’ll take it!). In mid-April, I drove out to Cleveland to visit my sister and to attend the Rock & Roll Hall of Fame Induction Ceremony. It’s the second time I’ve been to an Induction Ceremony and both experiences have been fabulous, and leave me remembering just why I love music. I wasn’t a huge fan of any of the inductees, though The Cars, The Moody Blues and The Dire Straights were all bands whose music I’d connected to at some point in my life. And without a doubt, The Cars were the highlight of the show. My sister and I listened to some of their music in the days leading up to the show, and I read about the band, hoping to learn a little before we saw them perform. “Ben Orr died sometime in the early 2000’s,” my sister told me. Along with Ric Ocasek, Orr sang vocals on many of the band’s hit songs, including “Drive”, my favorite. One thing led to another, and on the day following the Induction Ceremony, my sister and I found ourselves driving out to the cemetery where Orr is buried. When we learned that it was only about an hour away from Cleveland, it seemed like a no-brainer. 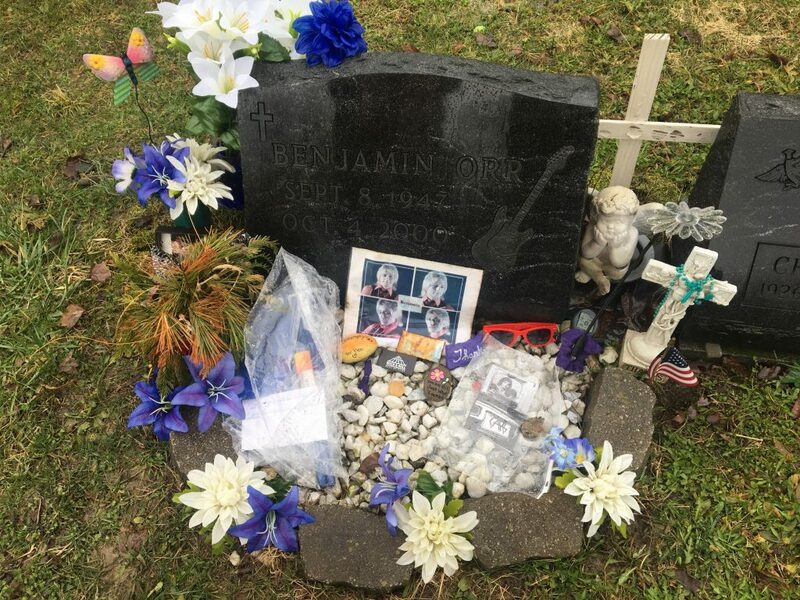 We listened to The Cars’ music on the drive and then stood in the rain in the small cemetery, and studied the mementos and notes left by other fans in front of Orr’s gravesite. I can’t claim to be a true fan, of either Ben Orr or The Cars, but this is what I love about travel. It gives you the opportunity to experience new things and it opens your mind to possibilities, it lets you make connections and it takes you down roads you might never have known existed at all. I let the lyrics of “Drive” run through mind, and remembered the times that song played out in my own life, who I was in those moments and who I was in that moment, standing in a cemetery in the rain. 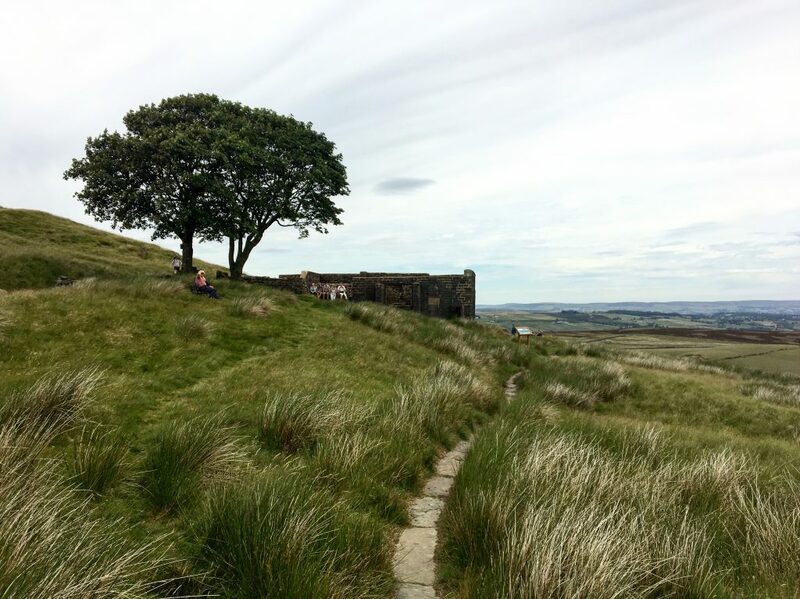 There was a lot I loved about the Pennine Way, but I think the best part might have been my decision to buy a copy of Jane Eyre when I stopped in Haworth. I’ve written about that part already, but I should say here that I never regretted the extra weight of that book in my pack. Every night I would read a chapter or two, tucked in my sleep sac, often in a bunk bed in a large and empty room. 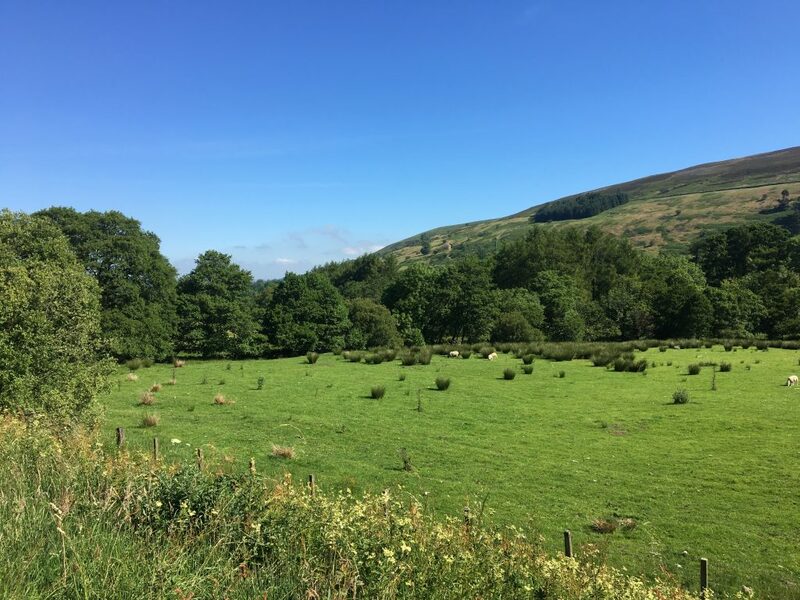 Sometimes I sipped a mug of tea and I nearly always had a package of ginger biscuits and there was something so satisfying and comforting about reading that book as I walked through the countrysides and moorlands and hills and mountains of the Pennine Way. I was alone for so much of my walk, but I never felt lonely. Jane became, in a way, a companion to me, I could almost imagine myself as one of the characters in a Brontë novel. 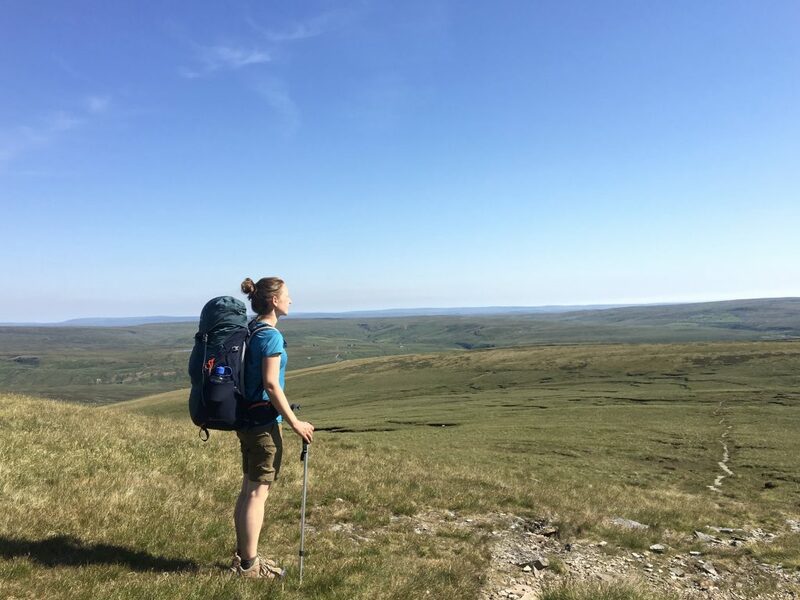 And if not a character in a novel, then a very real woman walking through landscapes in the footsteps of women who have walked those landscapes long before. What an unexpected highlight of my time at my writer’s retreat in southern France! This was the 4th time I’d been to La Muse, and I pretty much knew what to expect. I knew my room and favorite shelves for my food in the kitchen, and I even had learned how to shop for a week’s worth of groceries and where everything was located in the massive Carrefour store. I knew the walking trails and the hills and some of the villagers and most of the village dogs, and I even knew some of the other residents. I already had my routines, the patterns of my days, and I didn’t think that this visit would bring many- or any- new experiences. 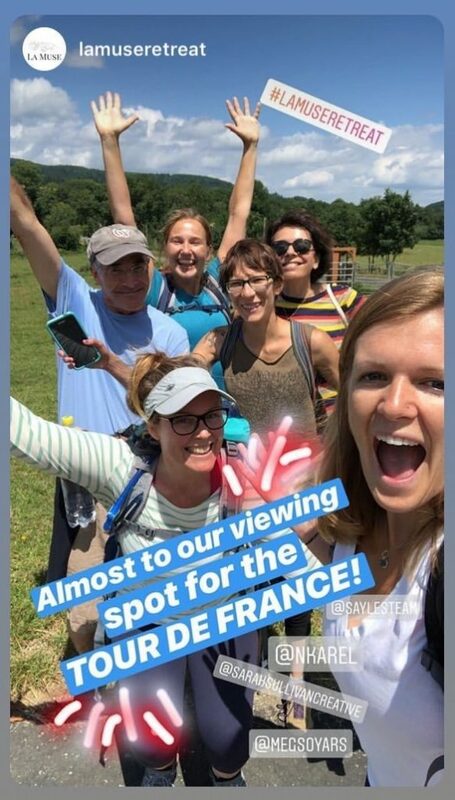 But then one day a few of us ran into the mayor of Labastide, and he told us that one of the stages of the Tour de France would be passing very close to the village. I did some research; I pulled out my computer and a large map of the area and plotted how we could get there; a few days later the mayor took me and a couple others in his car to scout out our walking path. (This tiny road trip was another highlight; Régis, the mayor, is in his 80’s and barely speaks a word of English. He is kind, regal. Tall, with bright blue eyes and long fingers. He drove us all over the mountains that afternoon, taking us up to the Pic de Nore, the highest point in the Montagne Noire, and then to the lake, where he bought us beers and we sat around a table and drank in the summer sunshine). On Tour de France day, six of us walked from La Muse to the nearest road of that day’s stage. The trip was about 7km and the weather couldn’t have been better: blue skies and temperatures in the mid-70’s. We brought lots of water and snacks and found a spot on the grass to camp out for the afternoon. 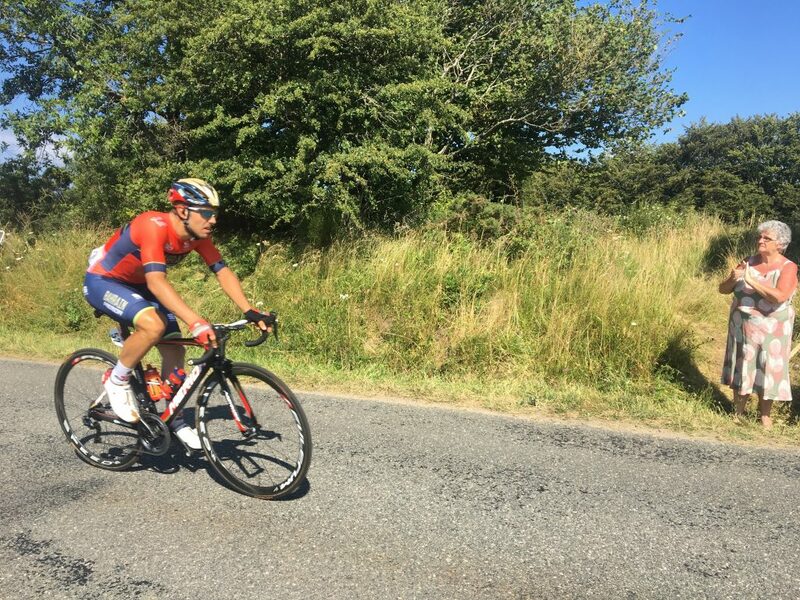 We all felt kind of giddy, none of us could believe that we would get to experience part of the Tour de France. About an hour before the riders cycled past, we got to experience something called ‘the caravan’: dozens of vehicles drove by, many outfitted with characters or people in costumes or colorful banners and signs, and each one had several people tossing out swag. Biscuits and gummy candies and small packets of laundry detergent and shopping bags and hats and magnets and juice boxes. We were thrilled, but then again, the experience was thrilling. There was nothing contained or regulated about the caravan: the vehicles sped past, there were no barriers and sometimes it felt as though there were only inches between the spectators lining the sides of the road and the vans or trucks speeding by. The people with the swag didn’t toss the items gently into the air, but rather, they hurled these things down at the ground as hard as they could. There would be a manic scrambling for these items, children and grandmothers got into the action, everyone fighting for their prize. Maybe the caravan knows what it’s doing, because by the time the Tour de France cyclists came through, we were cheering and yelling like everyone else, like we’d always done this. The cyclists were gone within minutes- we were standing on a downhill section- but it didn’t matter. We clapped and cheered and walked home with great smiles on our faces. 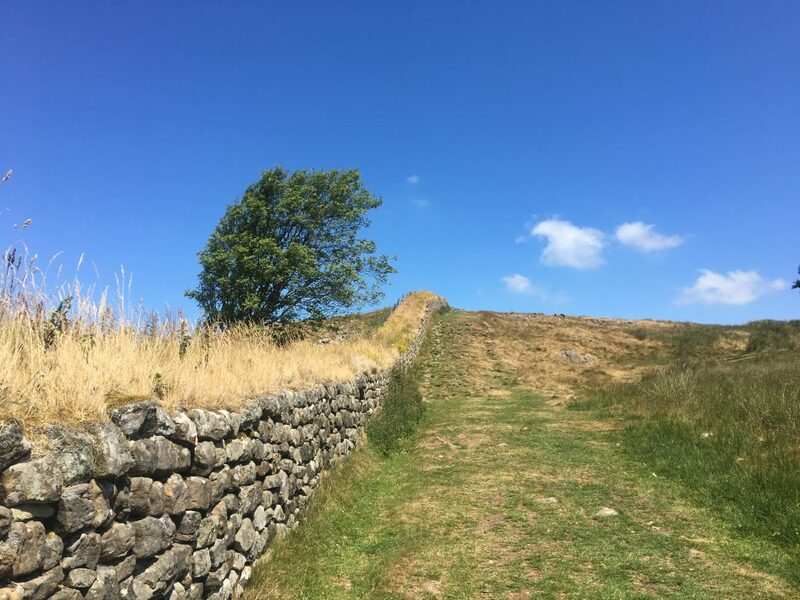 After my writer’s retreat I had three free days, and since I was in an area of France not far from where I’d stopped walking the Chemin du Puy the year before, I decided to walk a few more days of the pilgrimage route. I left La Muse on a Tuesday morning, took a train ride to Cahors, and was on the Chemin by noon. 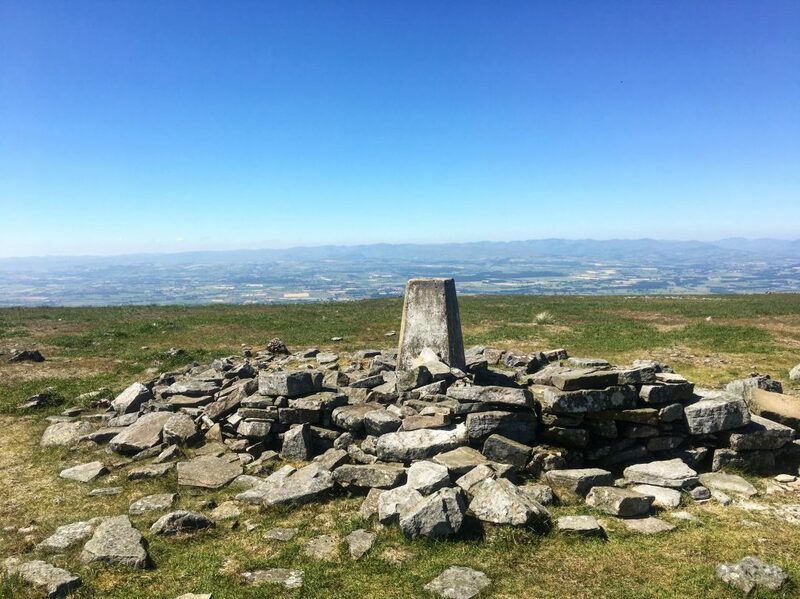 If I can ever finish writing about the Pennine Way, I’d love to tell you about my three days on Le Puy; after 20 minutes of walking that first day I thought I might have to quit- my pack might have been 50 pounds (seriously) and I was walking through a heat wave and I was seriously questioning the decision to do this tiny part of a pilgrimage. But, as it is with nearly any Camino, I was so happy I’d gone. 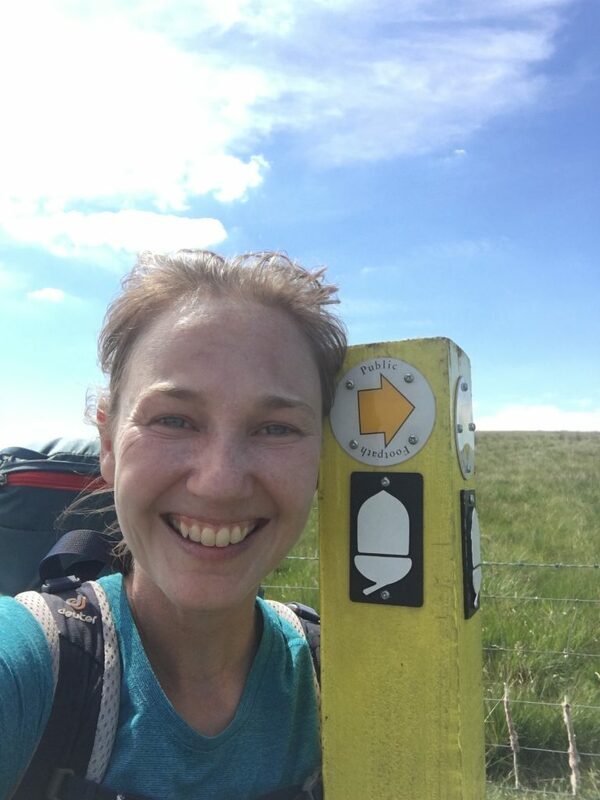 I still can’t believe how much life I fit into those three days, and it was incredible that I could drop into the middle of a pilgrimage route, be there for only moments, but still experience some of the magic of the Camino. One of these moments of magic was on the second day of walking. I’d stopped for a break at a picnic table outside of a small chapel, and was just finishing some plums that I’d bought from a man at the side of the road a few kilometers earlier, when I saw a car drive up. 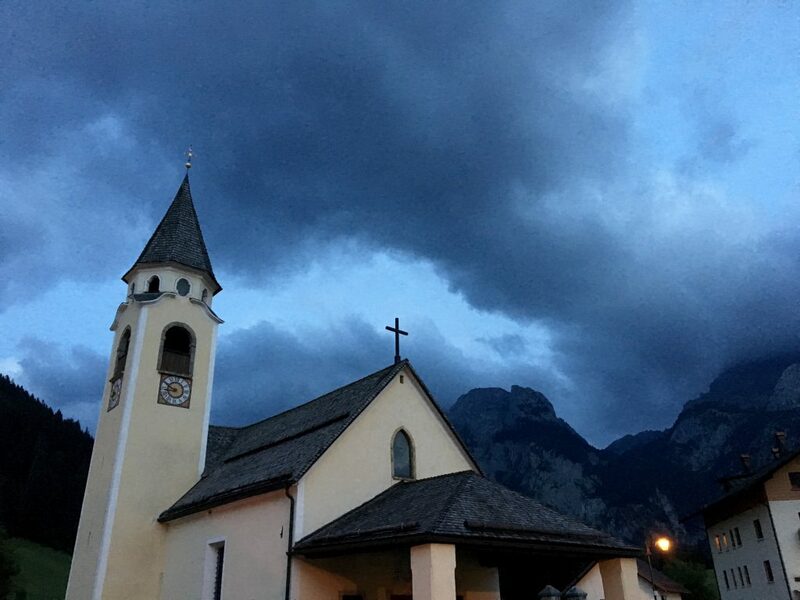 A middle-aged woman jumped out of the car and walked briskly into the chapel. I didn’t give her much thought until a few minutes later, when I heard a clear, bright voice singing Ave Maria. I walked into the chapel, slowly, and took a seat in one of the pews in the back. The woman was standing in the altar, her arms stretched out, her hands gripping the edges of a large stone slab. She finished Ave Maria and began another song, and when she finished this second one, she stood still for a moment, and then turned around and walked away quickly. I heard her car door slam shut and an engine start and she was gone before I could even think about what I’d just heard. It happened so fast, it was almost as if I’d never heard it at all. After the Chemin, I spent the last few days of my summer trip in Italy, with a friend I’d met on my first Camino. 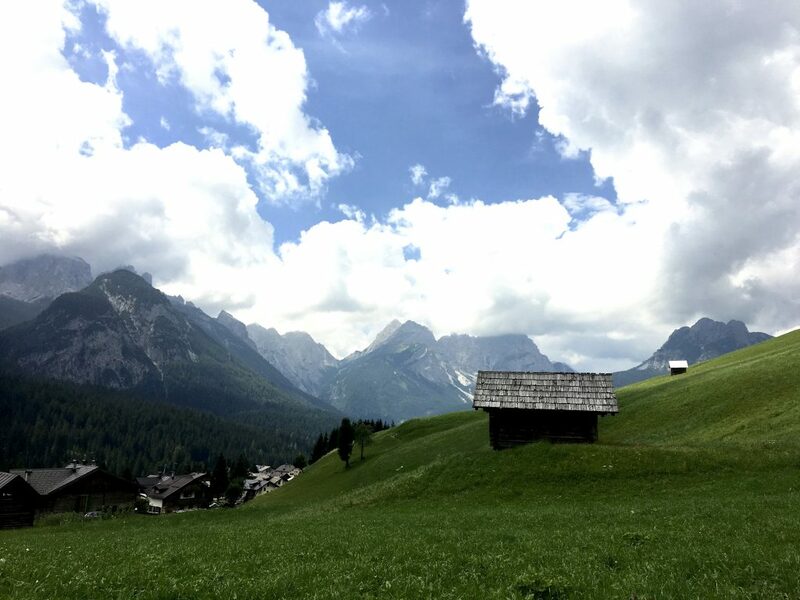 He was working in Sappada, a small town in the Dolomites, and I spent several wonderful days doing nothing but hiking and writing and eating pasta and drinking a lot of espresso. “Hmm,” I replied, a little absentmindedly. I was only half-listening, my attention diverted to the dark, looming mountains surrounding us, the warm lights in the windows of the cottages, the cool evening air. But then I saw a shadow in the field to my left, and a moment later, a small fox trotted into the street in front of us. My friend and I froze as the fox walked straight towards us, and I swear that he looked into my eyes as he approached. When he was just before us he stopped, and turned his head to the side. It was then that I noticed a woman on the side of the road, holding out a large piece of meat. The fox walked over to her, slowly took the meat in its mouth, and then darted away, back into the black shadows of the field. I still don’t know how our timing could have been that perfect, and sometimes it feels to me as though we were meant to see the fox. Or, that it had wanted to see us. Maybe it was the mountains, the air, the feeling of a journey at its end, the unrealness of an encounter with a wild creature, a brush with magic. These are just a few of the things I got to do, the people I was with, and the places I saw in 2018. I think about the year ahead, how some things are planned but so much isn’t yet. Sitting here now, I can’t begin to imagine the kinds of experiences that 2019 will bring. I hope you all have had restful, peaceful and joyous ends to this year. And that the coming year will bring new opportunities, new hopes, new dreams, new walks, new relationships, new happiness. All my best, and I’ll be back with more soon. My sixth day of walking on the Pennine Way started with a solid breakfast in the YHA hostel. Toast and eggs and sausage and lots of coffee. I ate with Margaret, the northern Californian woman I’d met four days before (at this point it felt like weeks before! ), the one who had told me that she also went very off route on that first day of walking. Margaret was planning to walk to Horton that day, and we looked at our maps and guidebooks together. “This is going to be a really long day,” she said, pointing a finger at the elevation profile. 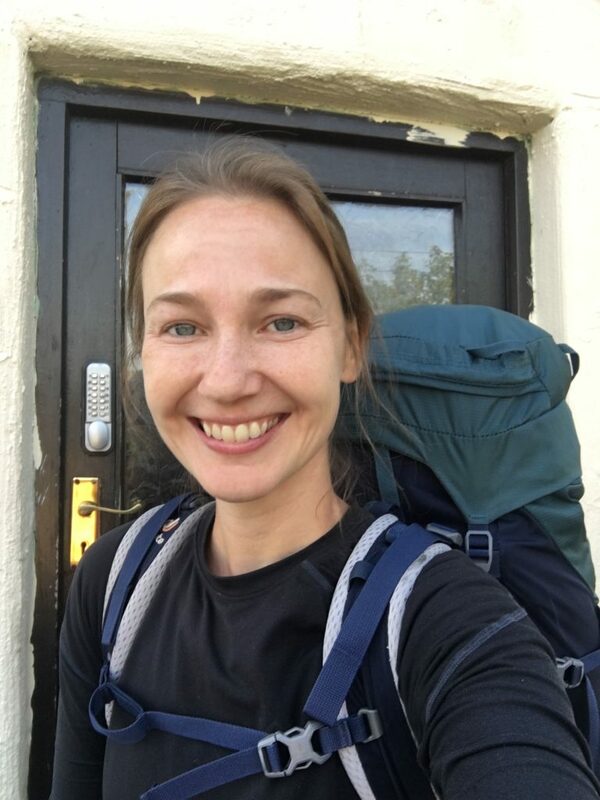 I slurped down a last sip of coffee and tied the laces of my shoes, and, after picking up the packed lunch I ordered the night before, was the first one out of the hostel. I’d gotten to breakfast as soon as they started serving food (here’s a pro tip for walkers who want to leave as early as possible but also take advantage of your lodging’s breakfast: arrive at breakfast about 10 minutes early, and often someone will come out and bring you coffee or tea, and get you started on toast. I’d found that breakfast could be a rather long, drawn-out affair if you let it, and sometimes that’s nice, but on long days I often wanted to get going as soon as possible). It was another gorgeous morning. 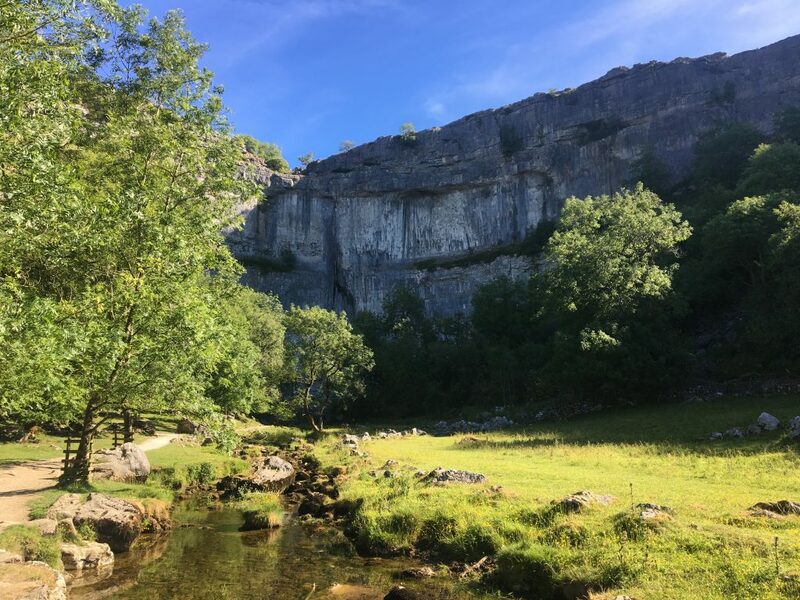 I walked away from the quaint village and almost immediately headed towards Malham Cove, a fantastic limestone amphitheater (and now home to peregrine falcons!). The light was soft and golden, the grass seemed to shine a beautiful green, white fluffy sheep wandered slowly through the fields and I was the only one around. What a feeling of peace! 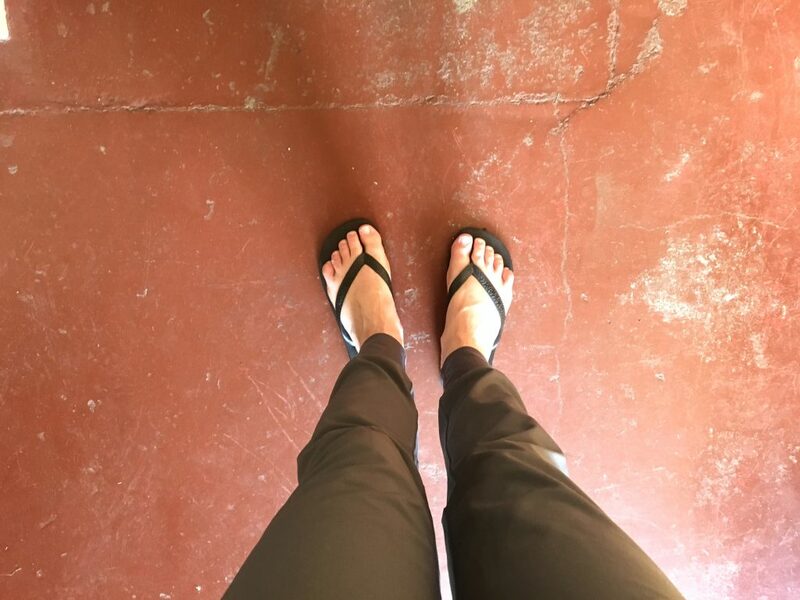 And for the first time, I noticed that my feet didn’t feel quite as bad. There was still a little pain from one of my blisters, but this was a noticeable change from the past several days. The realization put a grin on my face. Despite the difficulty of the day ahead, I might actually enjoy the walking! And then came the stairs. 421 of them. The stairs were endless! 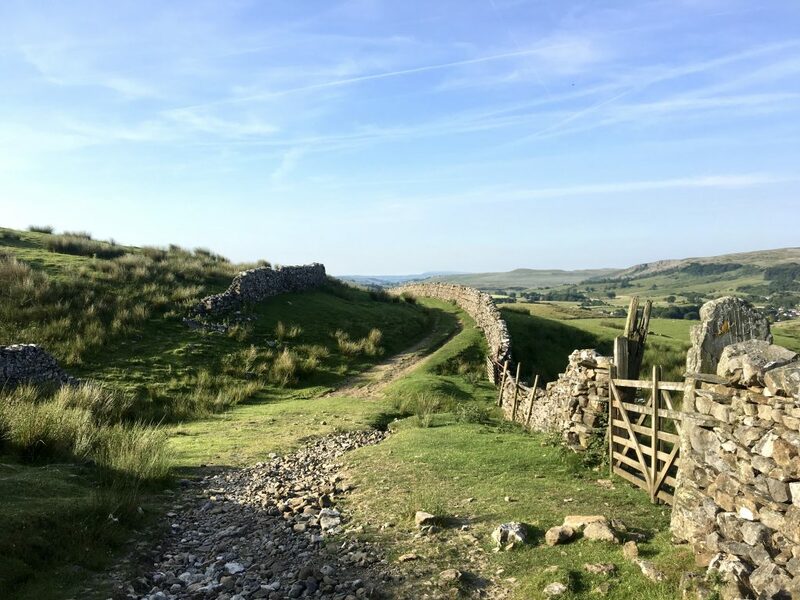 This is when my counting trick began (and really, it’s not a trick at all, just something I started doing on the Pennine Way to help me continue to move forward). I’d count my steps, 1-10, and as soon as I got to 10 I’d start back over at 1. The idea was that I couldn’t stop to rest or to catch my breath until I got to ’10’, but often when I arrived at ’10’ I decided to keep going for another 10. I certainly stopped- multiple times- as I climbed all of those stairs, but something about the marching repetition of the numbers pushed me forward. It became almost like a game. 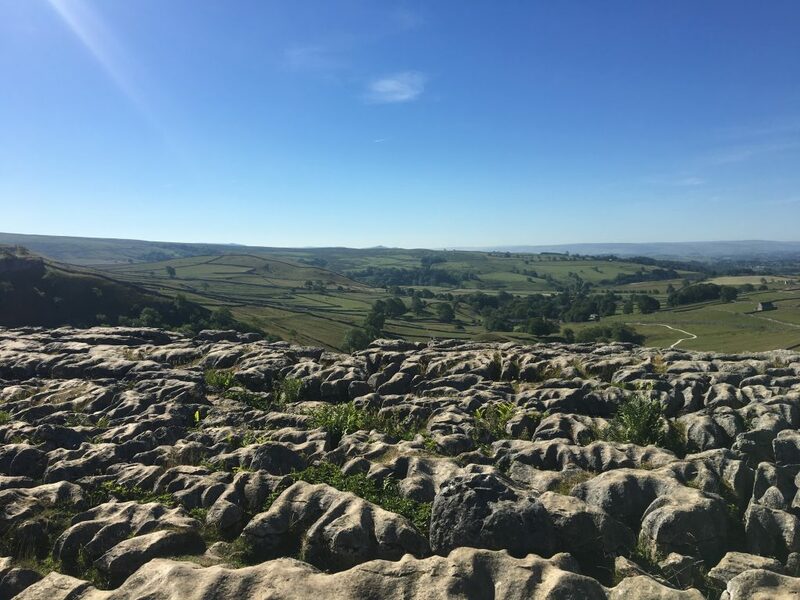 Before too long I was at the top, at the top of a field of limestone, large rocks that were smoothed and polished and shining in the sun. I hopped around the rocks for a bit, admired the views, and then looked around for the path. Where in the world was I supposed to go? When walking through fields, or the moors, the path is rather obvious. Sometimes it’s just barely visible, but if you stare at the ground long enough, you can usually find a path. But up here in the limestone any trace of a path was gone. There weren’t any signs, or arrows, and my guidebook was hopeless. Well, the guidebook referred to a path that was the wrong one, and indicated that I was to turn right at the top of the steps, but of course I somehow managed to think the wrong path was the right one and I climbed halfway up a rather steep hill before realizing that I must be going the wrong way. But, have no fear, I eventually figured things out, and breathed a small sigh of relief when I found a signpost. 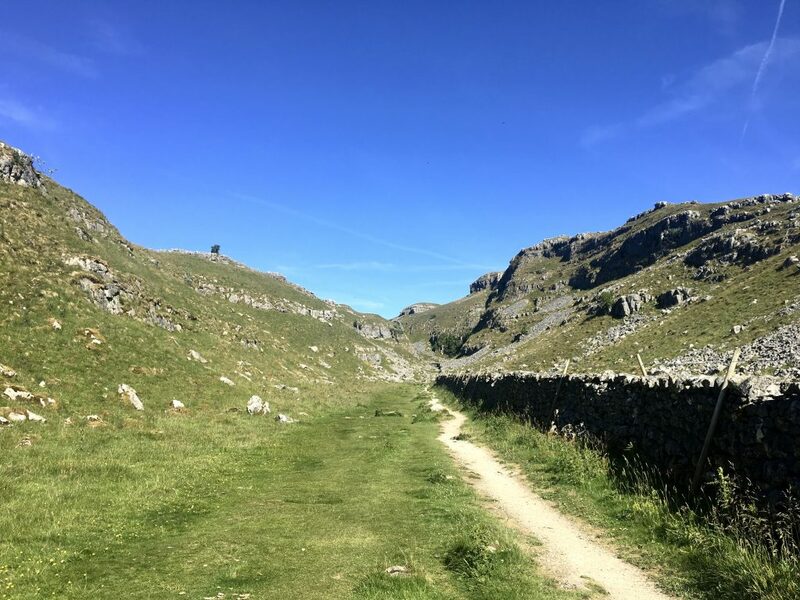 The path led through a narrow valley and I felt like I was the only person on earth (well, me and the sheep), and then there were another 150 stairs to climb to get out of the valley (of course there were), and then I arrived at a sign that pointed back to Malham, which was 1.5 miles away. All of that effort for a mile and a half! I adjusted my pack, settling it more firmly against my back, and continued on. 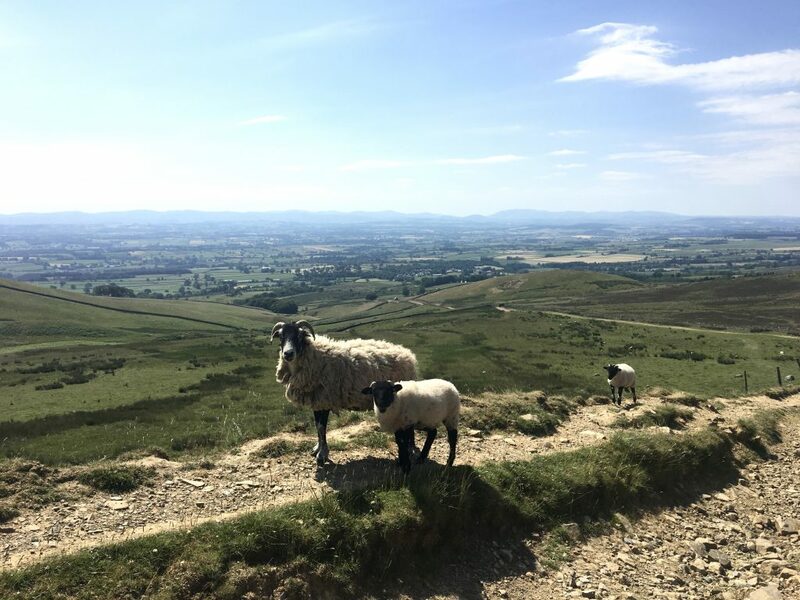 The rest of the day followed a similar pattern to those first few hours of my day: climbing, counting to ten with each step, expansive views, sheep and green fields and sunshine, more climbing, more counting steps, more beautiful views. 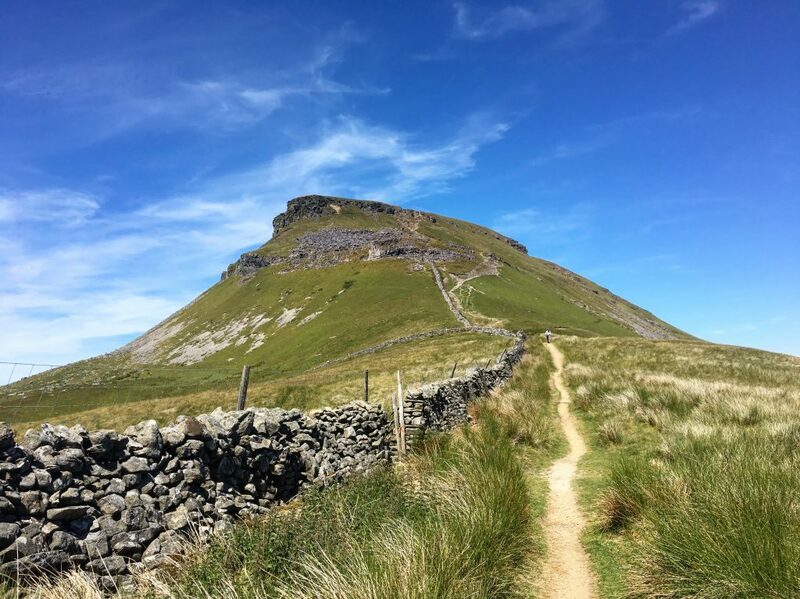 The last climb of the day was up Pen-y-Ghent, and as I stood at the base of the mountain, looking up at the little peak that I would have to pull myself over, I felt tired. It had been a really good day but, in hindsight, I think I was still getting my walking legs under me. I felt like I could keep walking on a flat path for miles and miles, but the 600 feet I would have to climb that was looming over me? That was a different story. I took a deep breath, and started. Before long I passed a man coming down in the opposite direction. He stopped and we chatted for a moment, and he reassured me that the climb wasn’t nearly as hard as it looked. “You’ll be up at the top in no time!” he said, and with a wave, he was off. 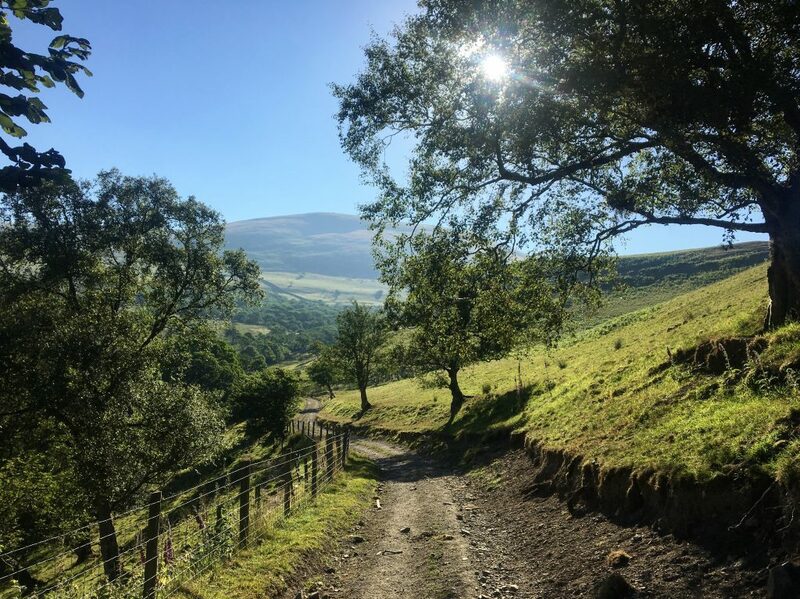 I used the old 1-10 counting trick to keep me moving up the mountain, and I stopped several times to take a video (it appears that most of the videos I took on the Pennine Way were when I was struggling. Hmm, maybe I needed something to distract myself with? A way to laugh at myself a little bit?). The man was right- the climb wasn’t quite as bad as it seemed, all except for the bit of scrambling at the top. 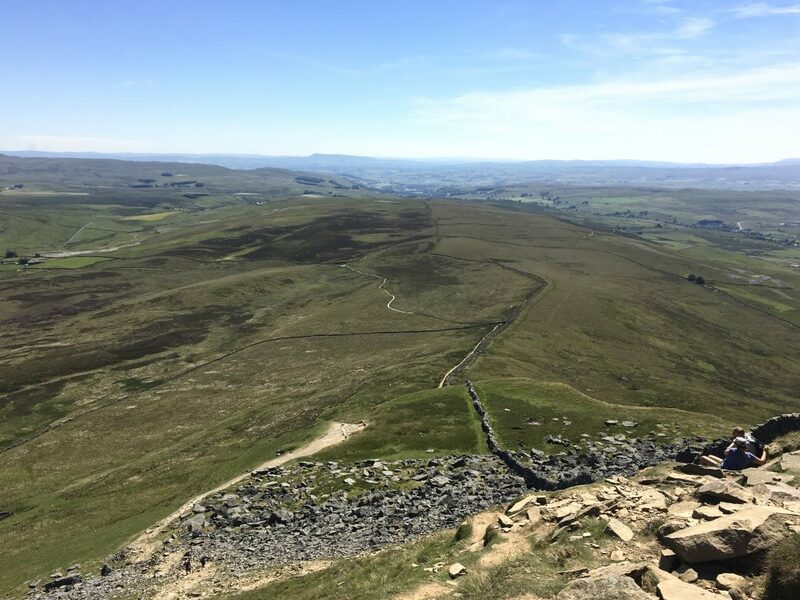 I’m not a big fan of needing to use my hands and arms to pull myself up over rocks when I’m hiking, though the scrambling at the top of Pen-y-Ghent was minimal and really not too difficult. I think the hardest part was the fact that I had a heavy pack strapped to my back, threatening, at times, to pull me backwards. But I made it! I was dripping with sweat and my face was beet red and as soon as I found a place to sit I threw down my pack and took off my shoes and peeled off my socks and gulped down as much water as I could (bonus points! Drinking water makes your pack lighter!). 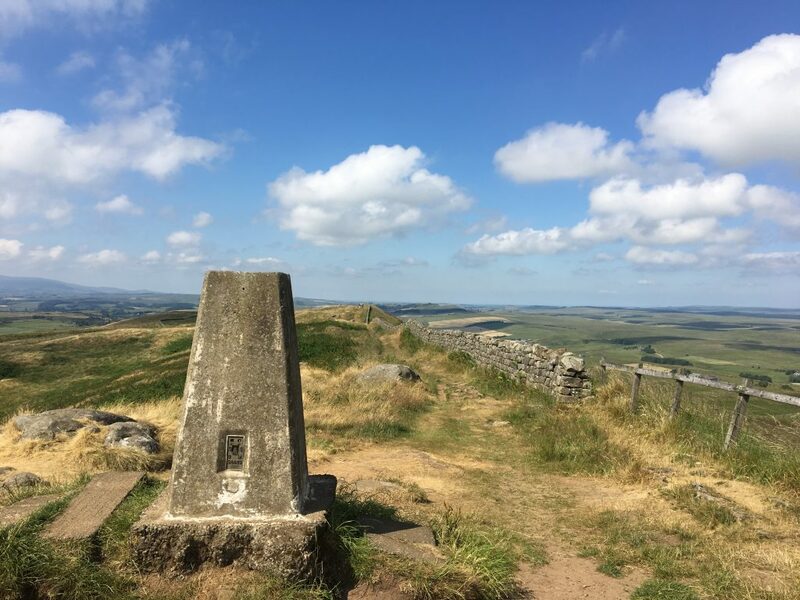 I sat on the summit for awhile, watching as people arrived at the top and took photos at the trig point. Everyone sprawled out on the grass, people and sheep mingled together in the bright sunlight. 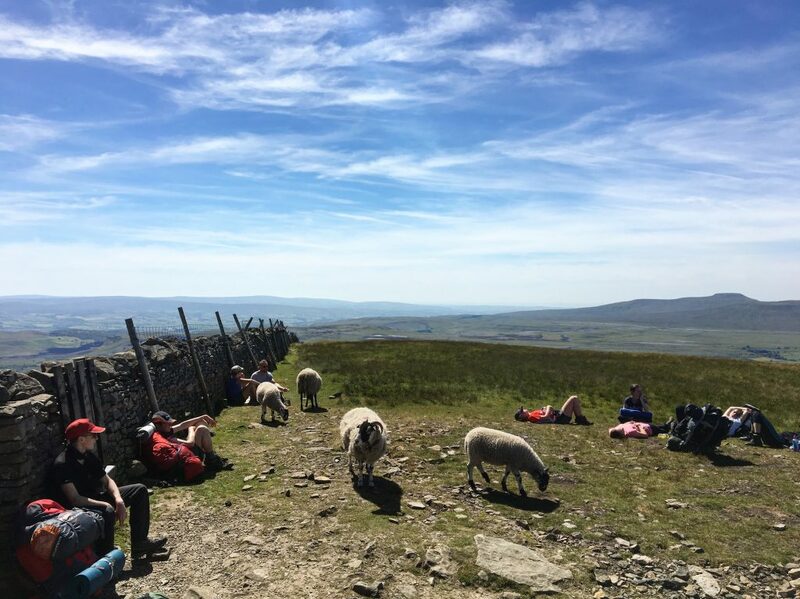 I didn’t recognize anyone up here; most, if not all, were day hikers, and were here to climb Pen-y-Ghent, rather than walk the whole Pennine Way. 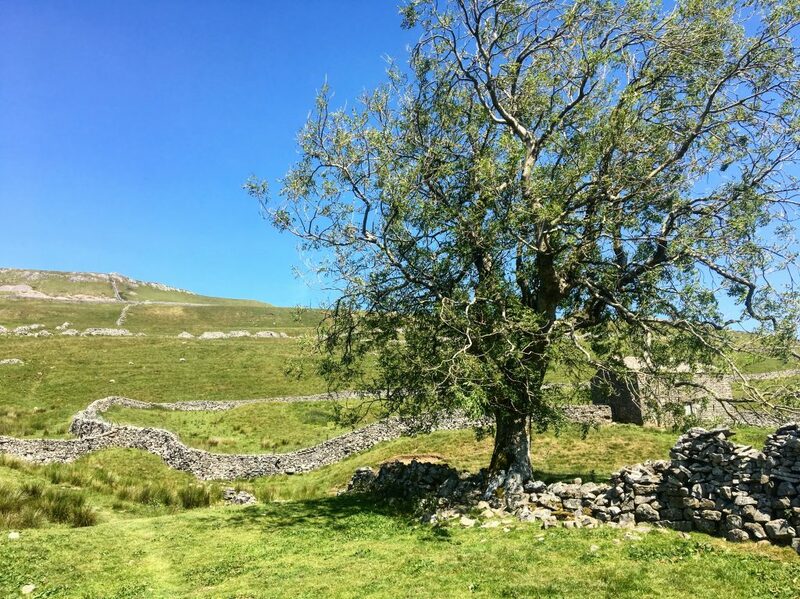 The rest of the way, to Horton-in-Ribblesdale, was all downhill, and it was mostly enjoyable walking, though under a very hot sun. I arrived in town tired but rather triumphant. Aside from the unexpected challenges of Day One, this was the most physically challenging day yet, and I’d done it! I headed straight for the “famed” Pen-y-Ghent café, a place that my guidebook describes in great and glorious detail. 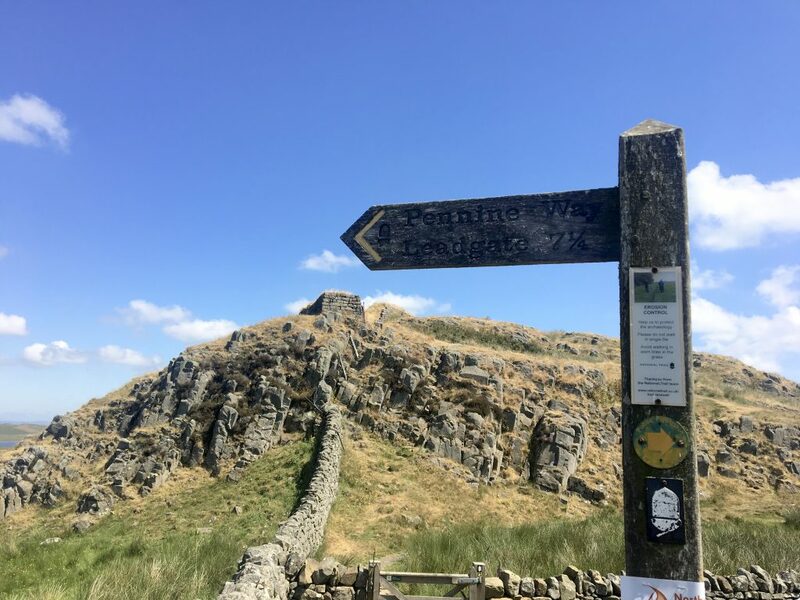 In addition to drinks and snacks, the café doubles as a tourist information center and sells camping gear and maps and generally provides a great service to Pennine Way walkers. 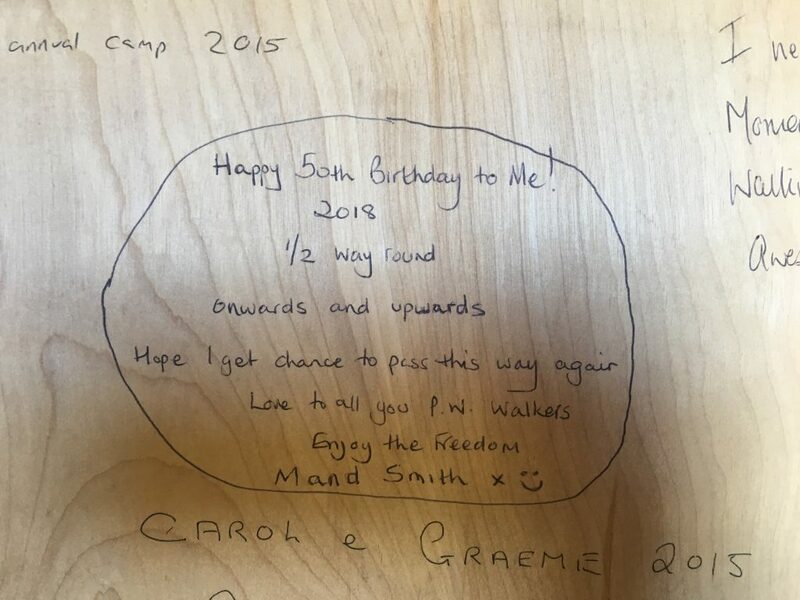 There are volumes upon volumes of “guestbooks” that Pennine Way walkers have been signing for years, and I was excited to add my name to the register. Unfortunately, the café was closed when I arrived! I’d made it in time- well before the 5:30 posted closing time- but it appeared that it had been closed all day. I peered through the dark windows for a minute, and then continued down the road to my lodging for the night, the bunk room of the Golden Lion Hotel. I checked in at the pub of the hotel and was given a tour of the bunkhouse, which I would have all to myself. There were triple bunks but by now the novelty has faded a bit, and instead of climbing uncertainly to the very top, I unrolled my sleeping bag on one of the bottom bunks. 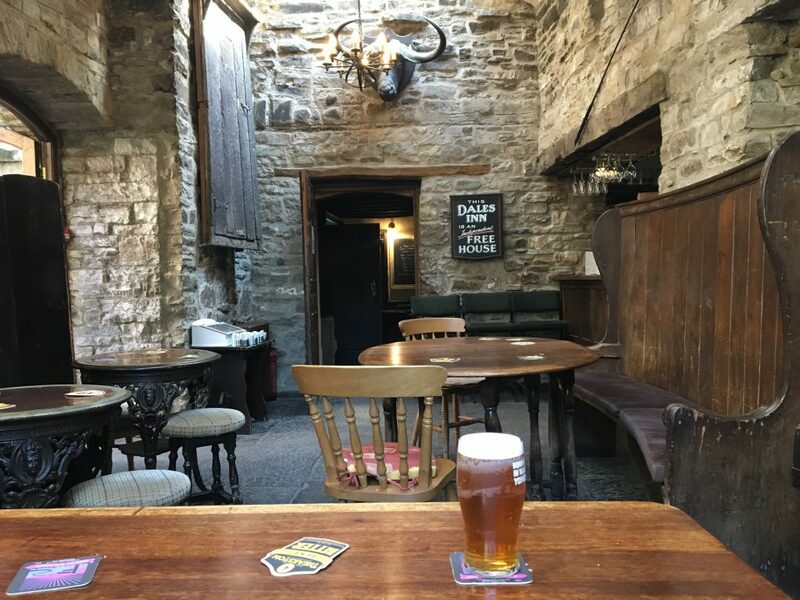 After I took a shower and rinsed out my clothes from the day, I headed out of the bunkhouse to see about getting a drink in the pub. But as soon as I walked out the door of the bunkhouse I ran straight into David, my friend from the first day of the walk! We stared at each other and started to laugh. “What are you doing here?” I asked, a great smile on my face. David was staying in the hotel that night, along with his nephew, who had driven out to meet him for the evening. The three of us gathered in the pub for a drink and stayed through a long and lingering dinner, talking about the last few days. David had several adventures since I’d last seen him- wild camping at the base of Stoodley Pike, wandering off route for miles around one of the reservoirs- and he was behind schedule. She looked at us with wide eyes. 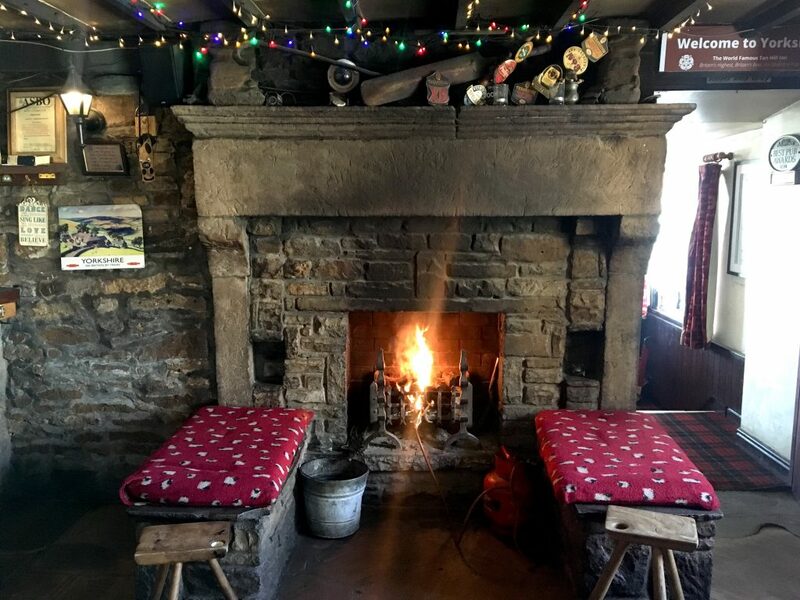 “That walk took longer, much, much longer, than I thought it would.” David bought her a drink and we told more stories and for what I suspected might be the last time, I sat around a table in a pub with my little Pennine Way family. They were people I’d only known for a few days, but who had nearly instantly become friends, comrades of sorts. I truly love undertaking these walks alone, and continuing to walk alone. 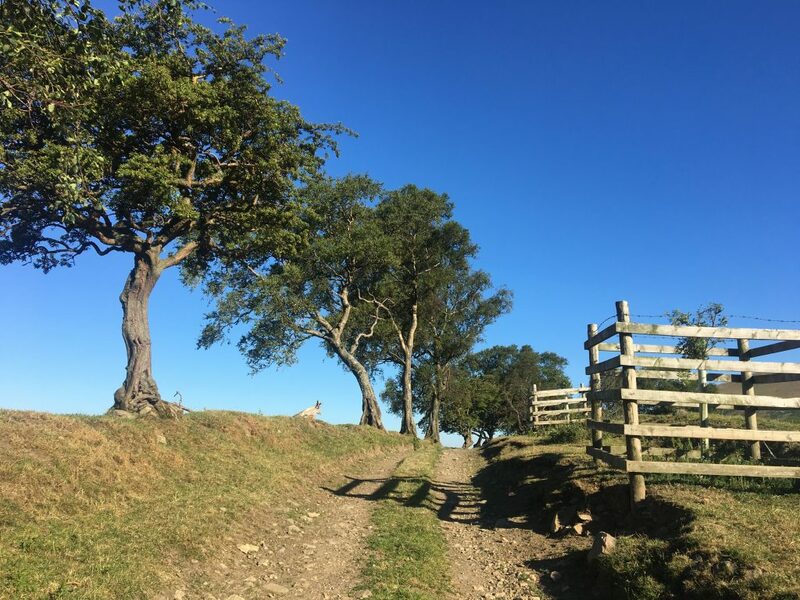 The sense of isolation and solitude and freedom give me such an expansive, open feeling; I feel a deep sense of myself, my truest self, when I am out alone on the moors, or on a hillside, or scrambling up a mountain. I love being alone, but there’s also something about this: a tableful of people who cheer for me and support me and understand what it means to be on this particular journey. I know that their footsteps are ahead of me or just behind me, and that knowledge brings me such comfort. Charlie was out there somewhere, and so were Nigel and Judy. That night I would say goodbye to David and Margaret and I wouldn’t see either of them again, but it was okay. We were all part of the same walk. 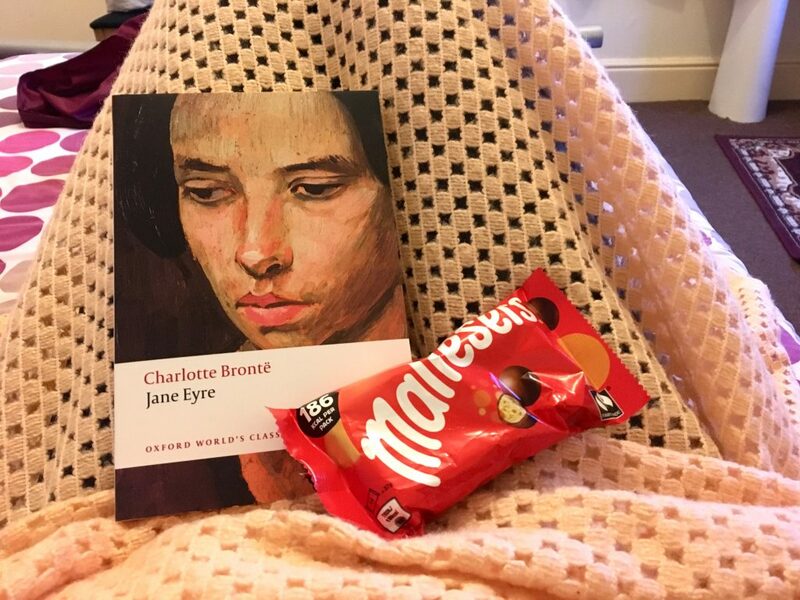 Up in my room I crawled into my bunk and read a few chapters of Jane Eyre and ate ginger biscuits, wiping the crumbs from the mattress. The bunkroom was empty, but I didn’t feel alone. I doubted that I would ever feel truly alone on this journey.